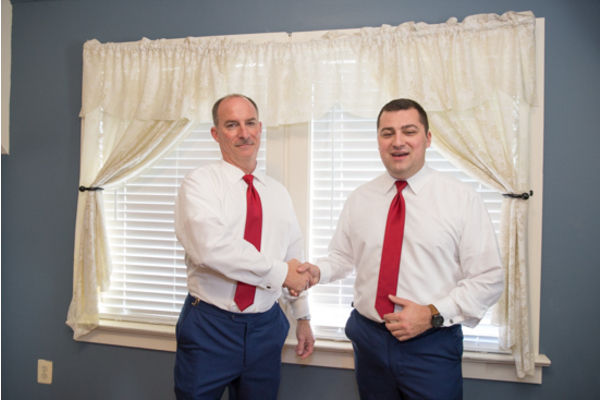 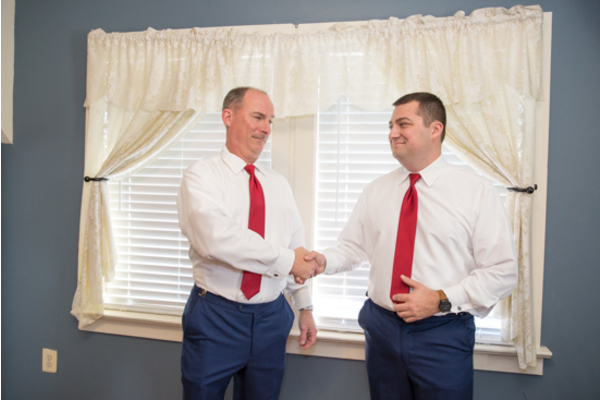 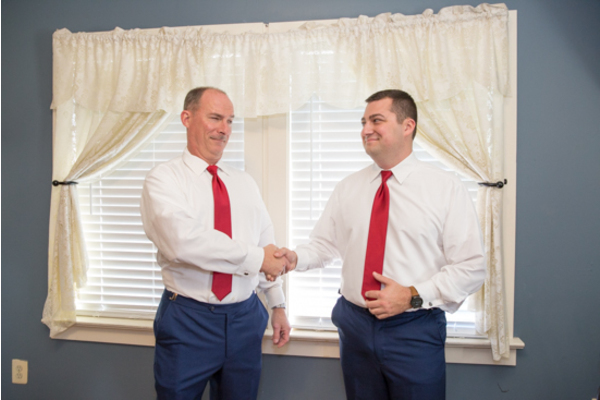 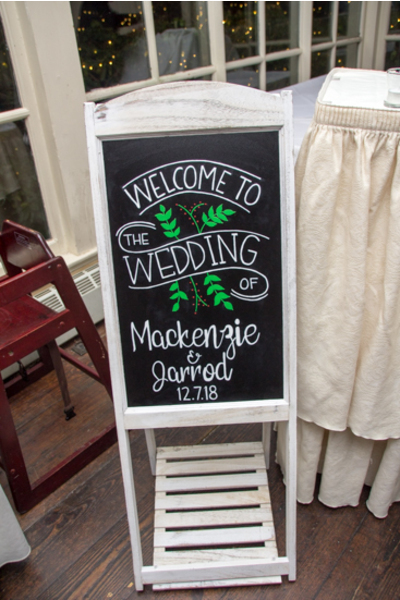 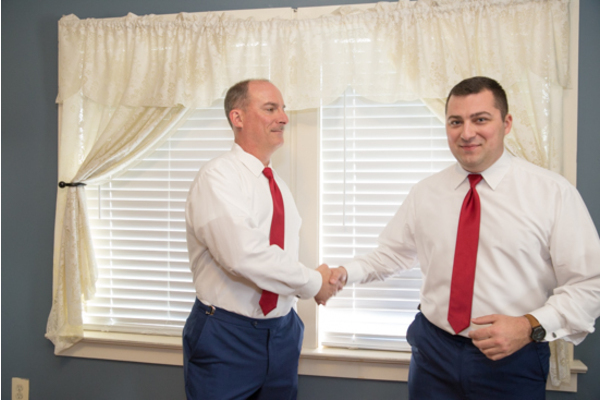 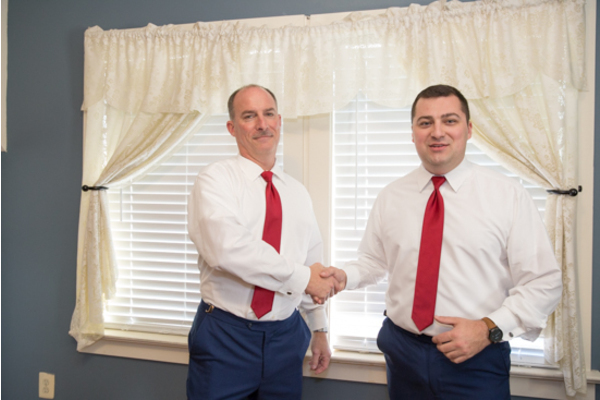 Congratulations to Mackenzie and Jarrod on their recent marriage! 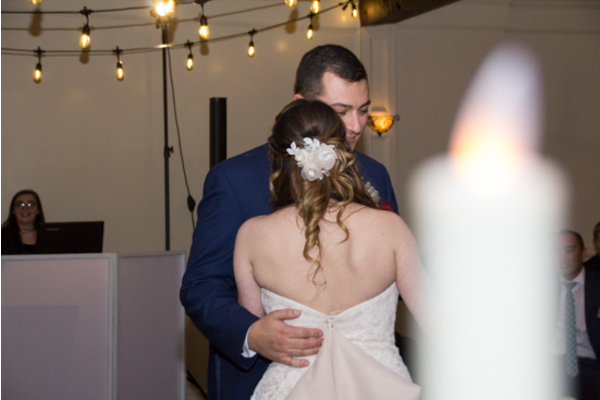 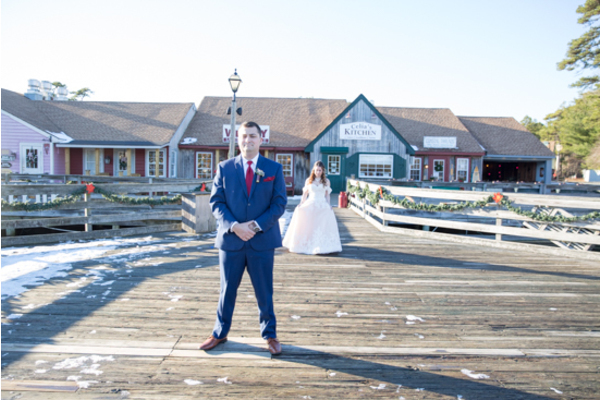 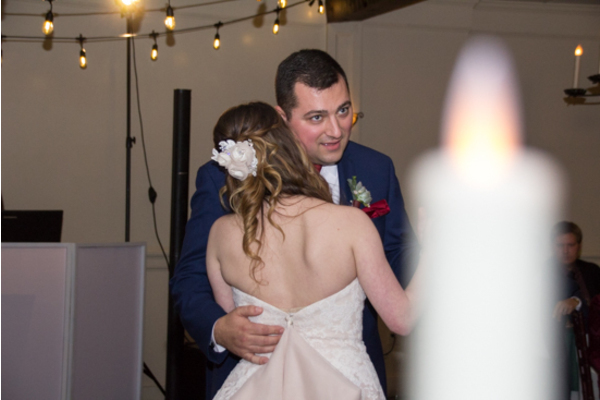 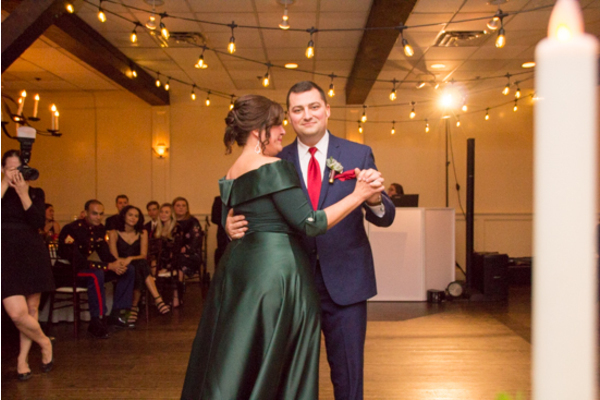 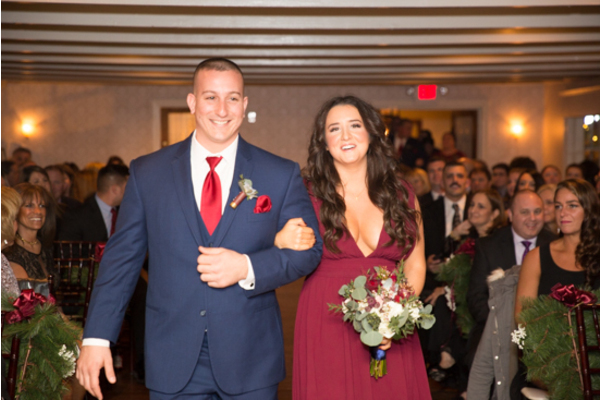 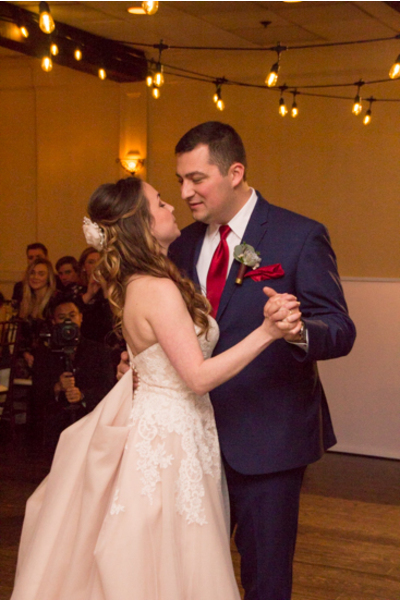 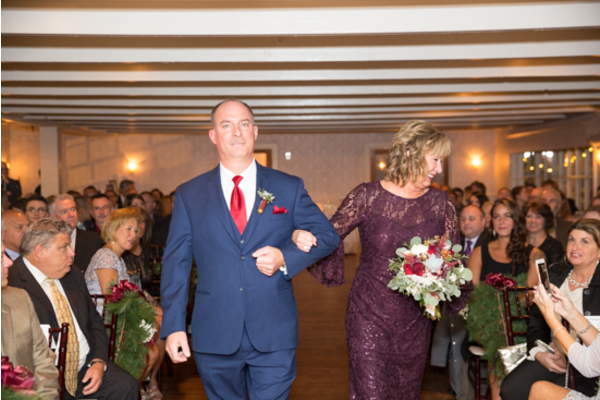 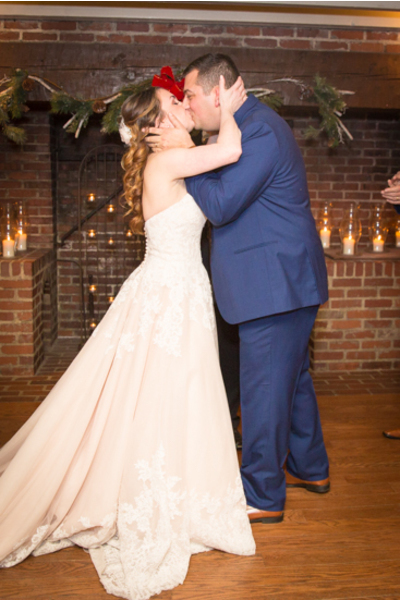 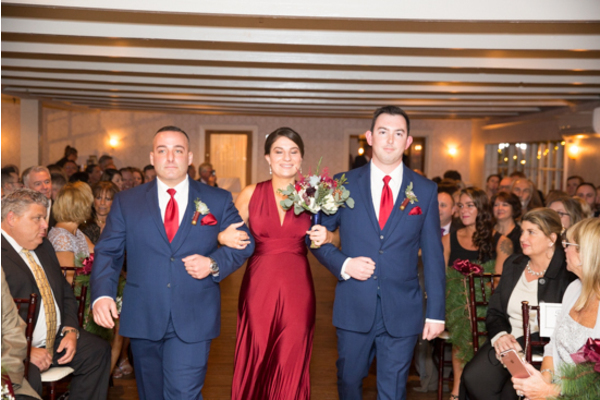 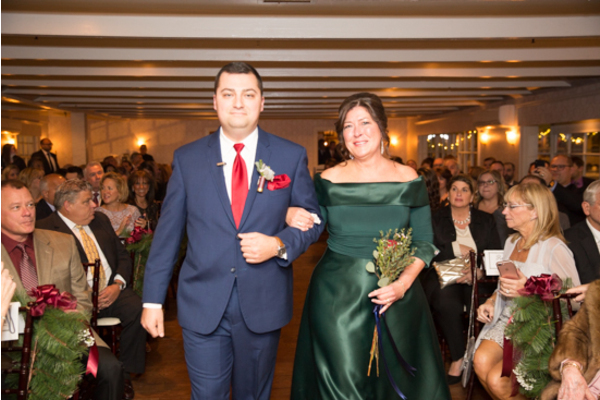 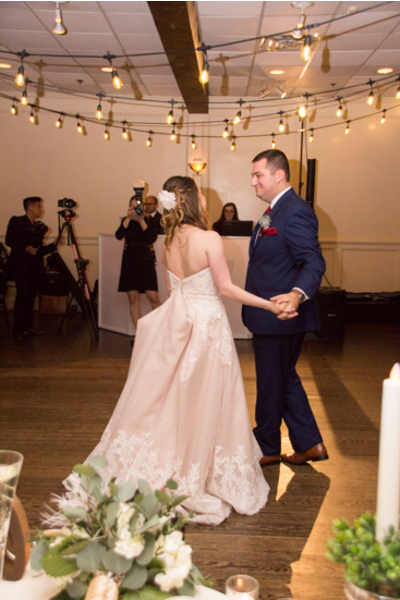 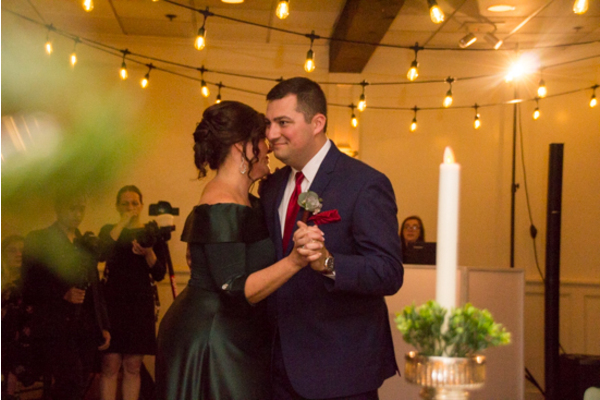 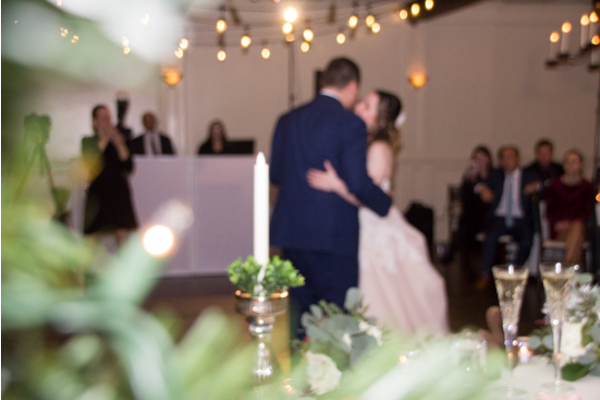 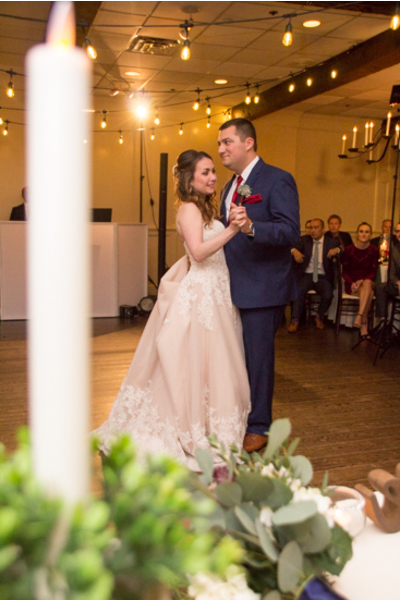 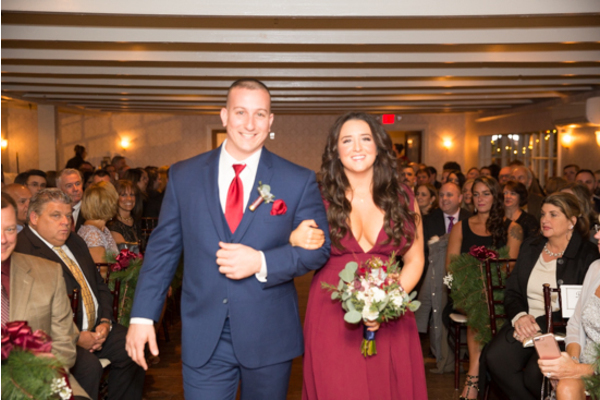 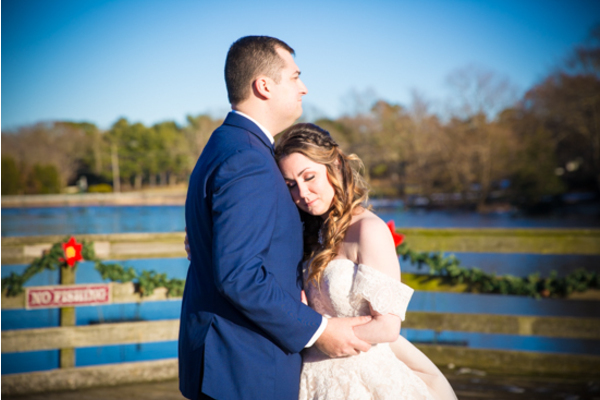 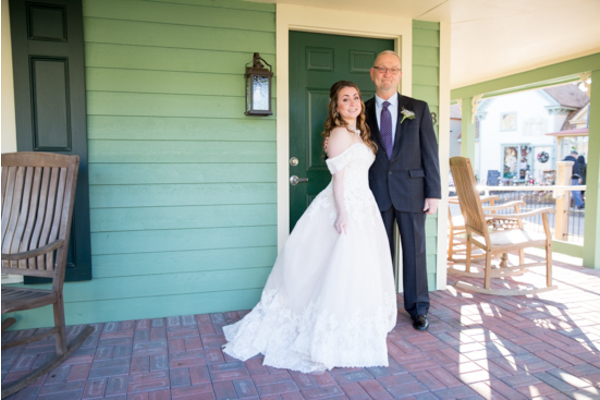 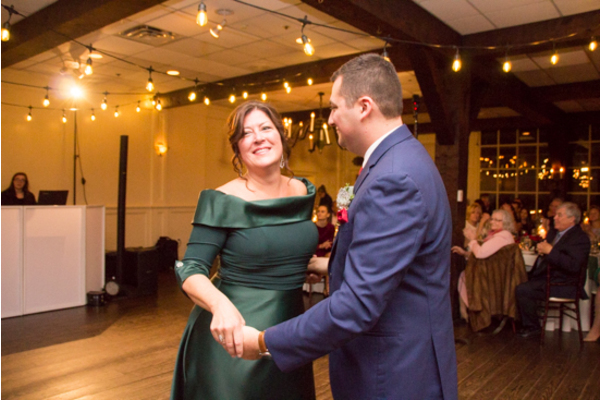 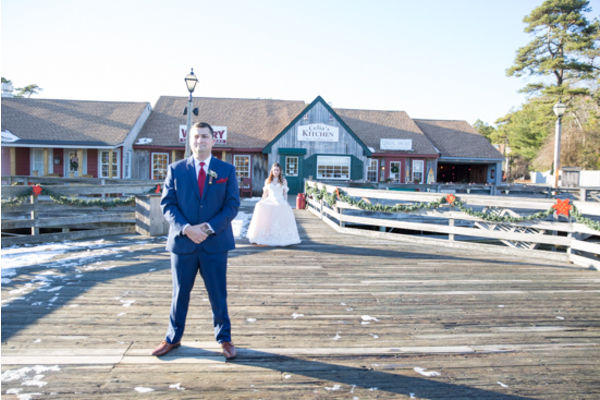 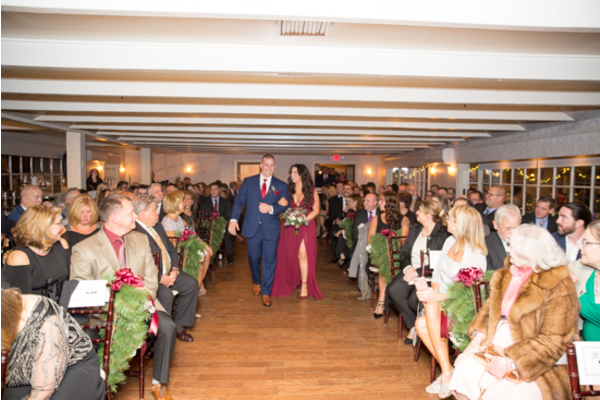 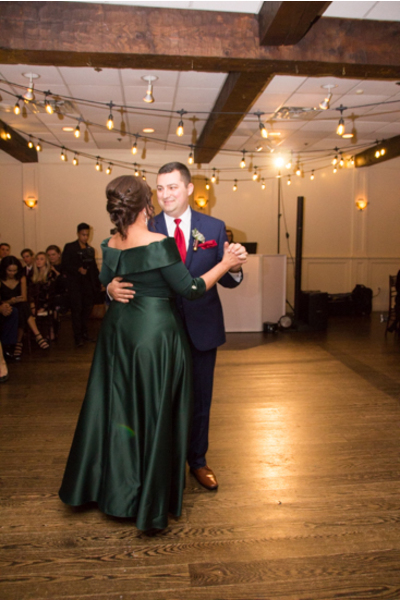 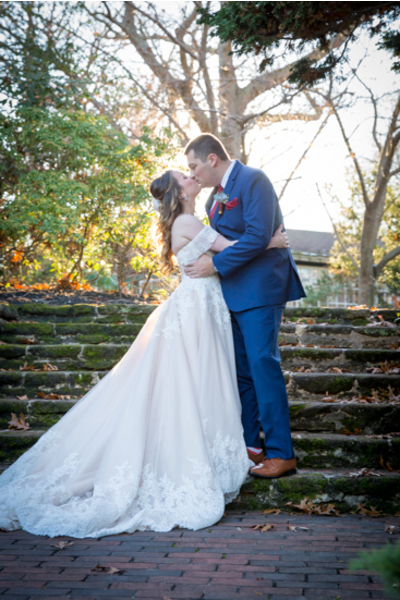 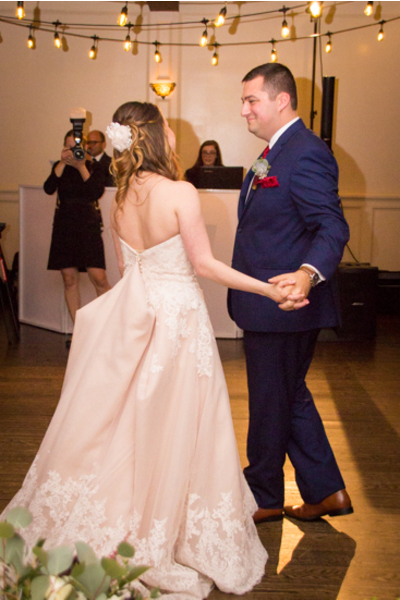 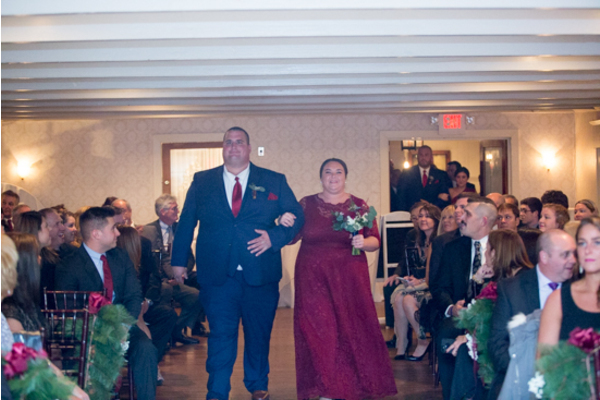 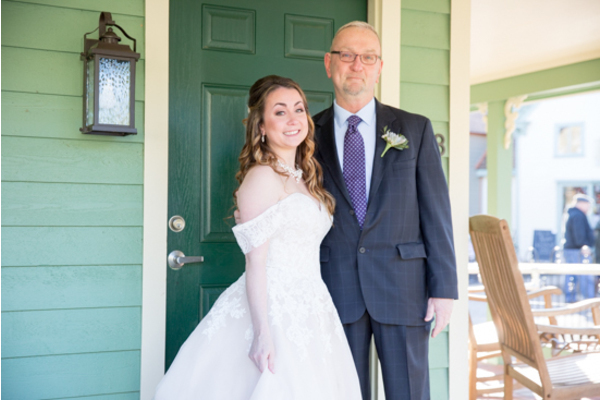 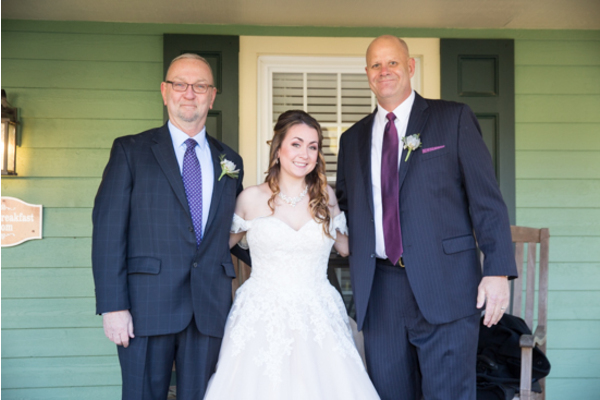 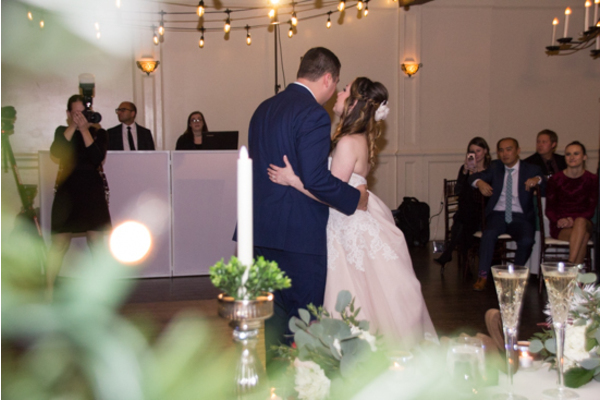 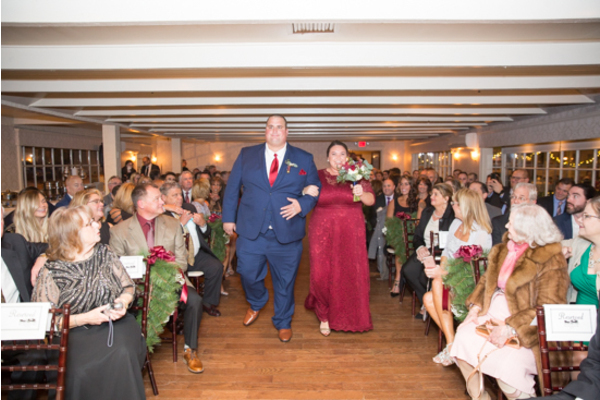 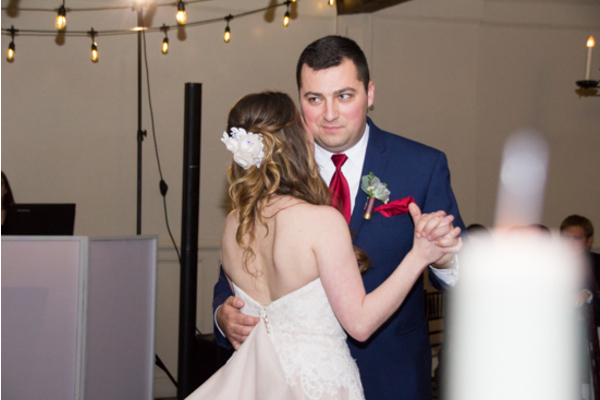 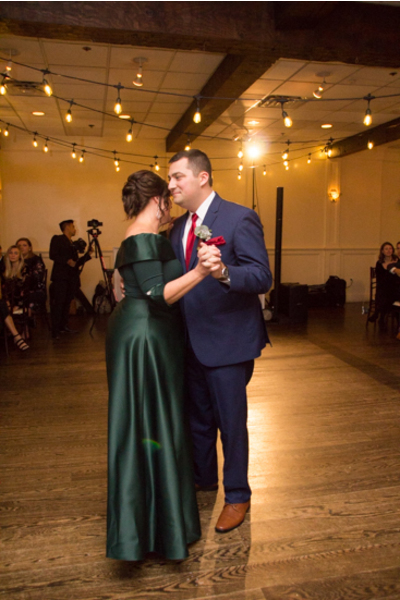 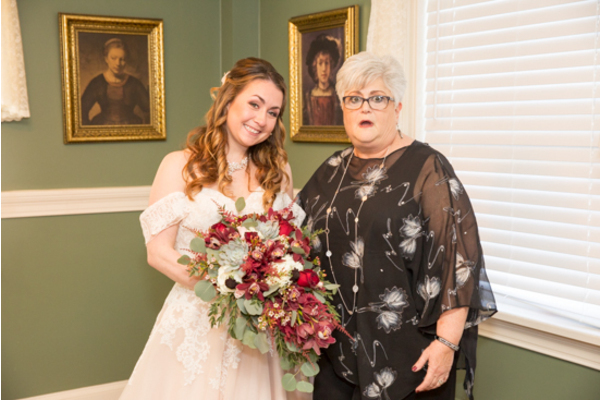 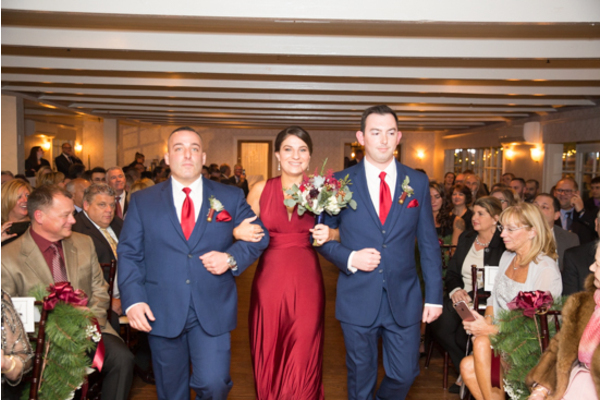 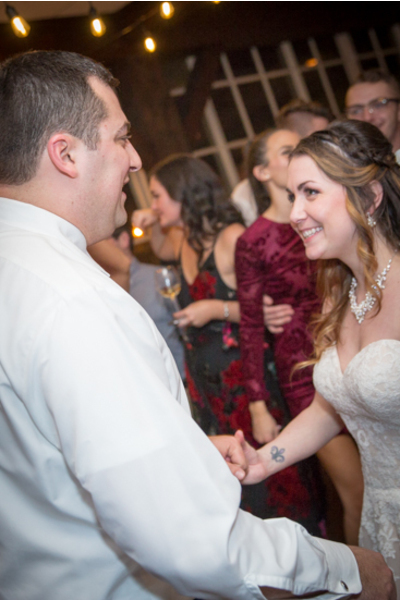 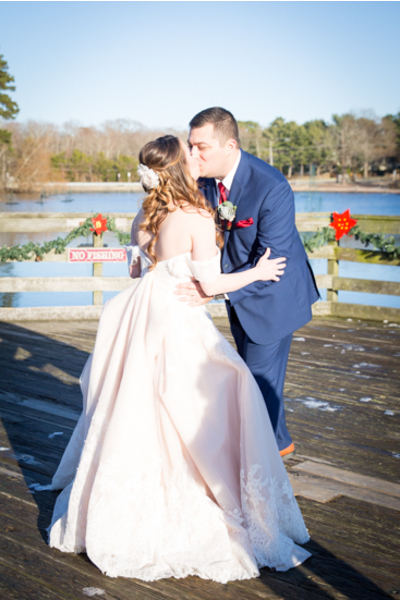 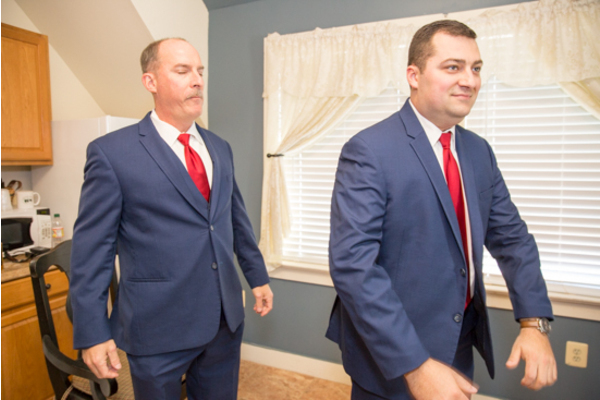 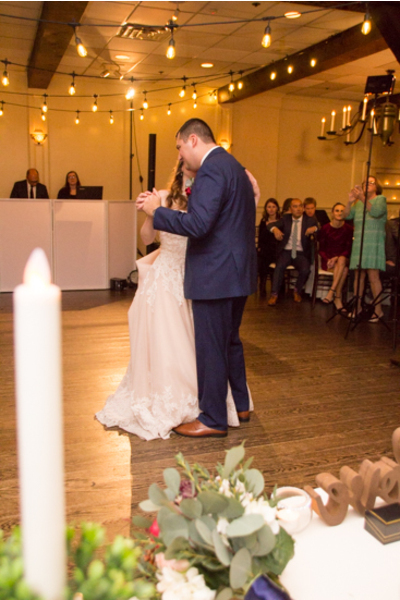 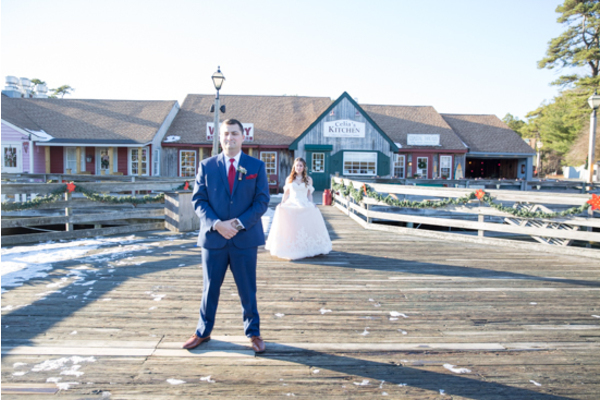 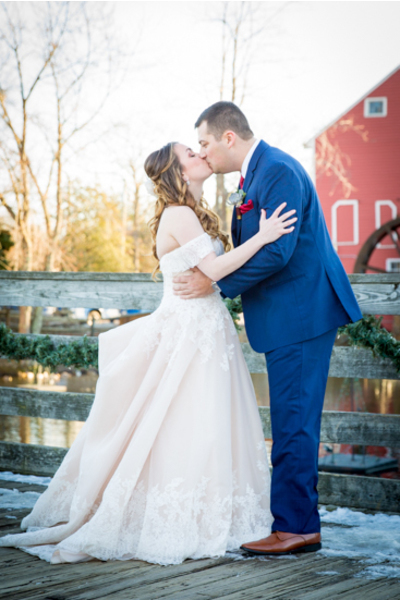 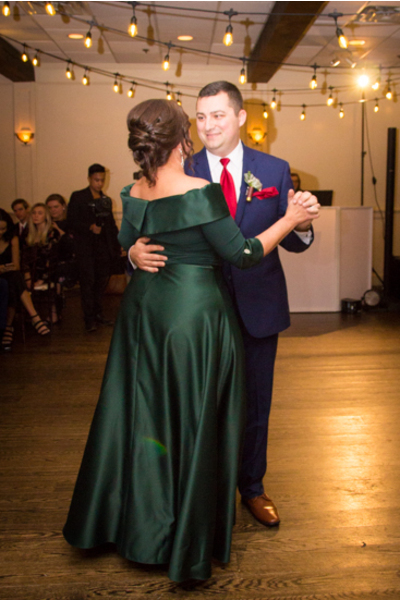 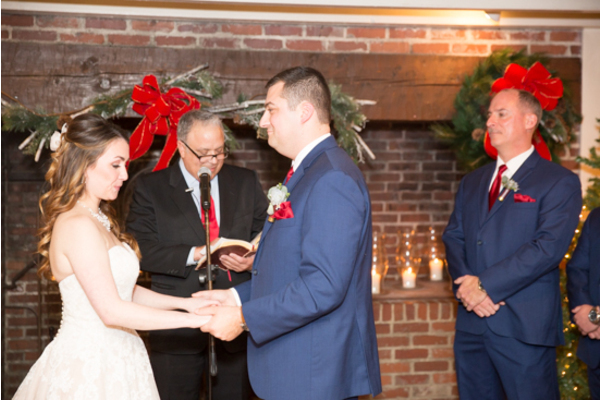 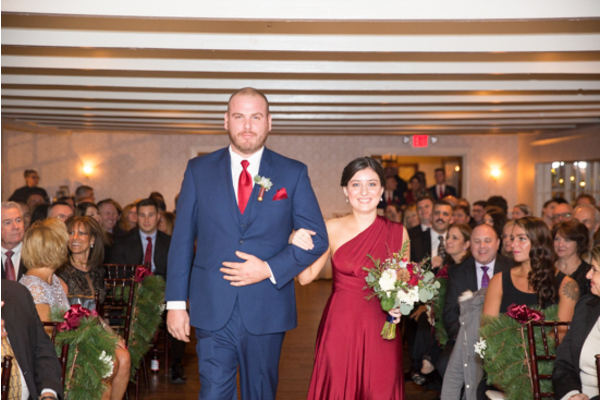 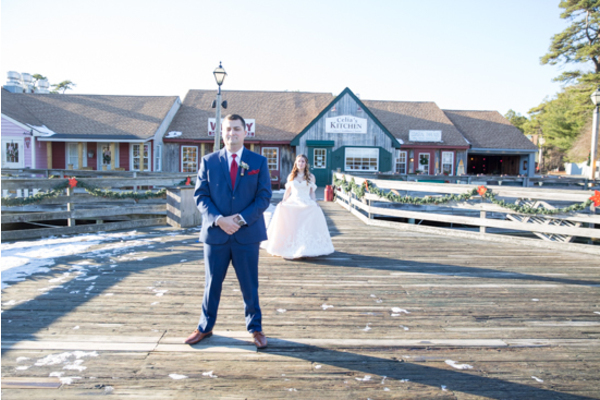 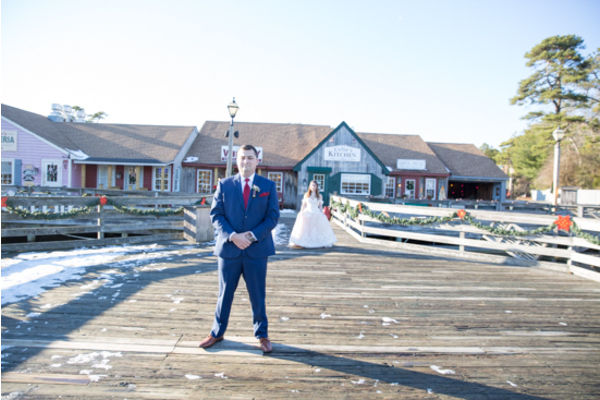 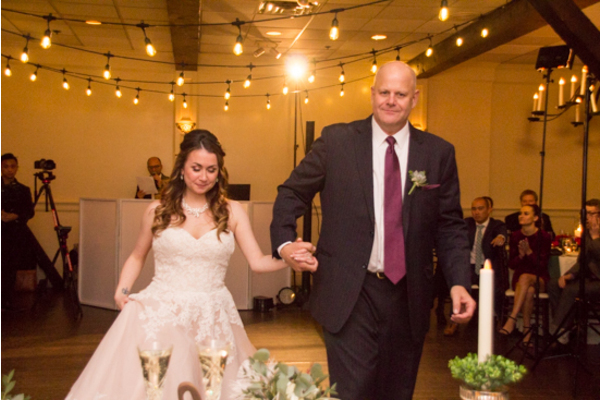 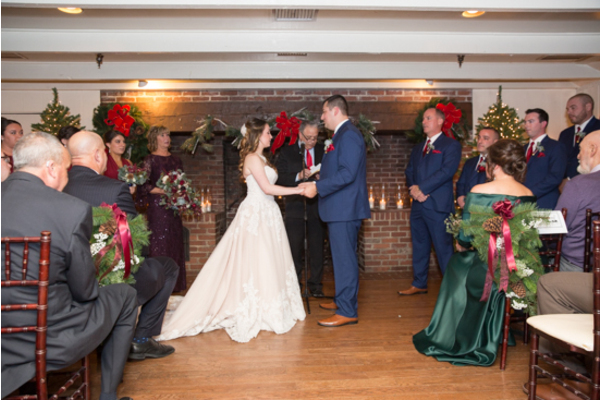 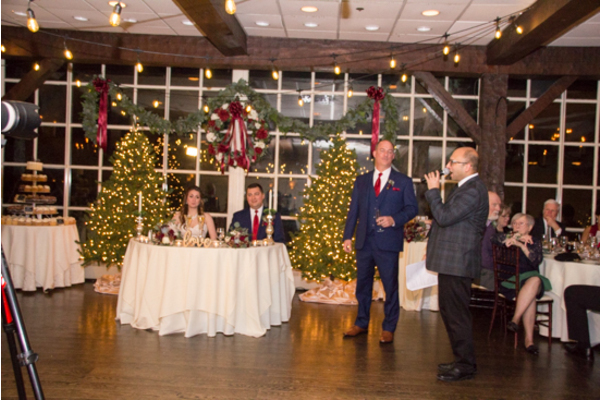 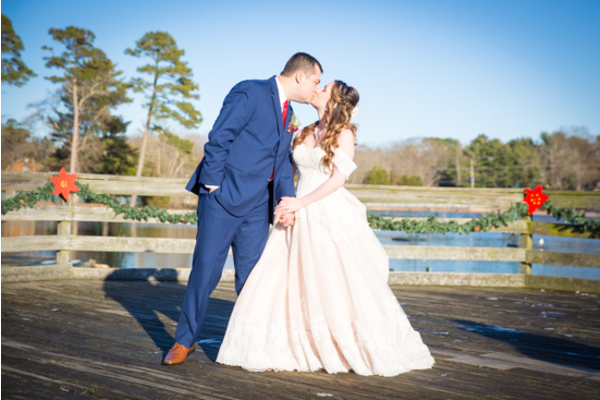 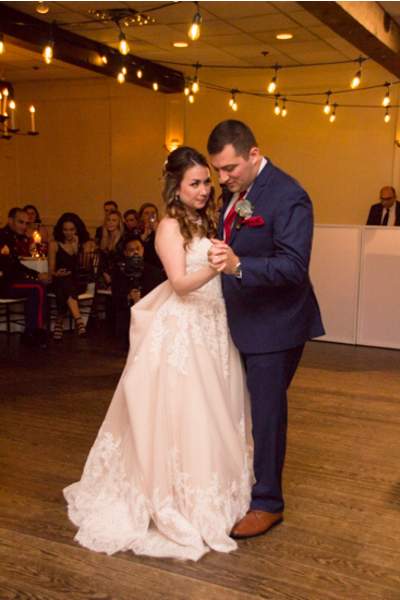 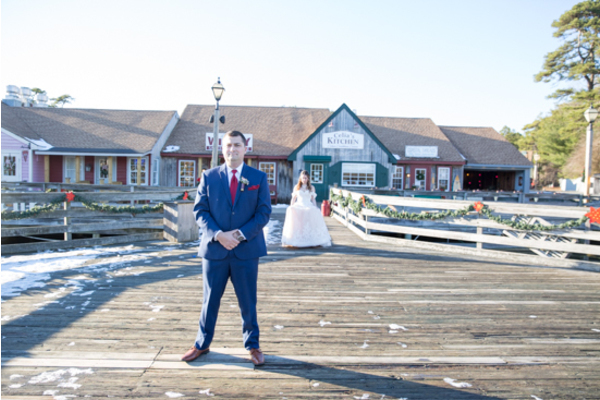 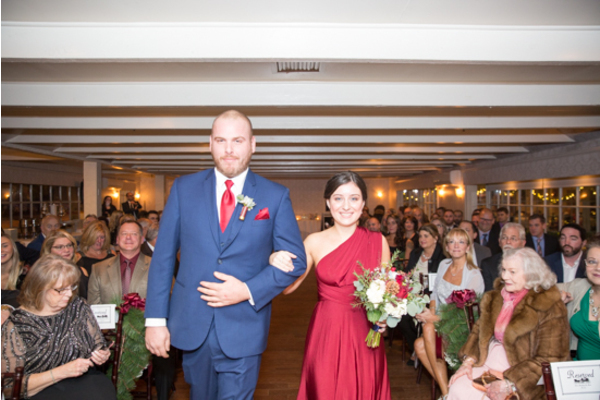 The beautiful couple wed on December 7th, 2018. 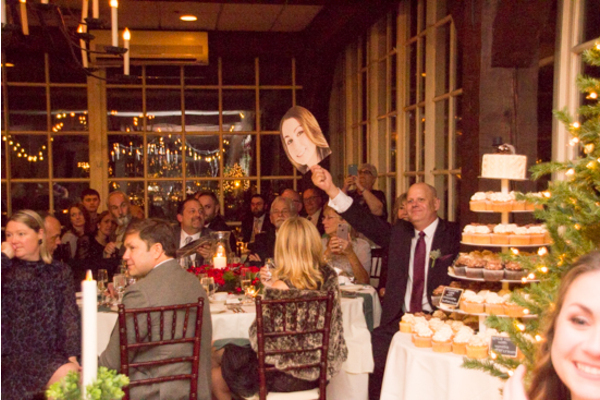 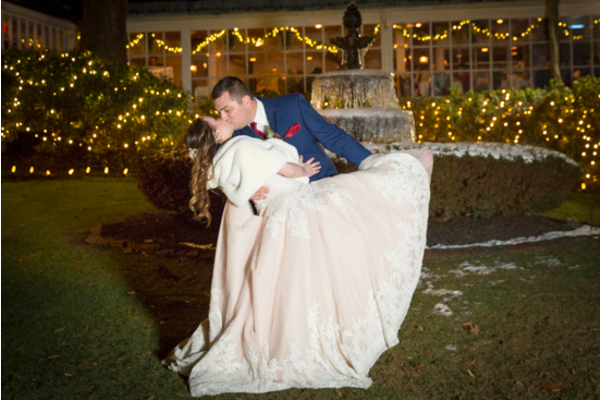 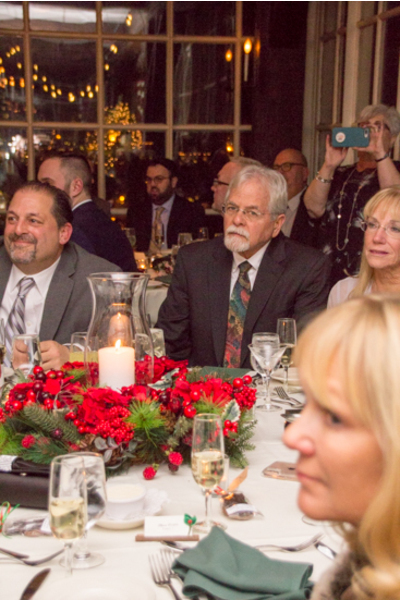 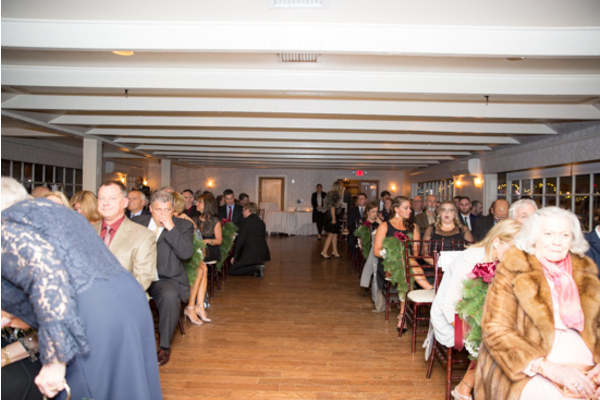 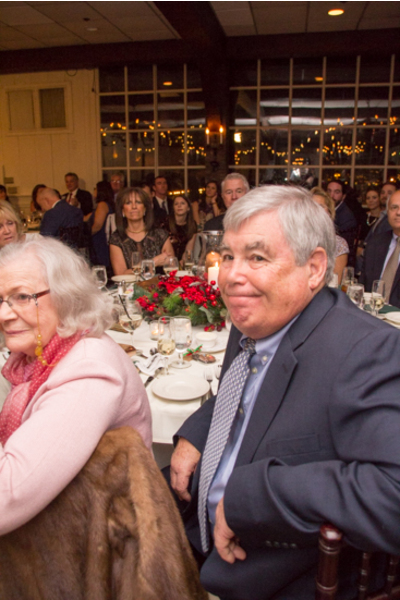 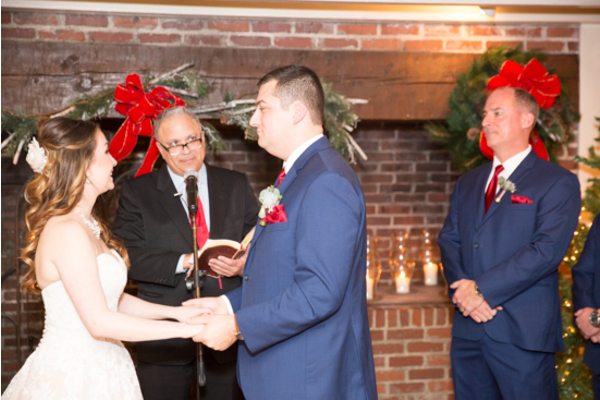 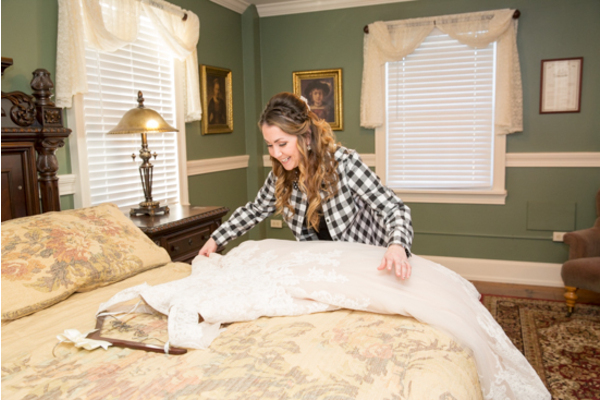 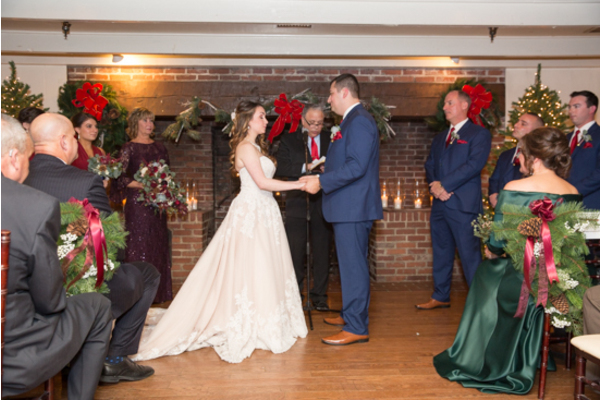 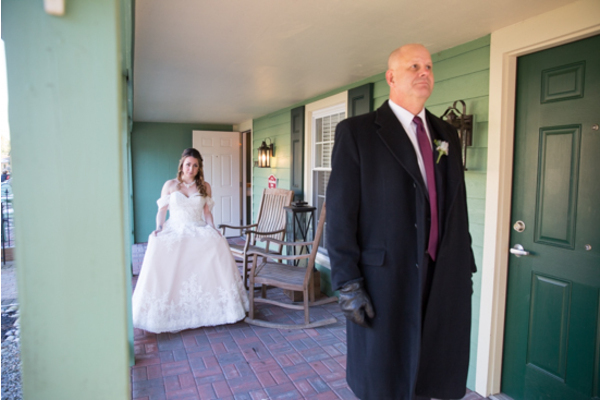 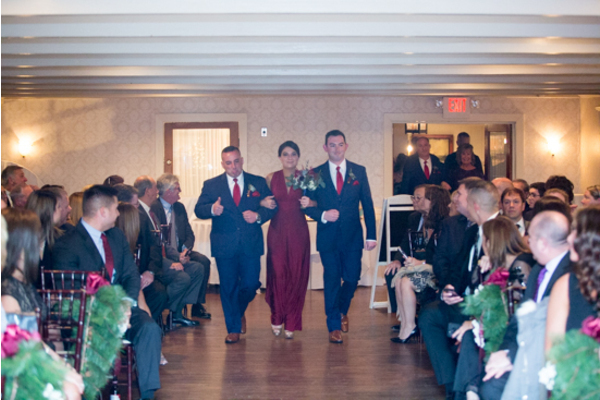 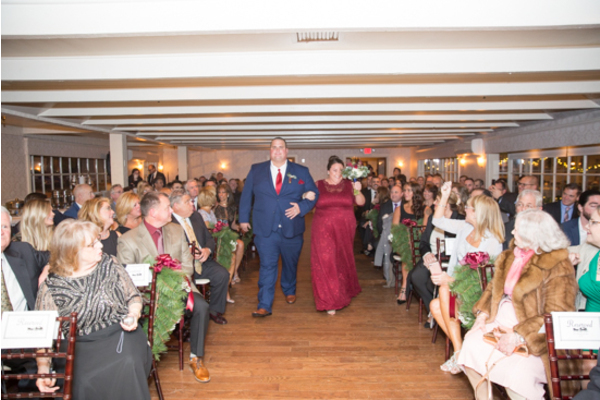 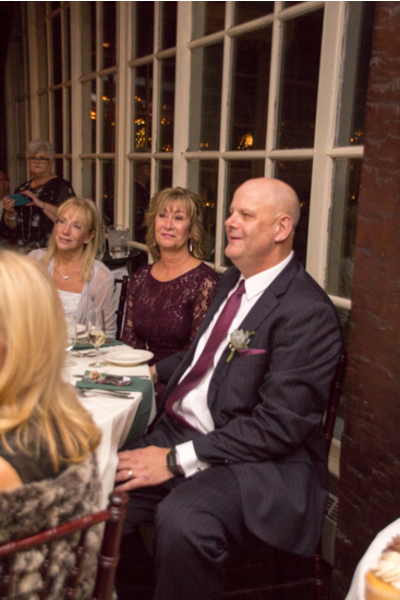 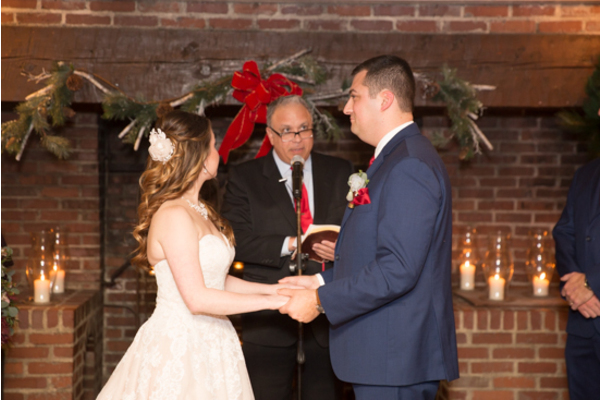 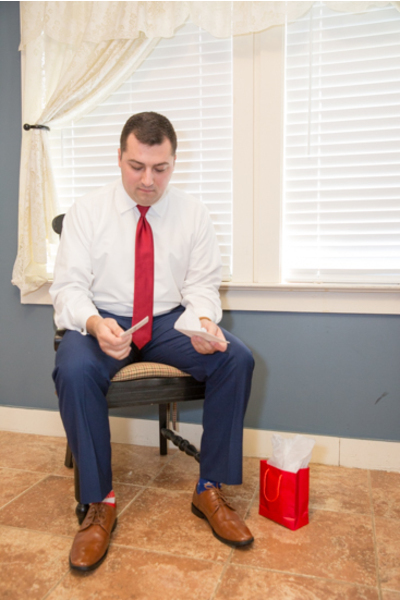 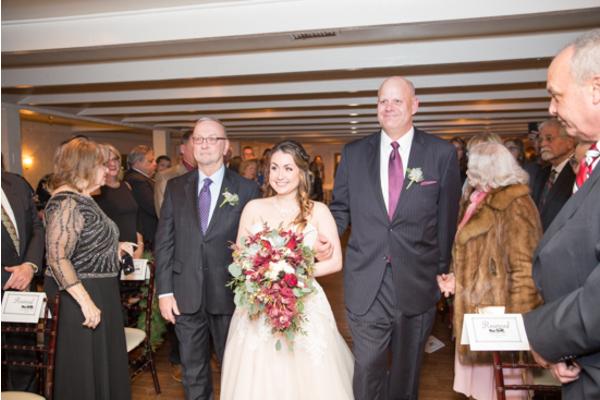 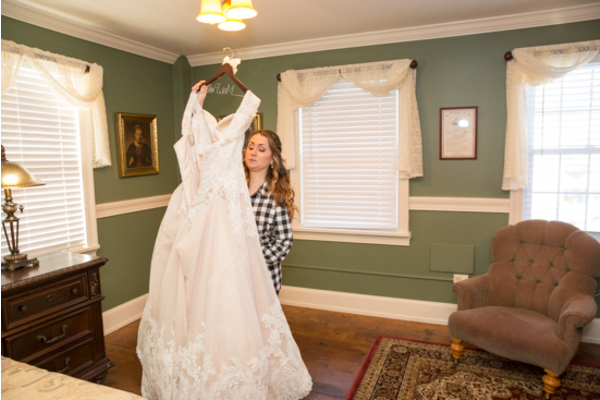 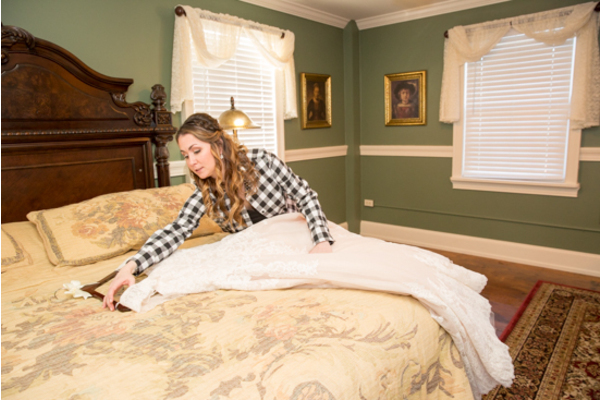 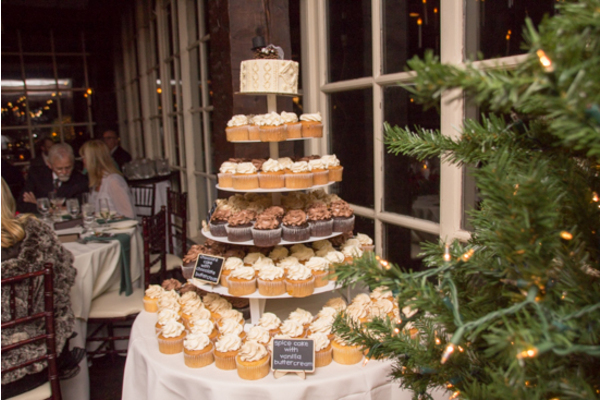 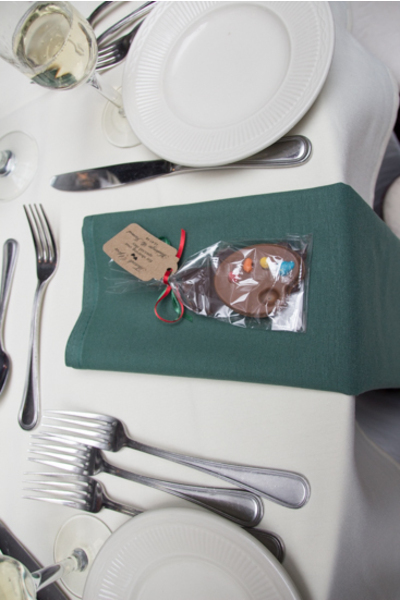 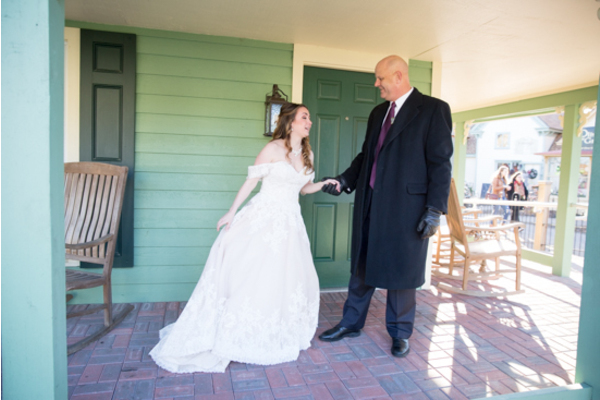 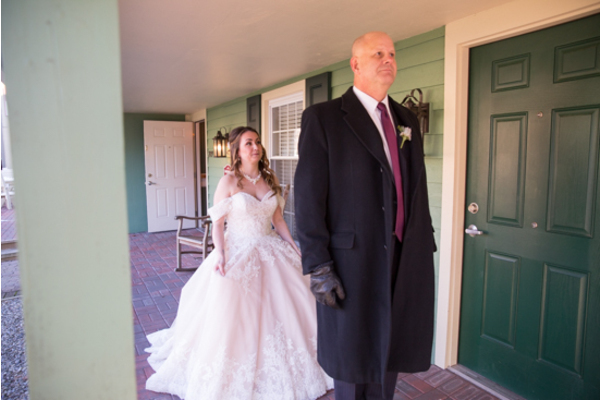 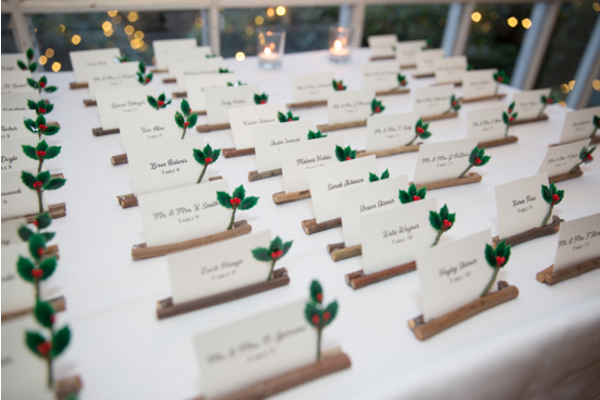 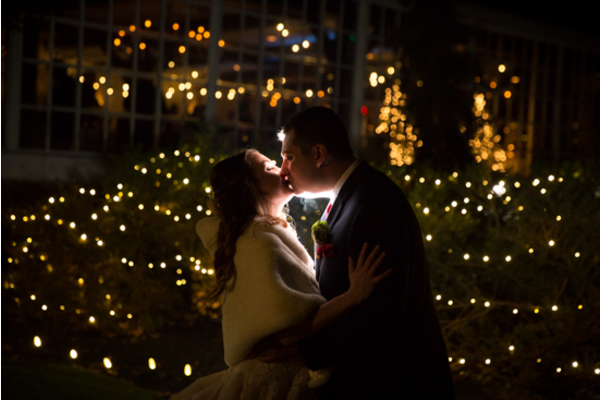 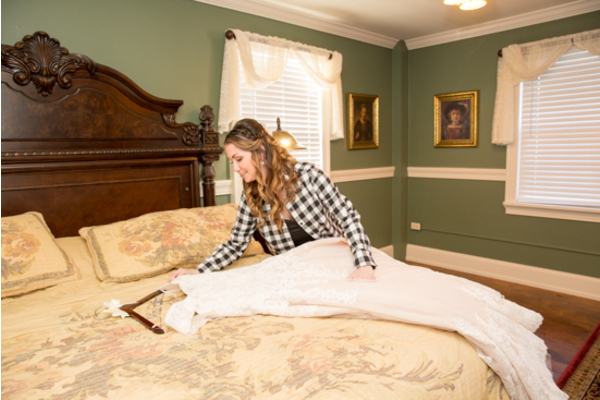 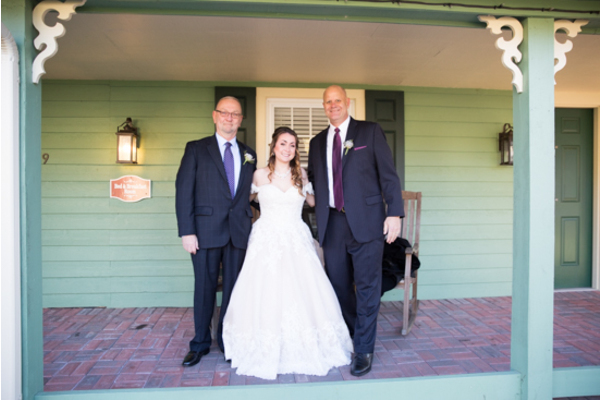 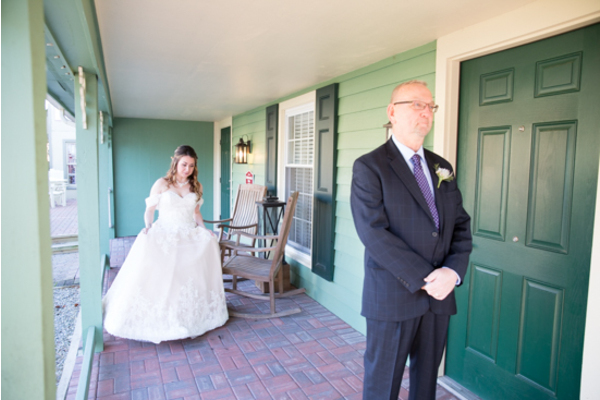 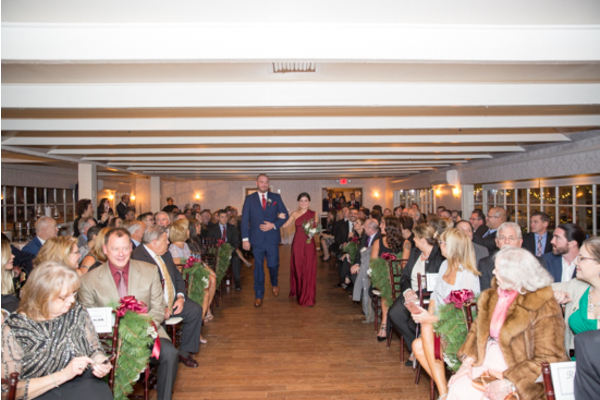 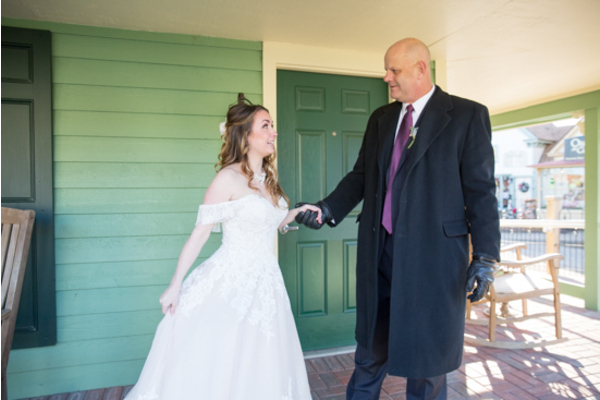 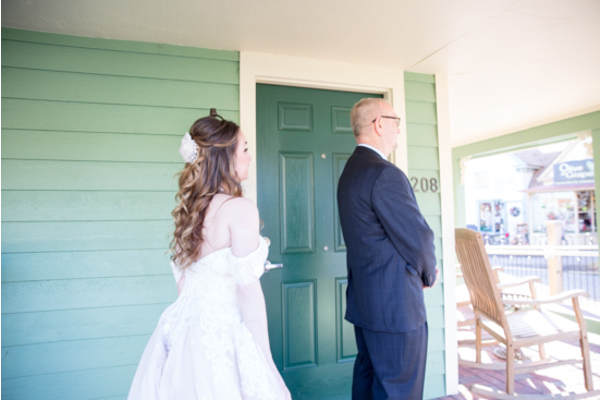 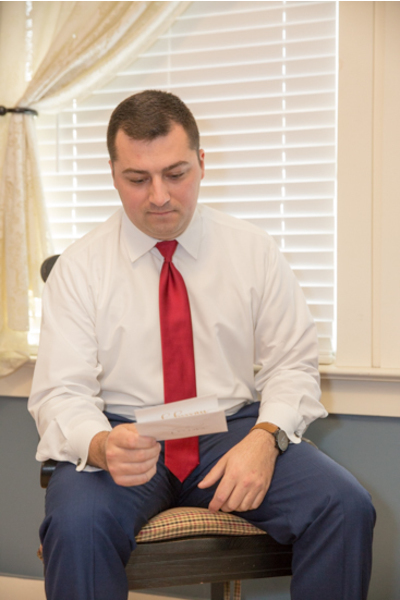 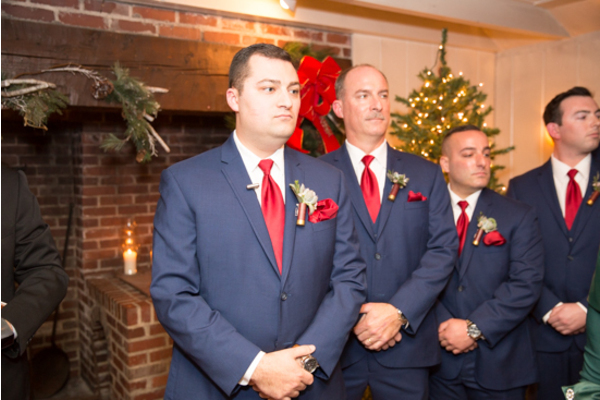 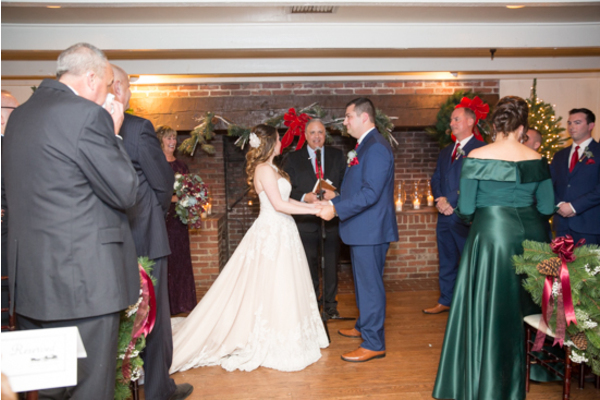 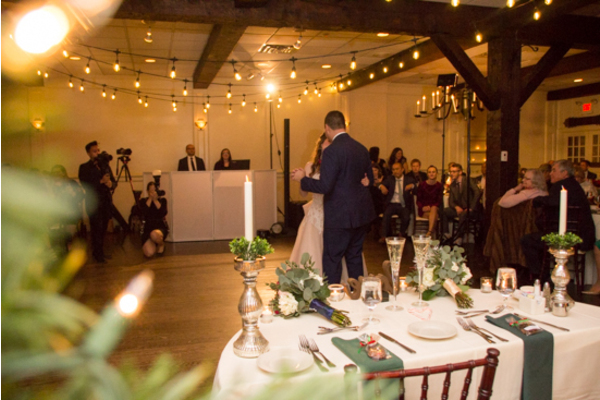 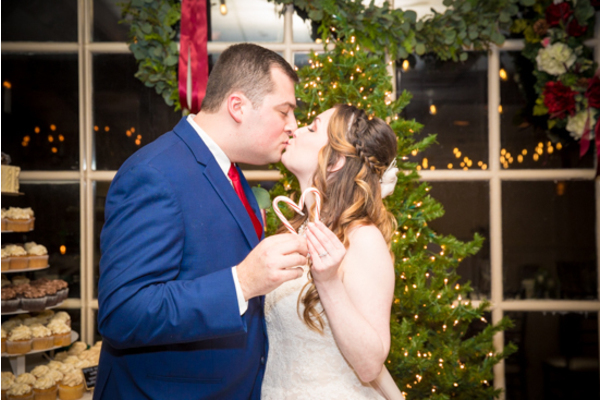 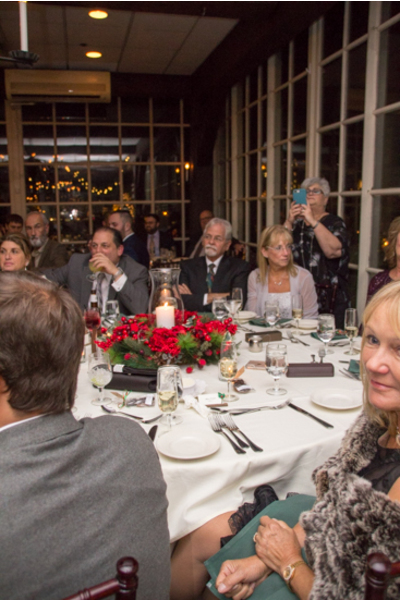 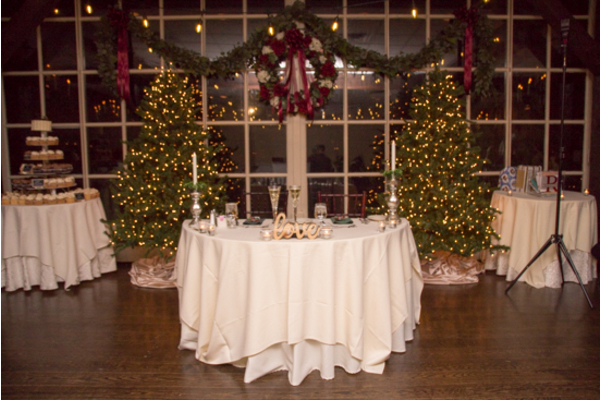 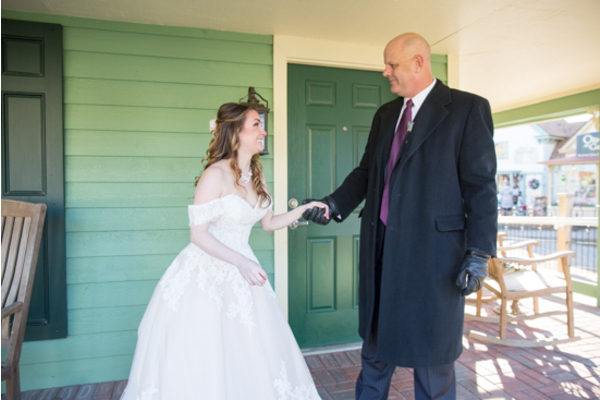 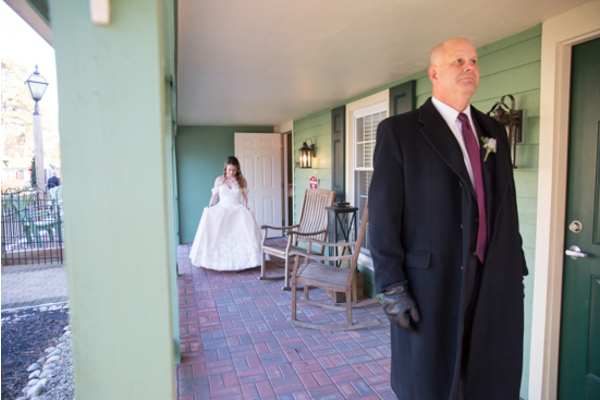 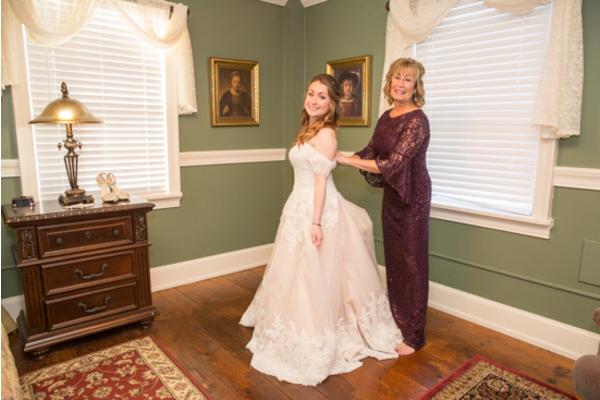 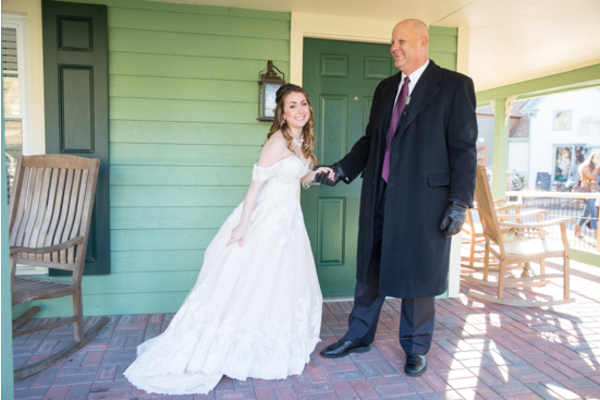 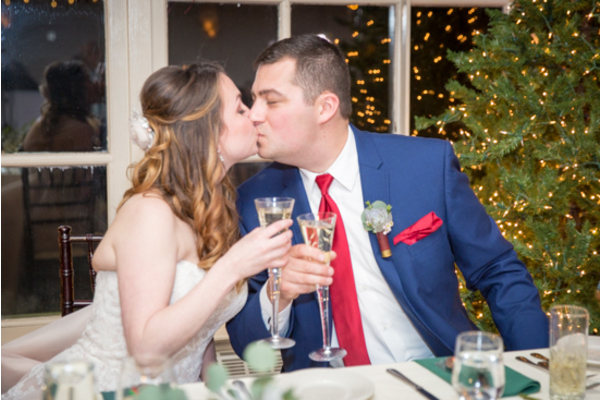 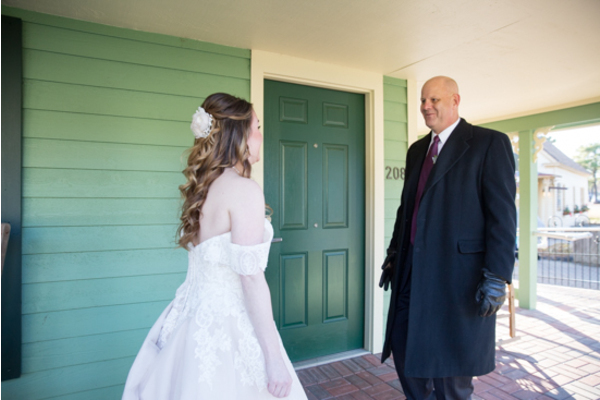 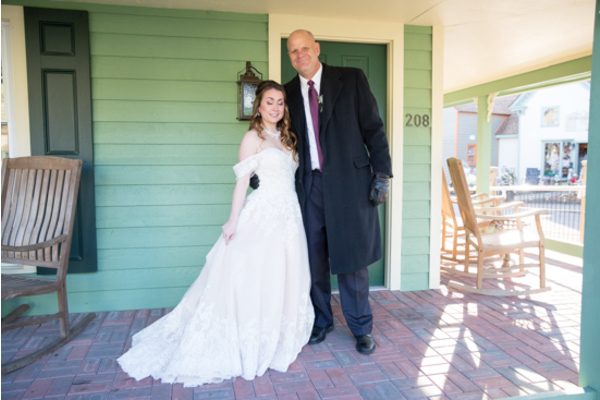 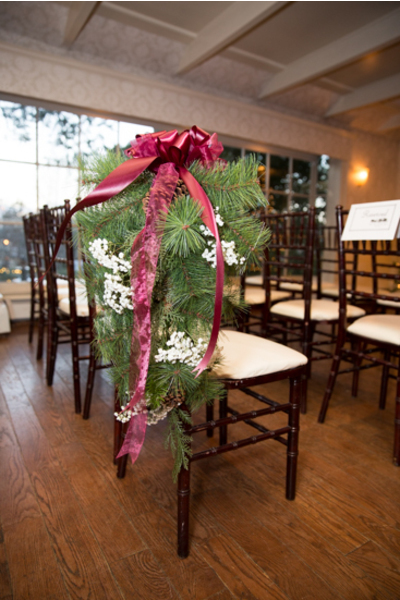 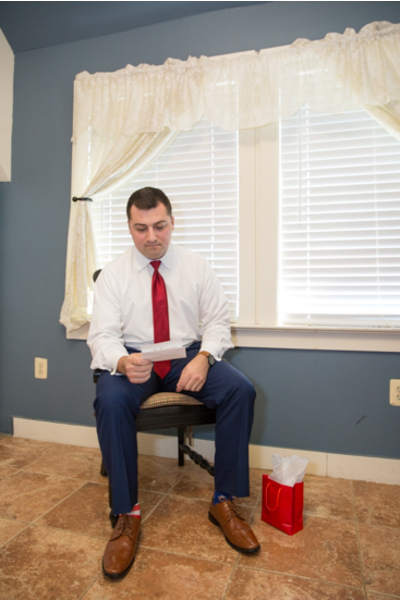 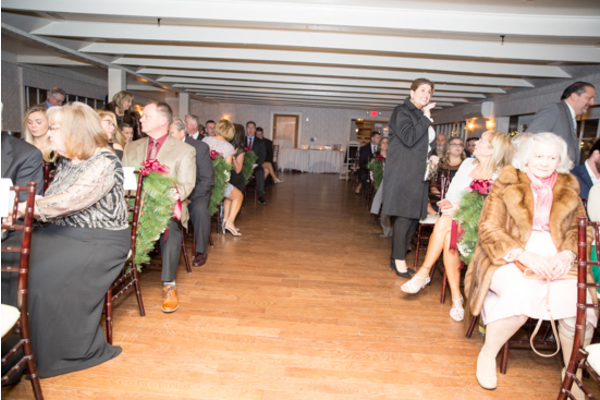 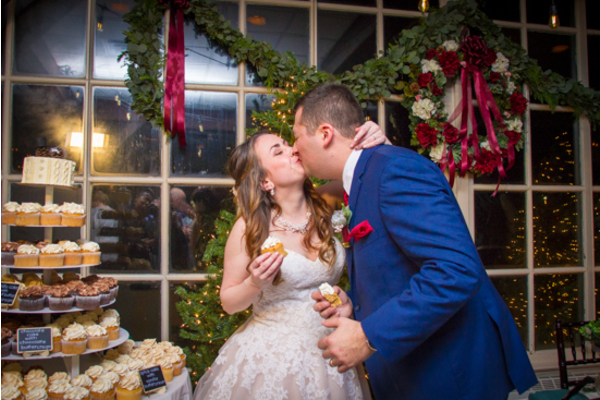 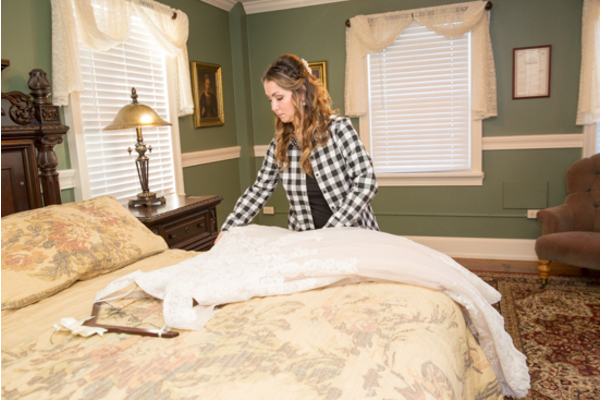 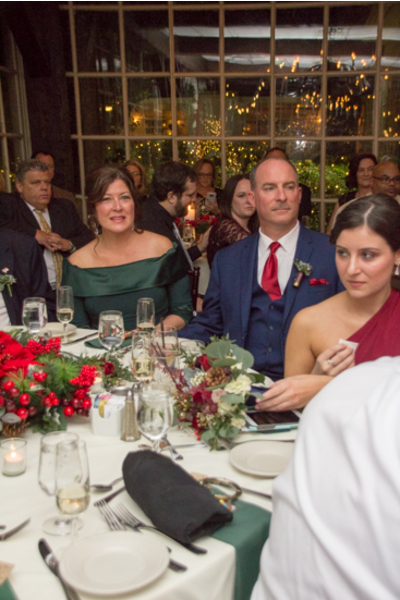 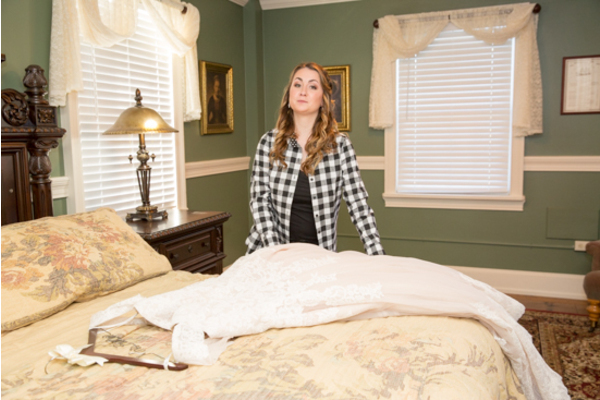 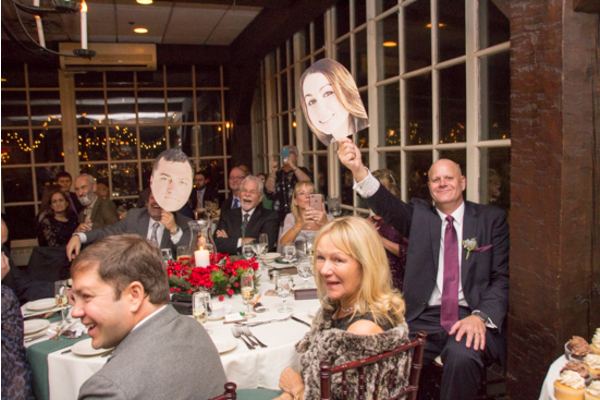 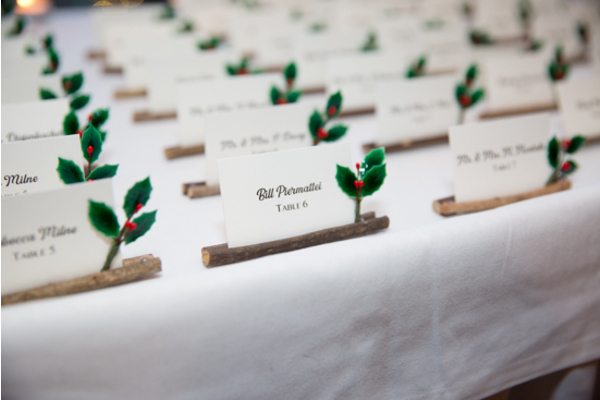 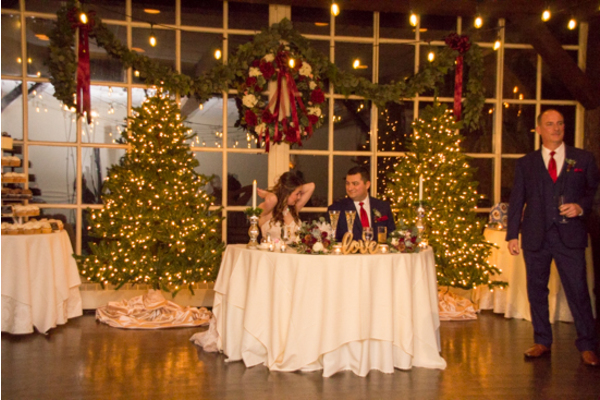 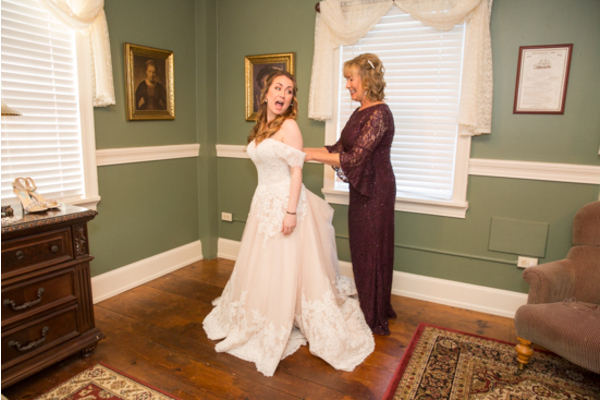 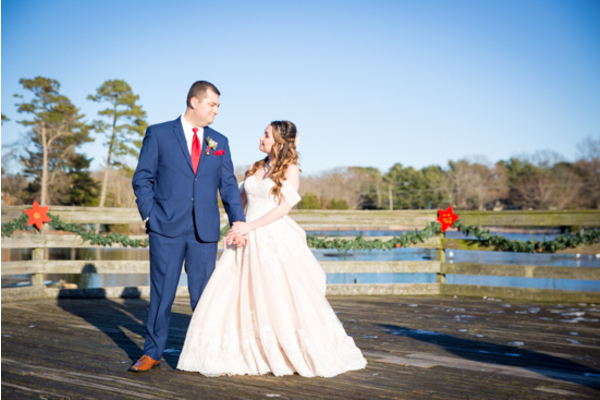 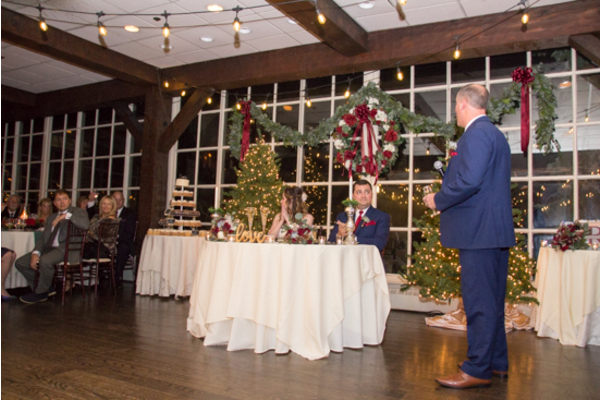 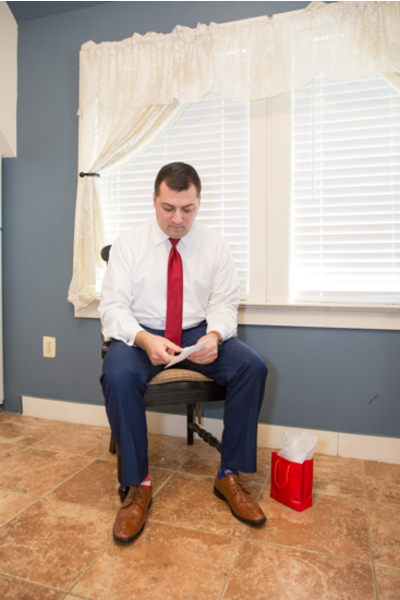 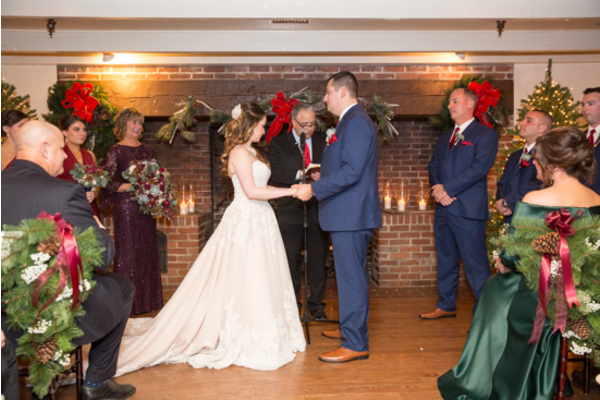 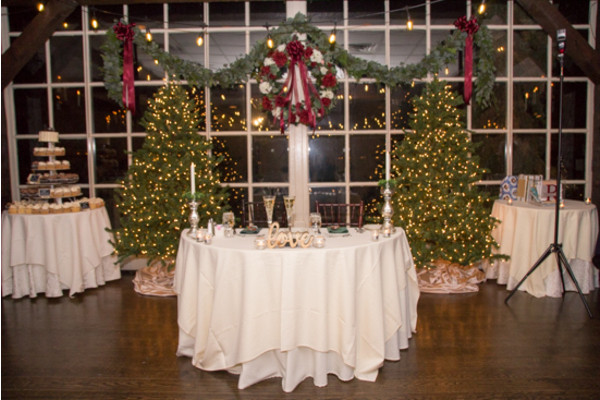 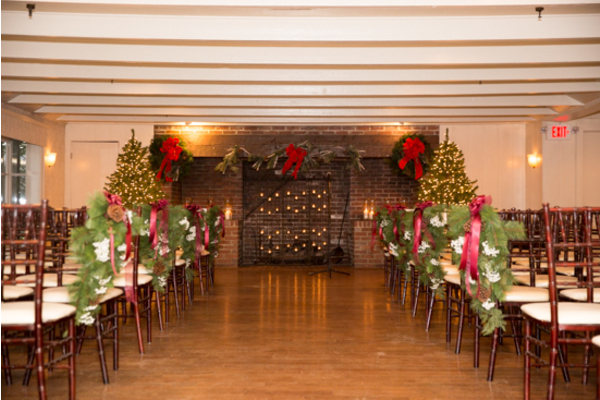 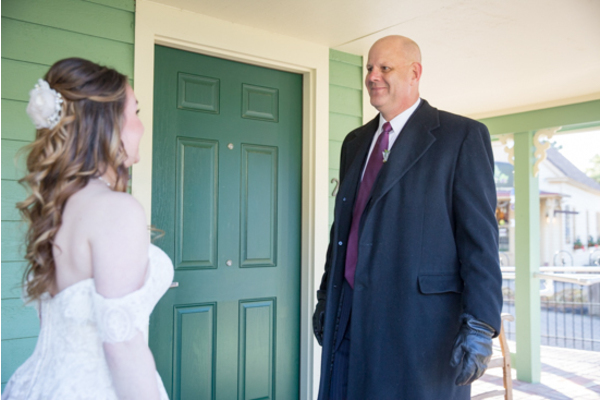 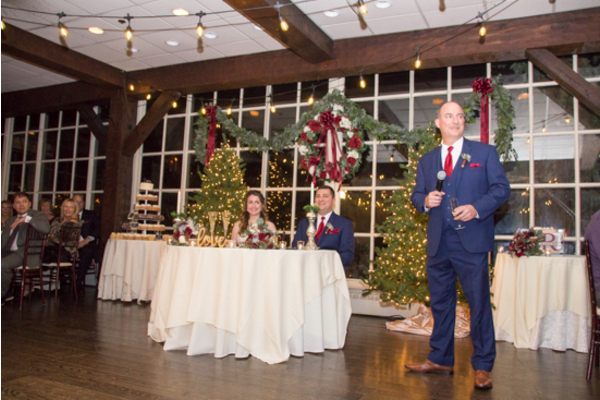 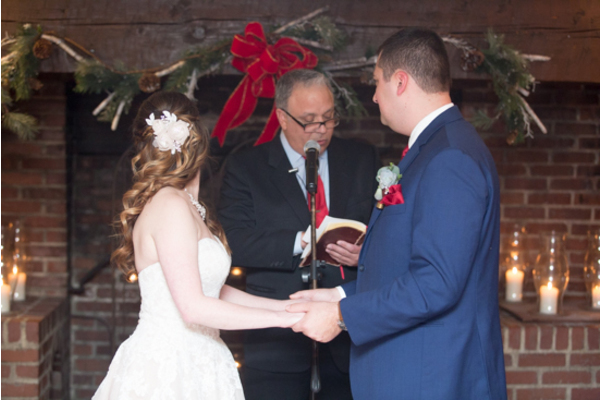 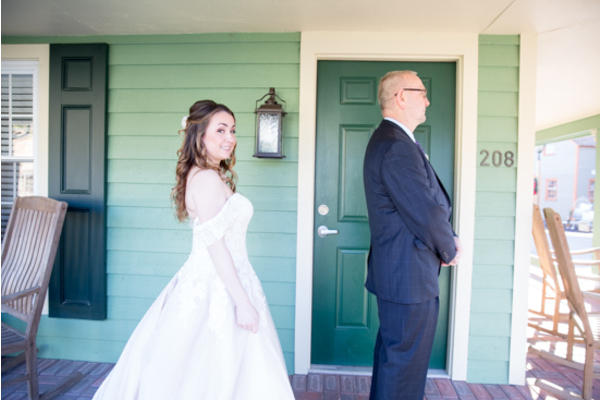 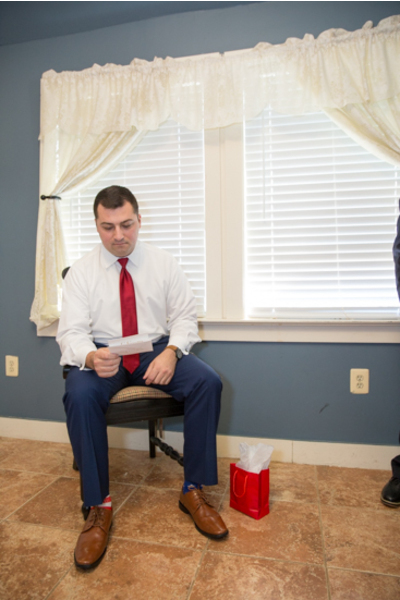 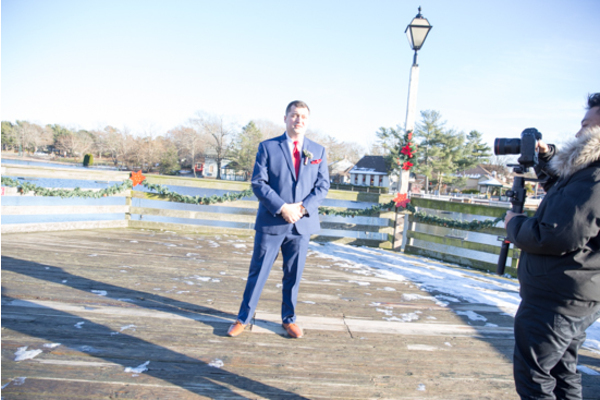 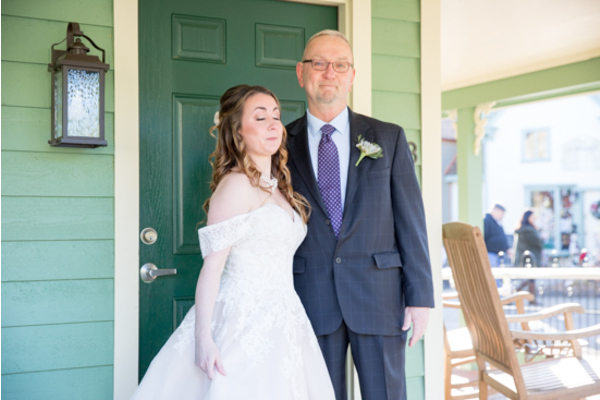 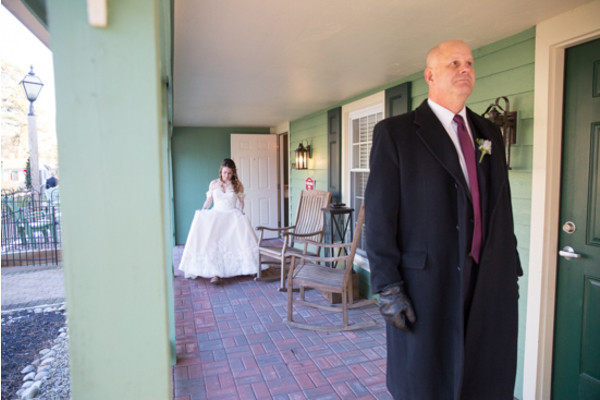 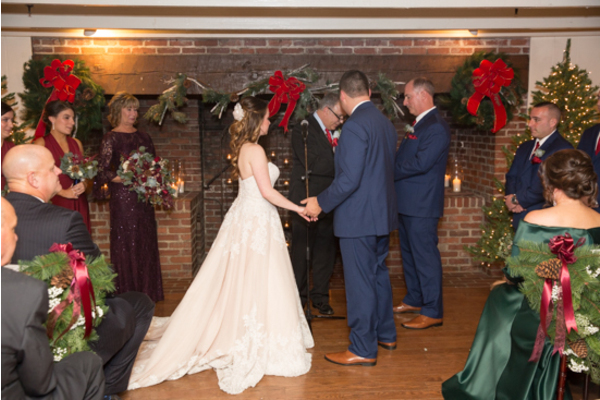 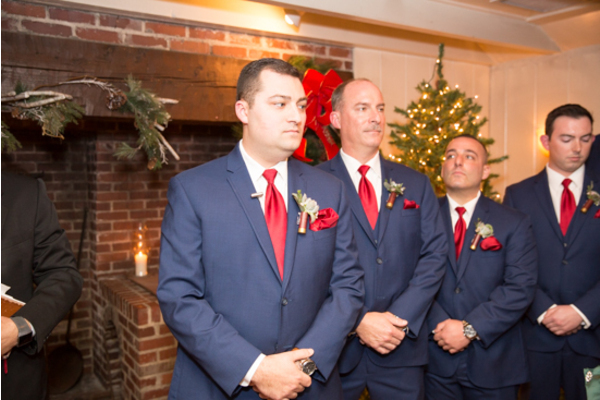 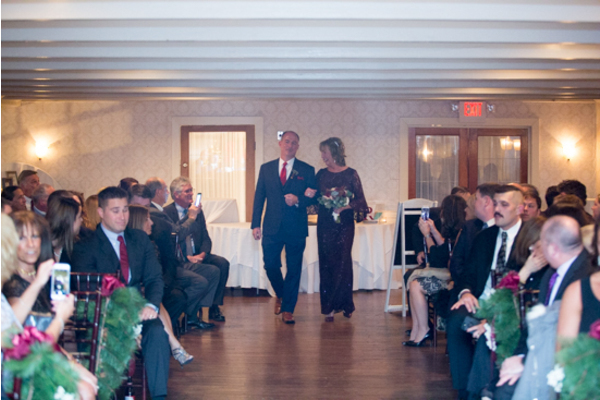 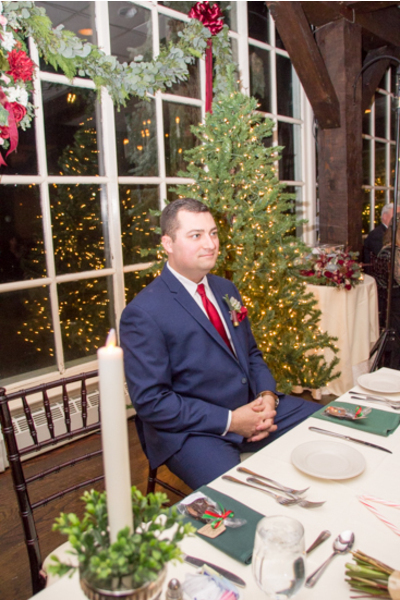 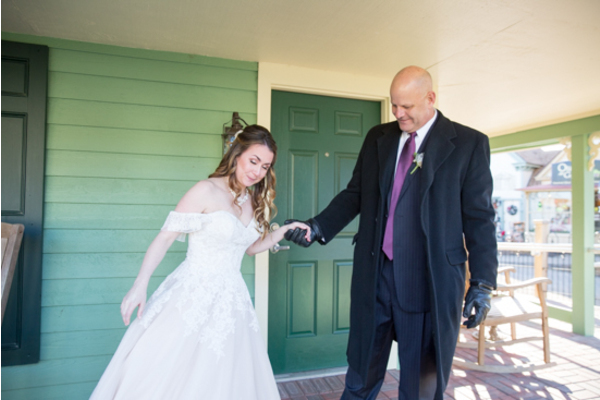 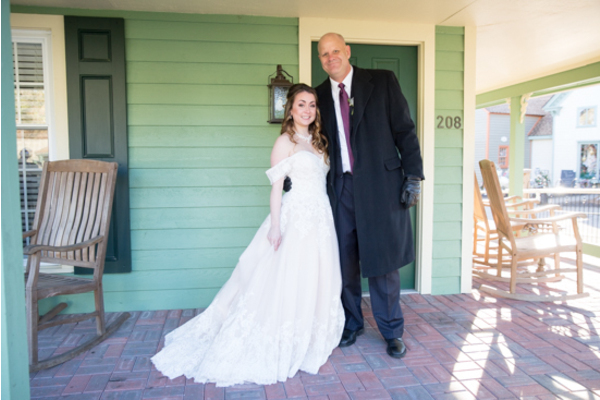 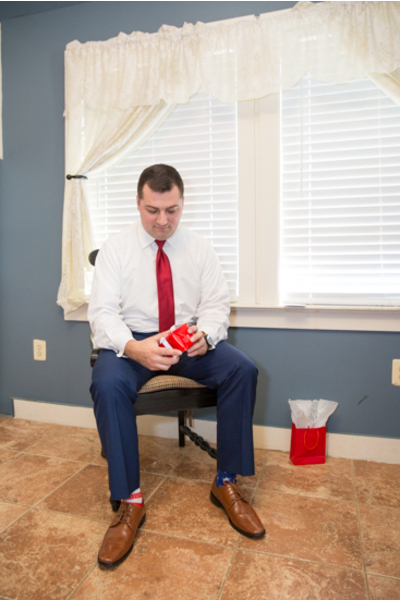 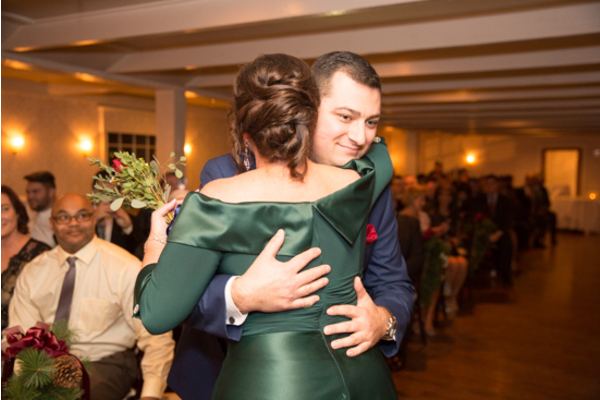 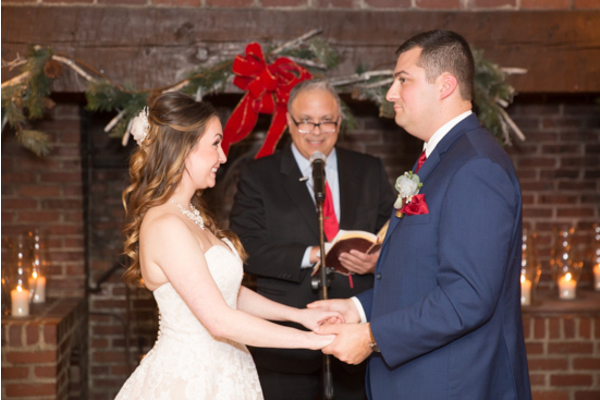 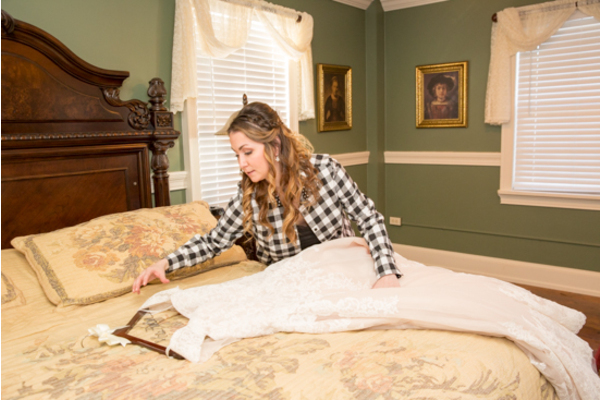 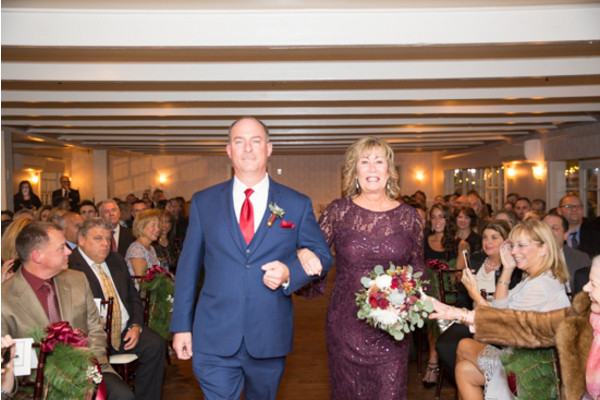 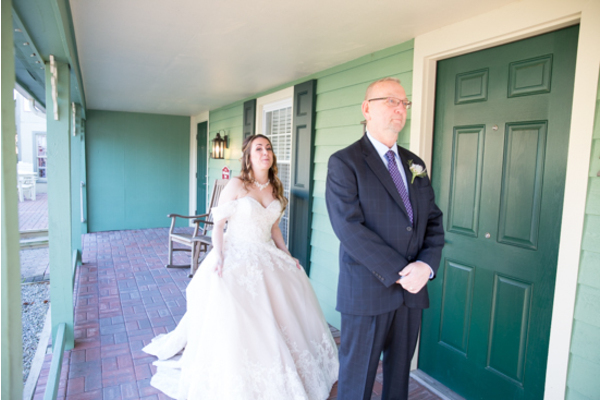 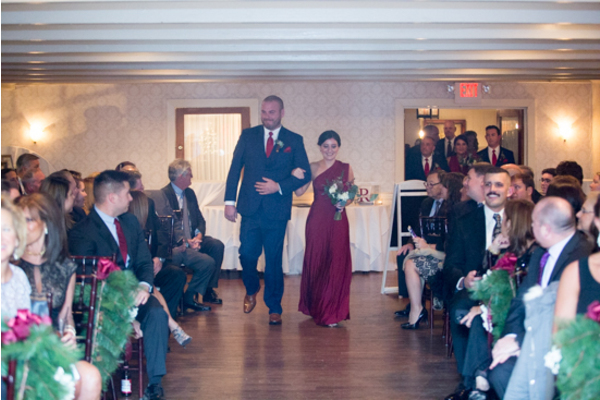 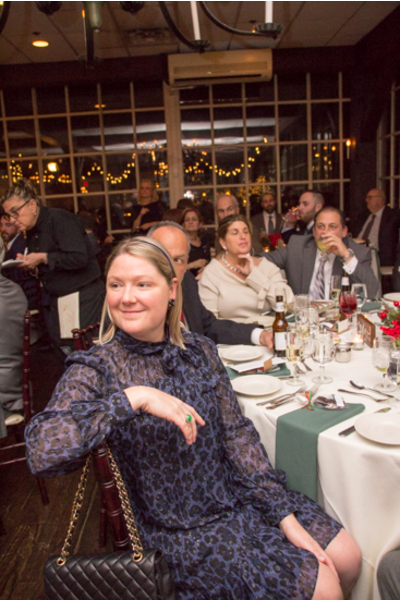 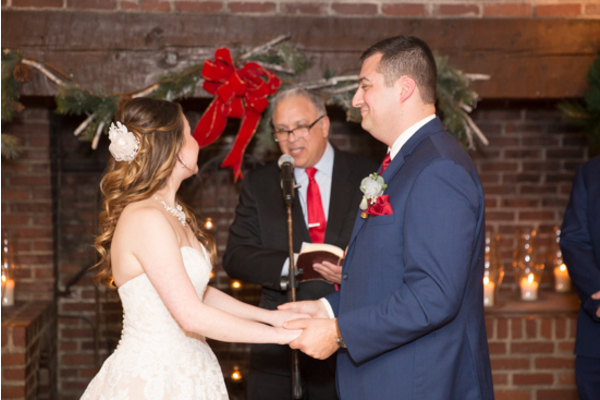 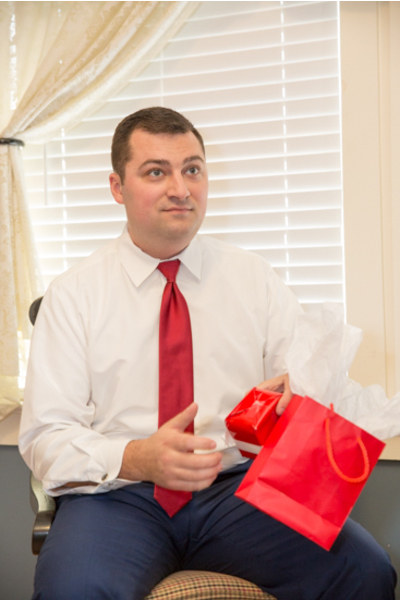 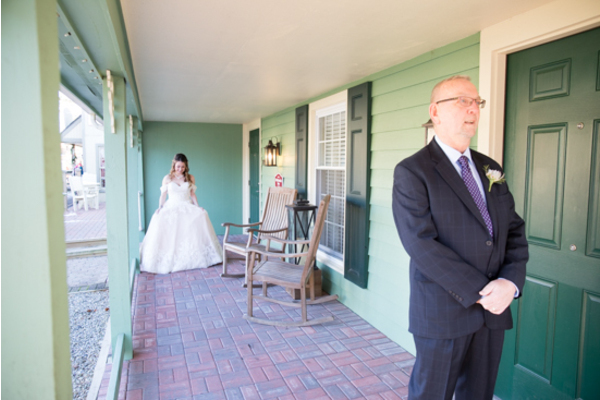 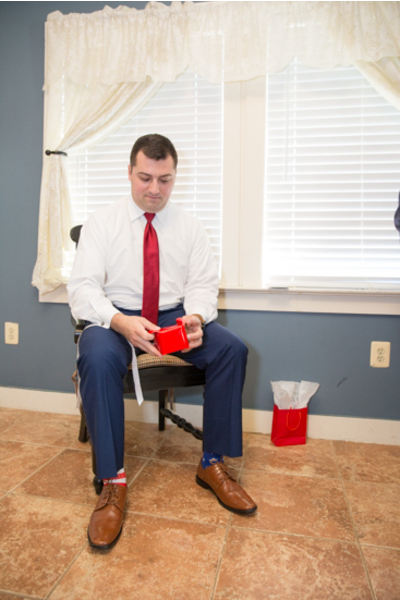 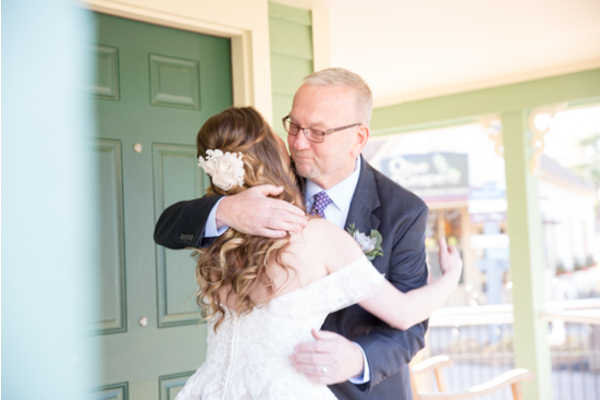 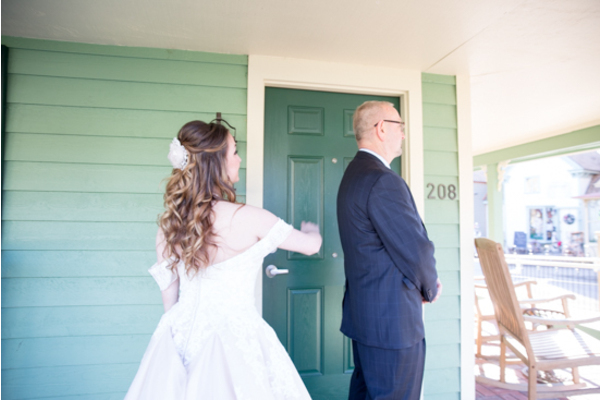 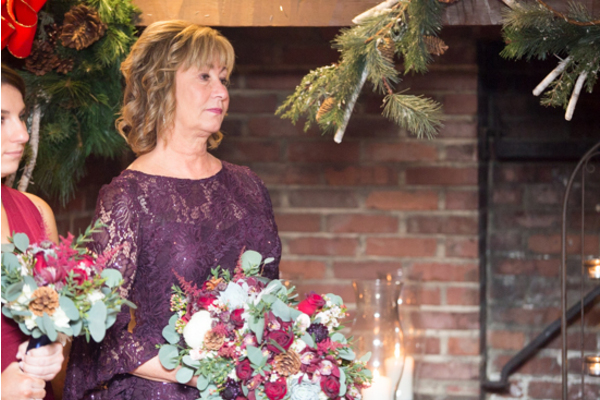 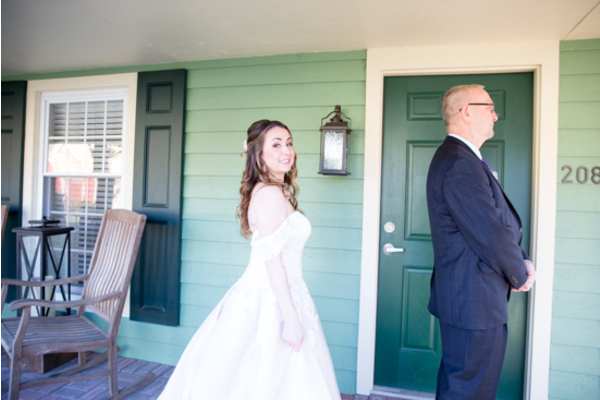 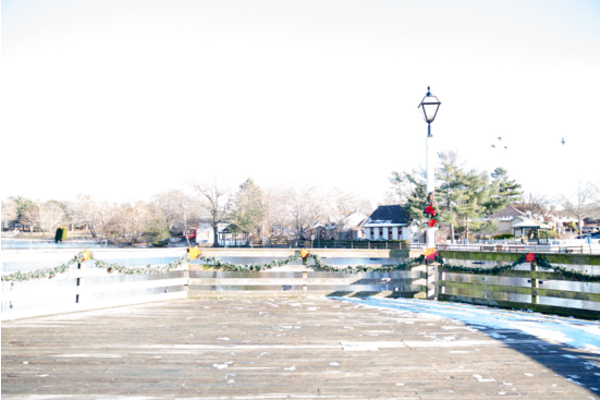 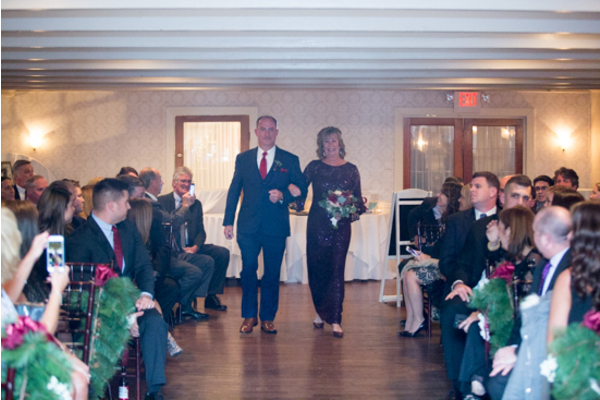 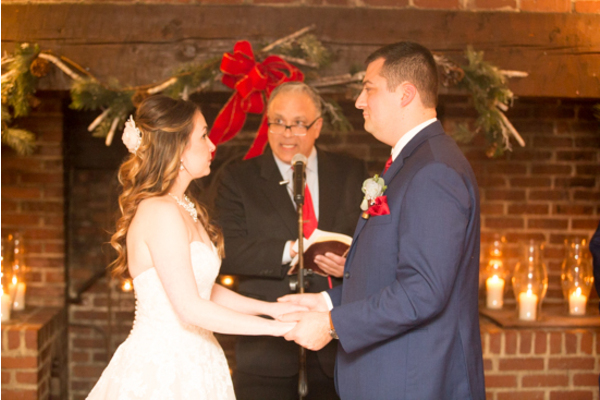 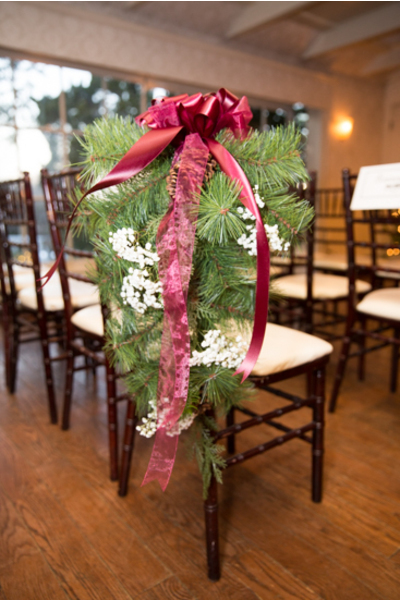 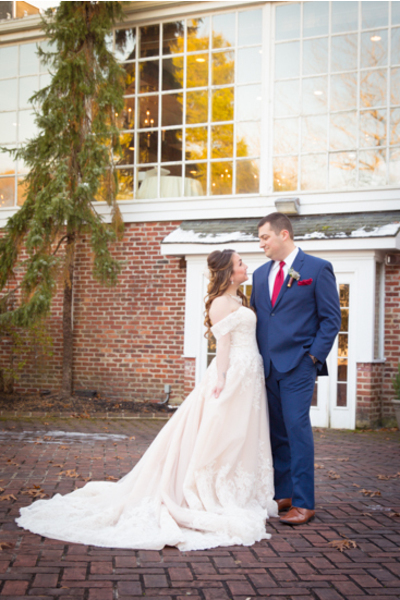 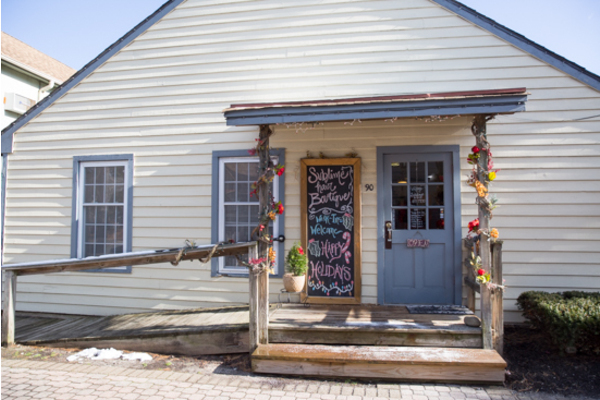 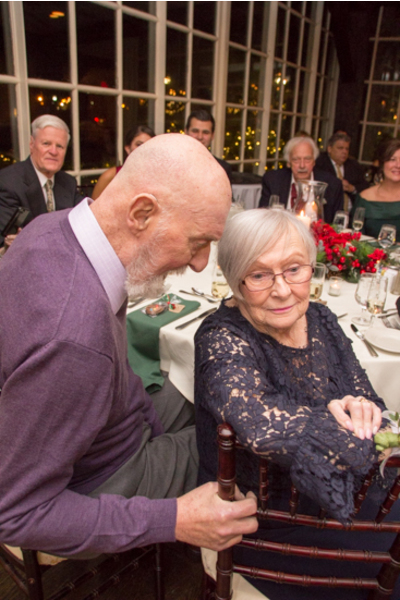 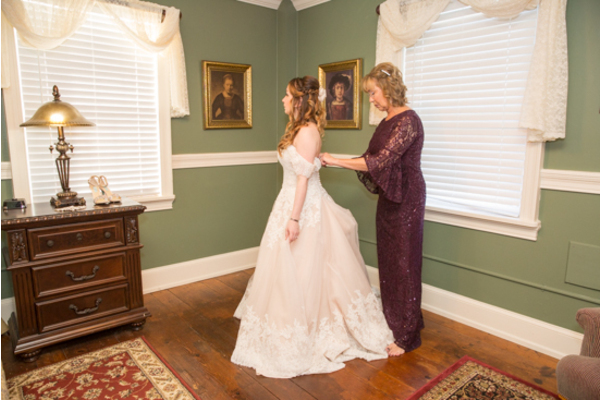 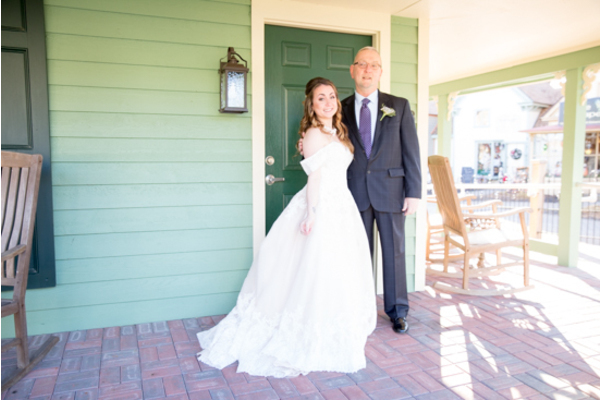 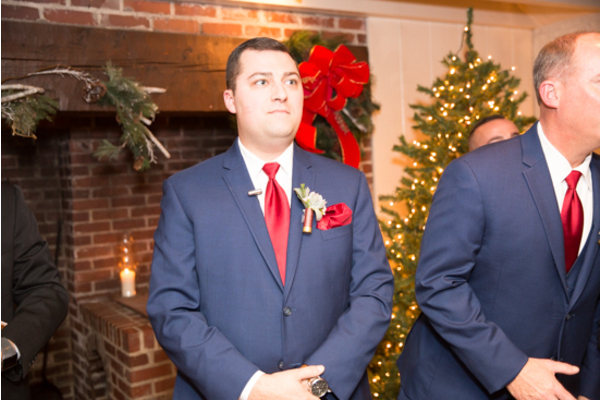 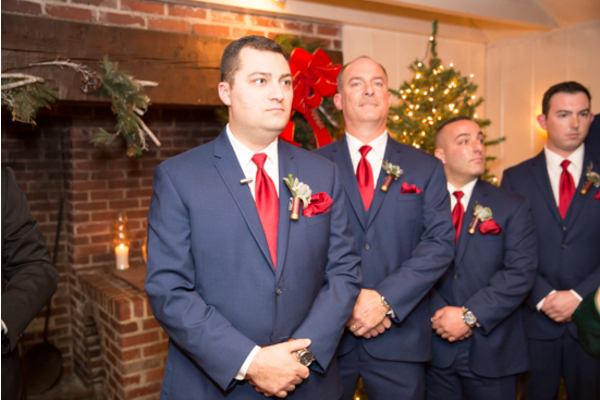 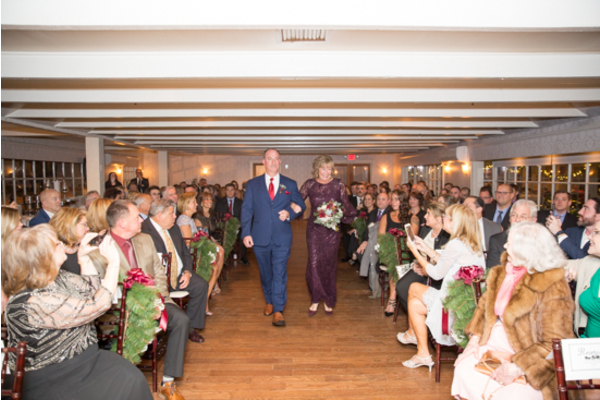 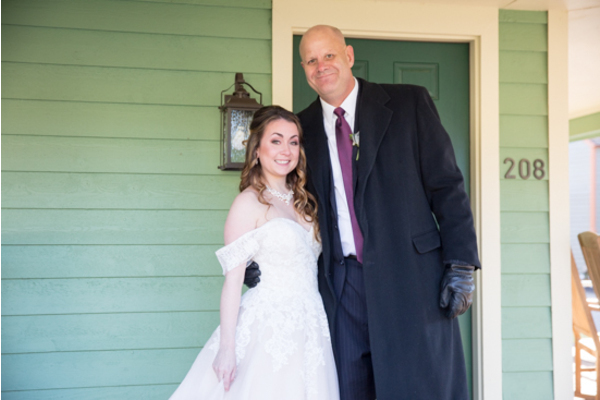 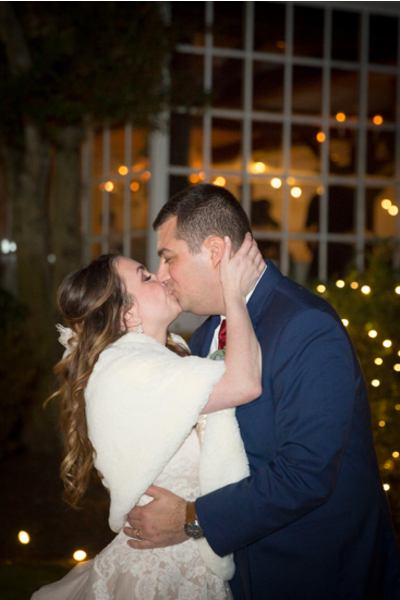 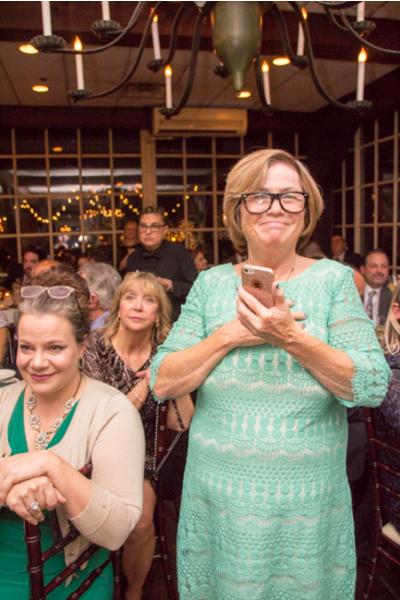 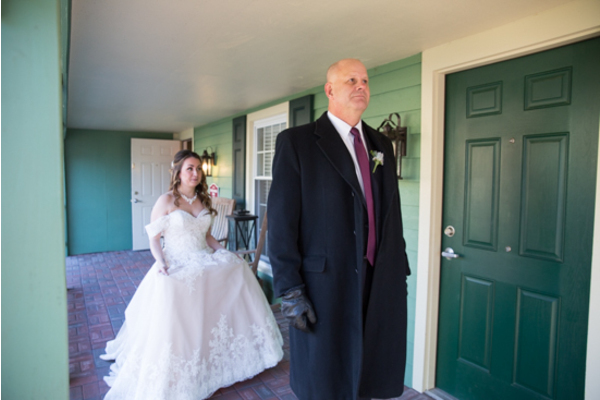 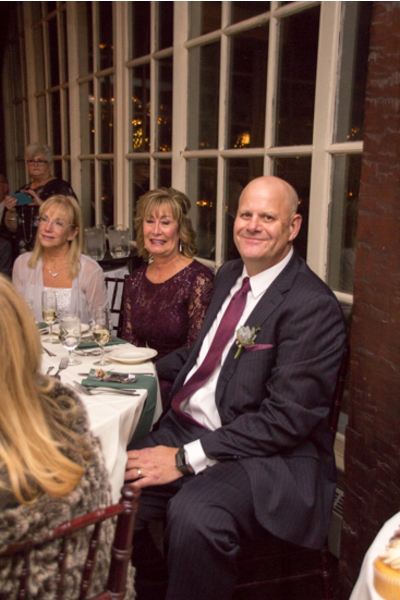 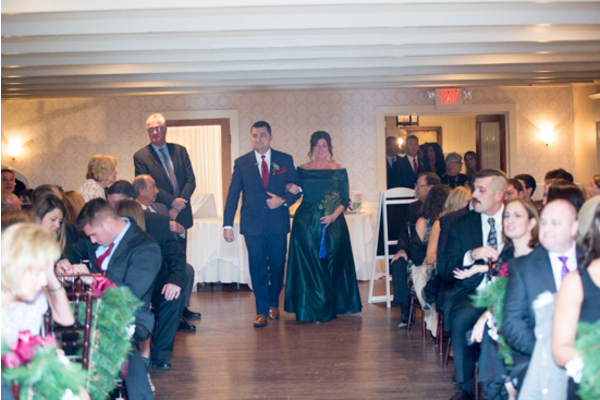 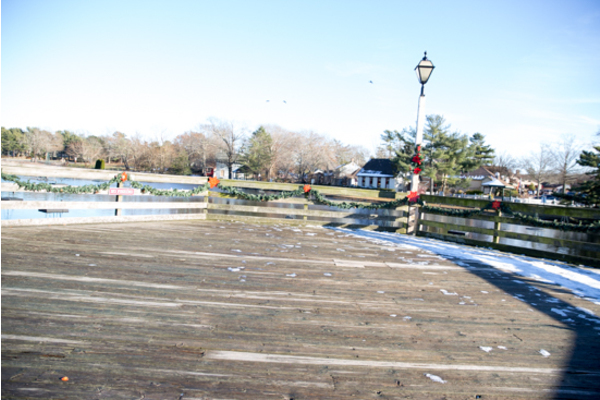 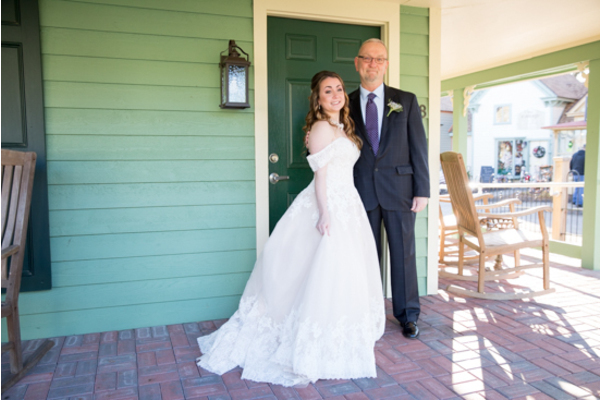 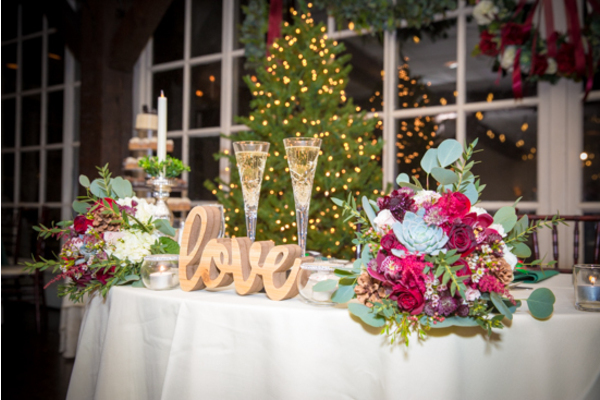 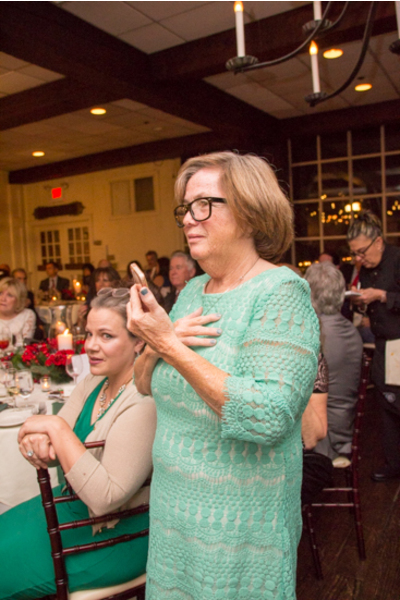 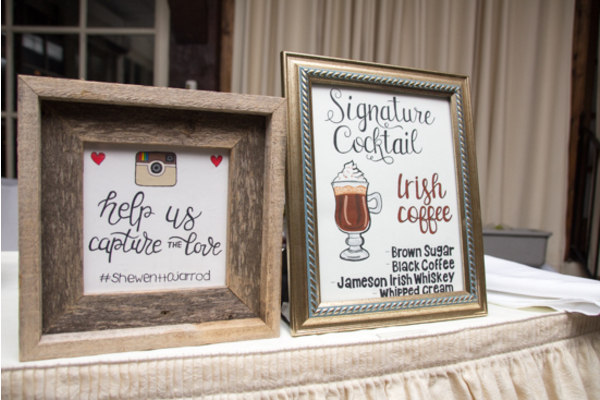 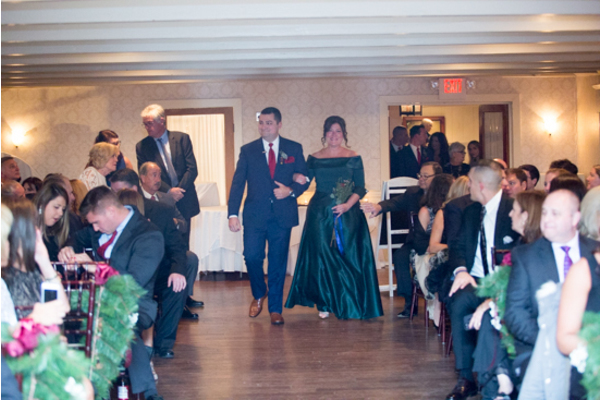 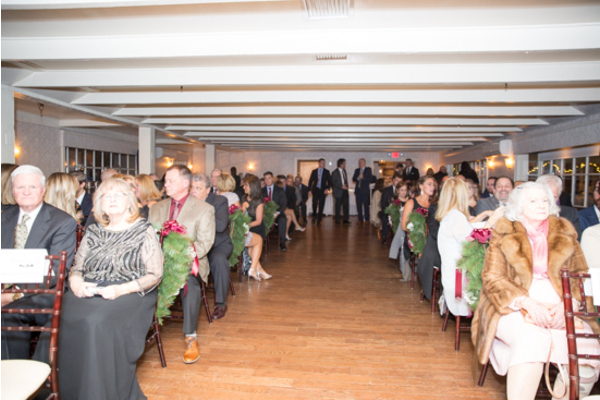 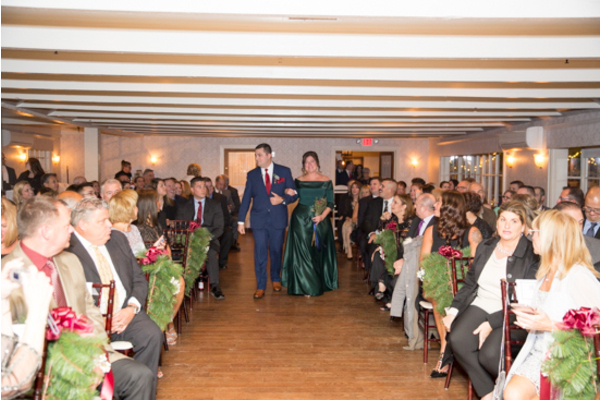 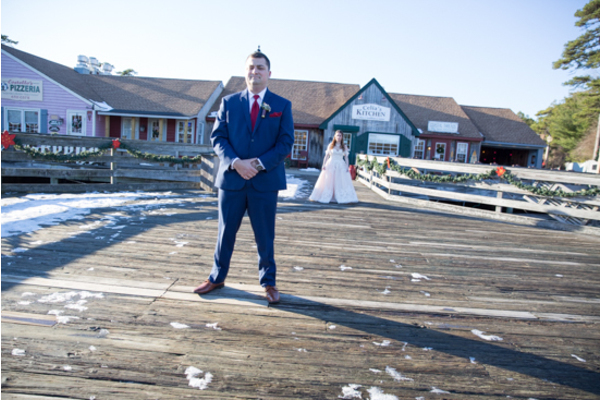 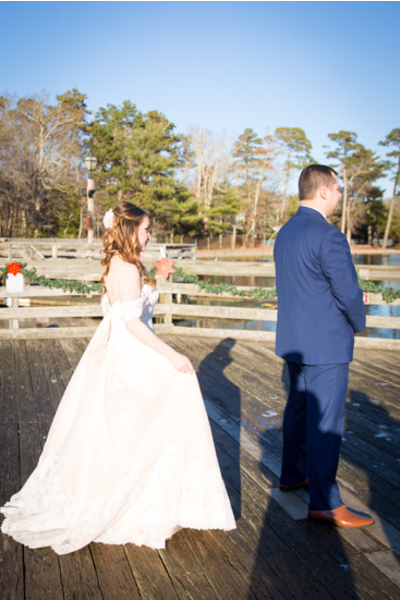 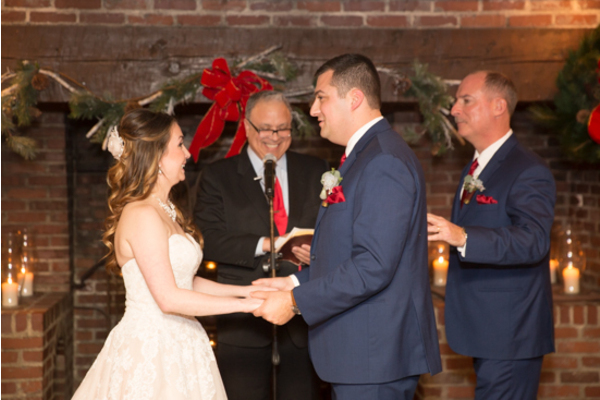 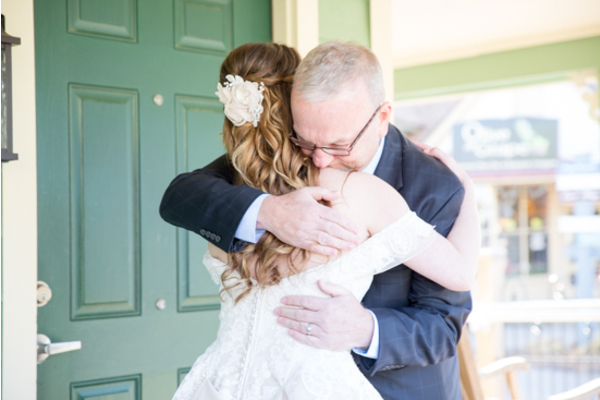 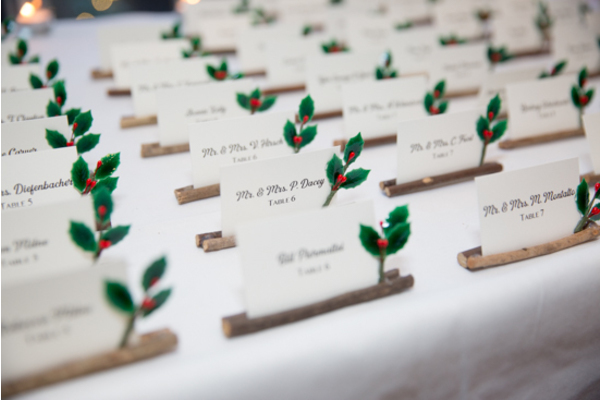 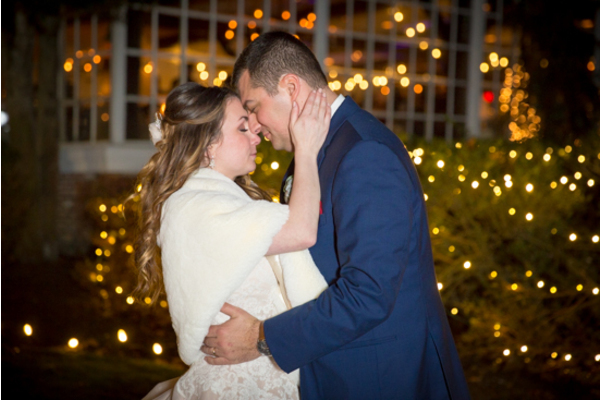 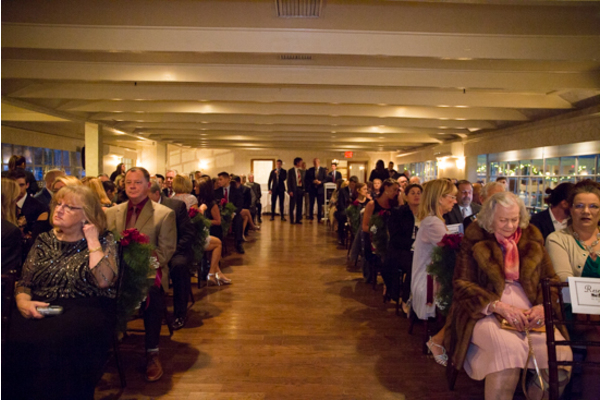 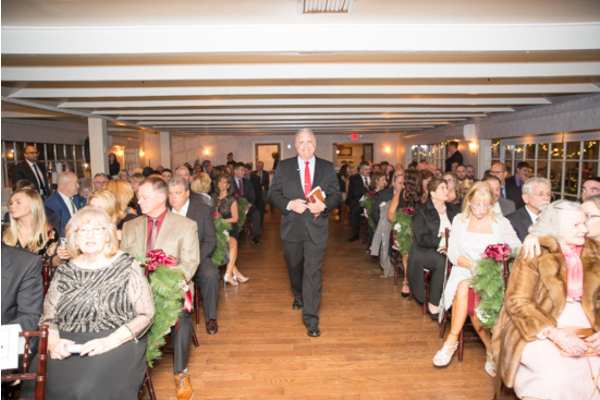 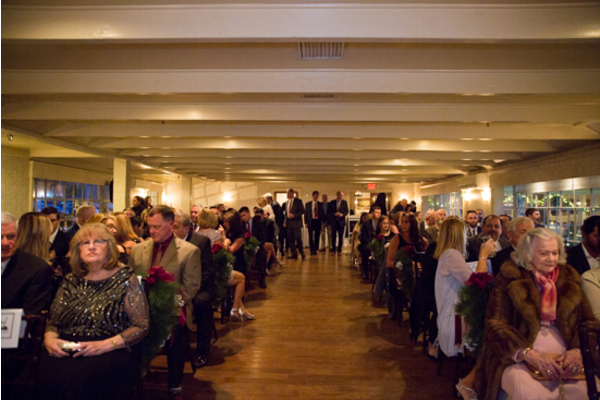 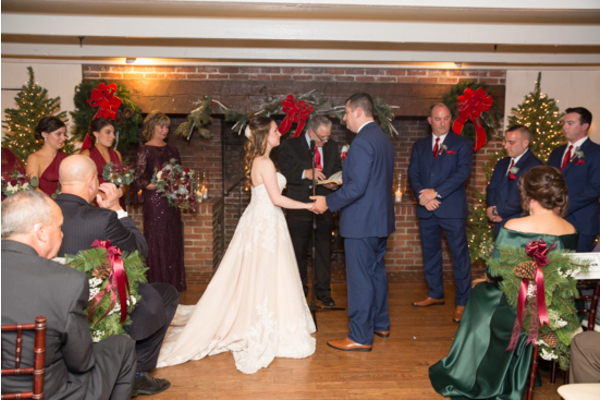 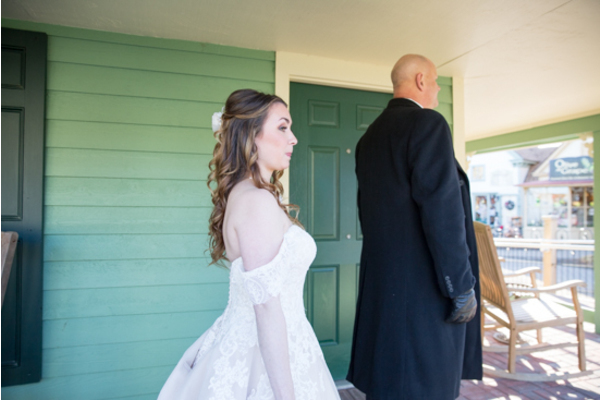 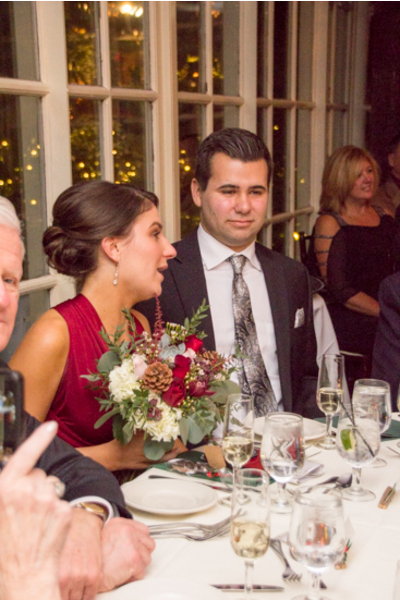 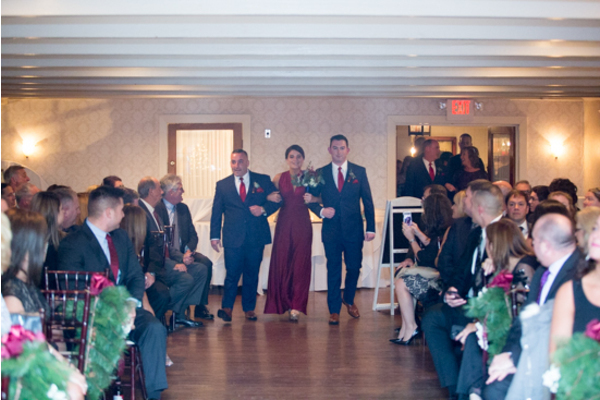 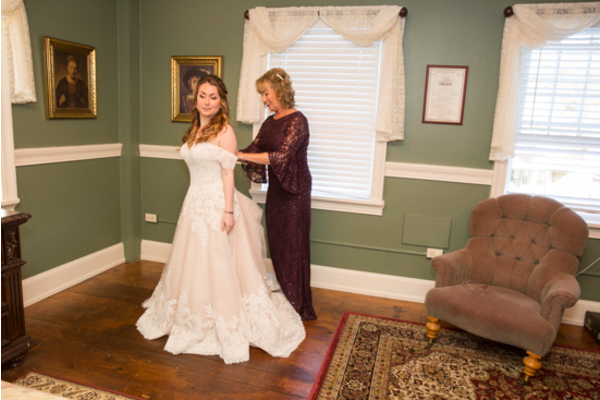 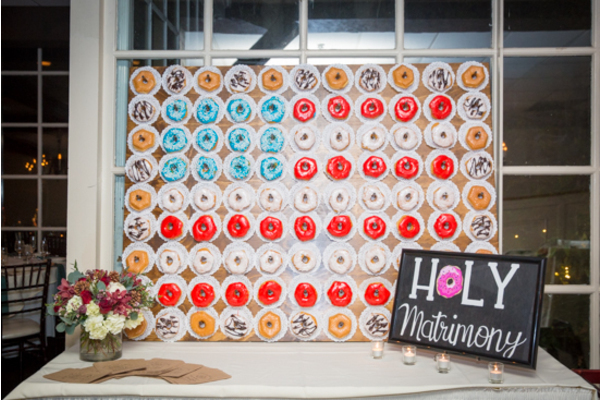 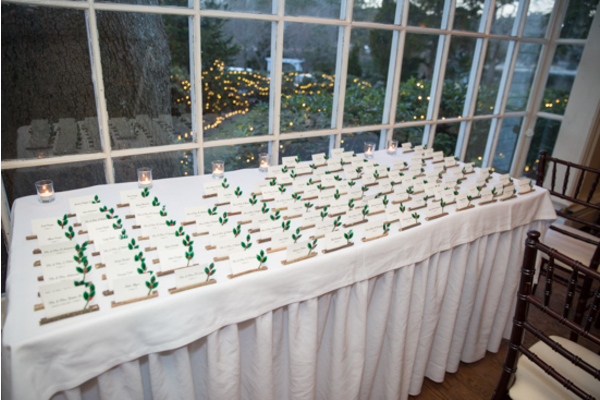 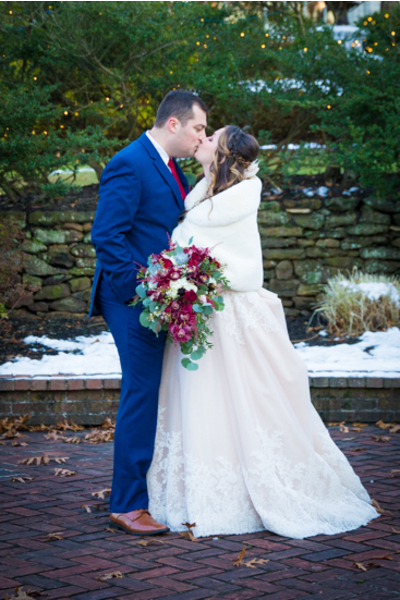 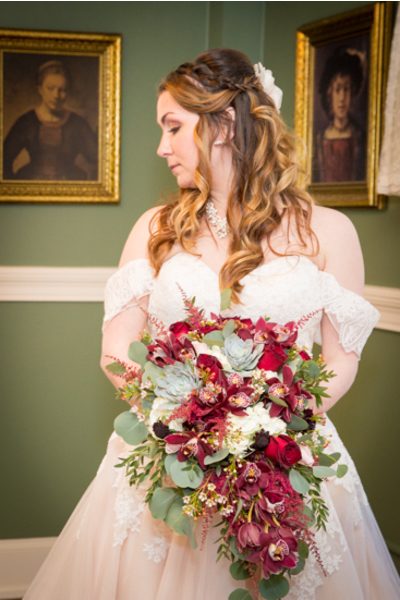 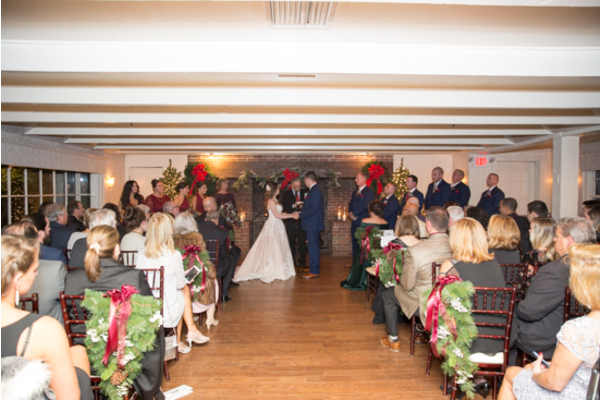 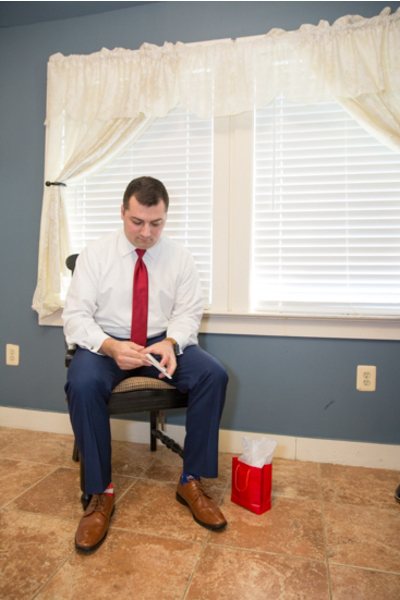 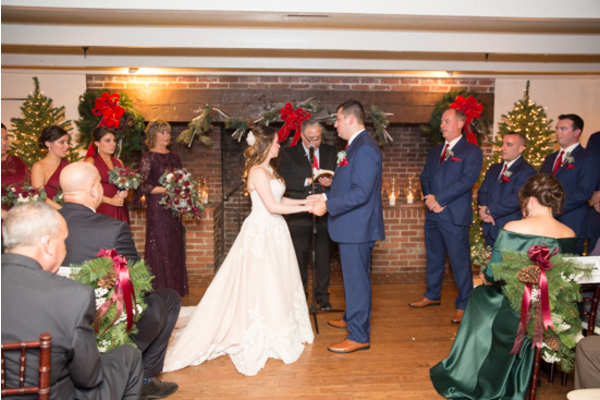 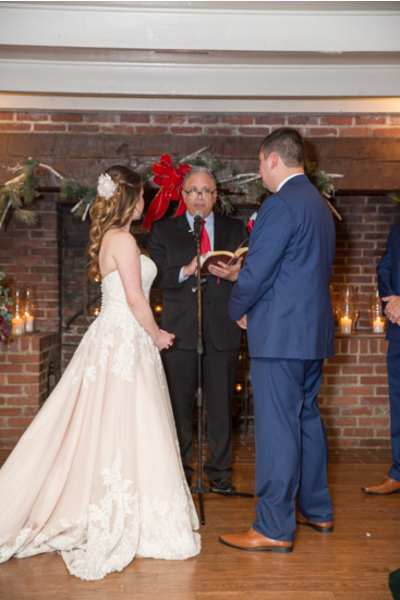 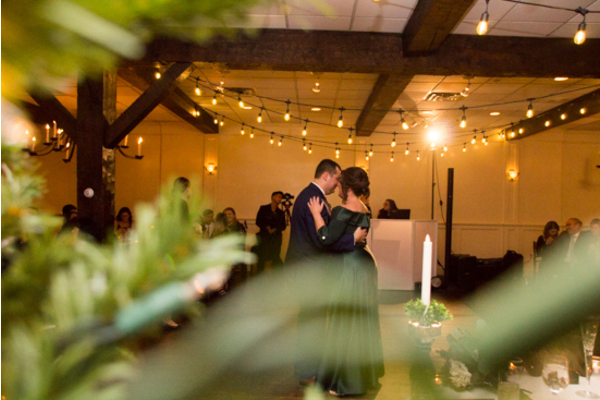 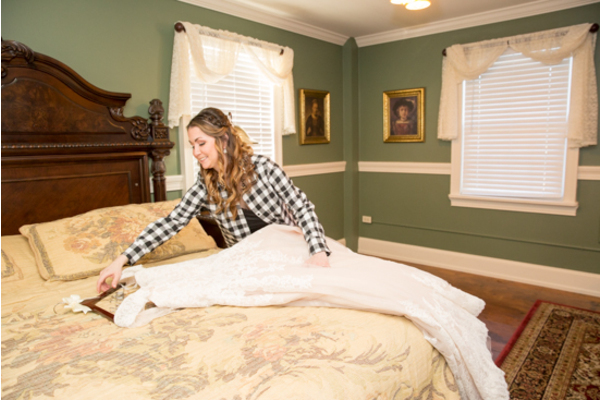 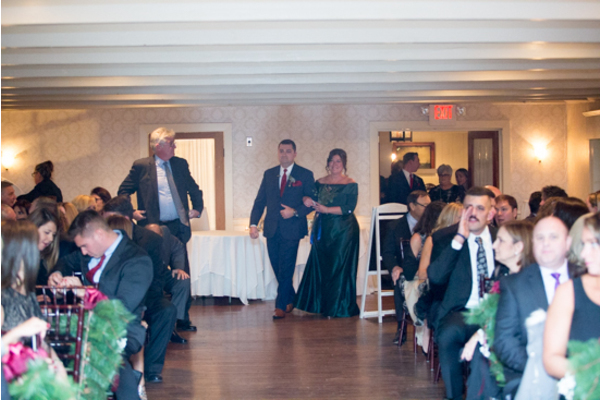 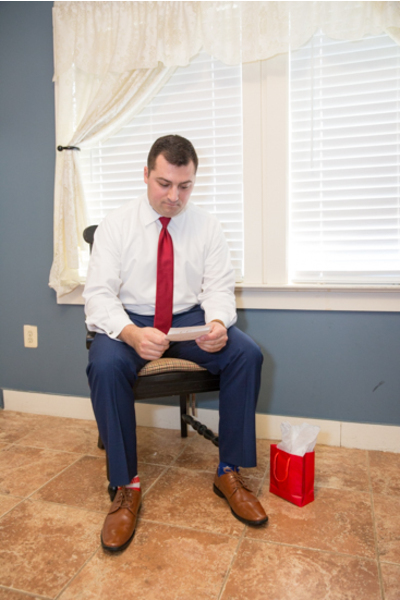 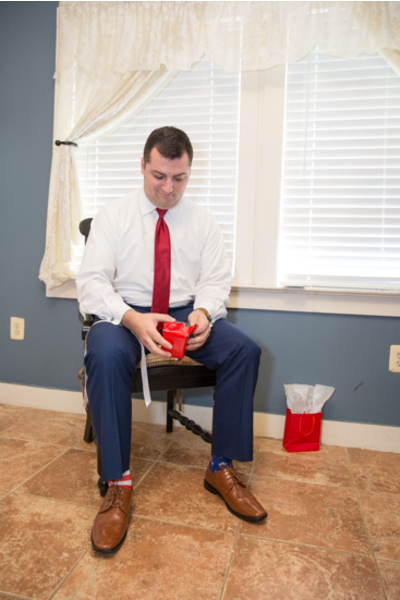 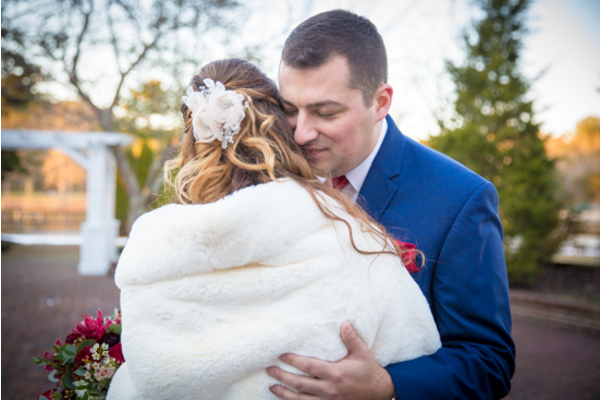 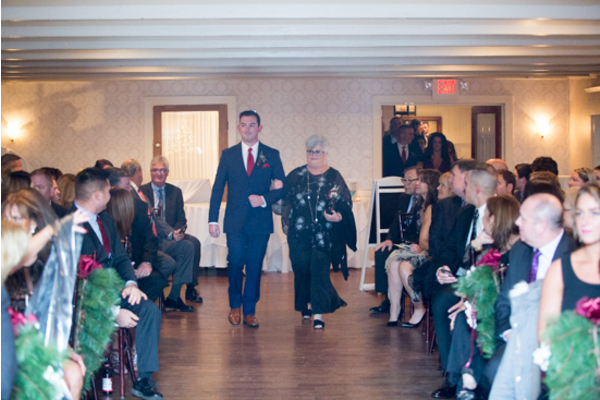 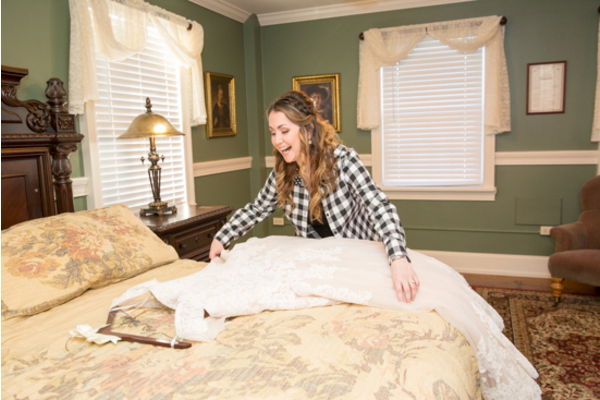 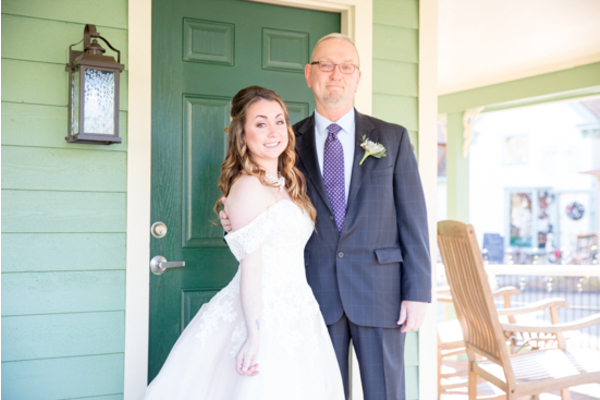 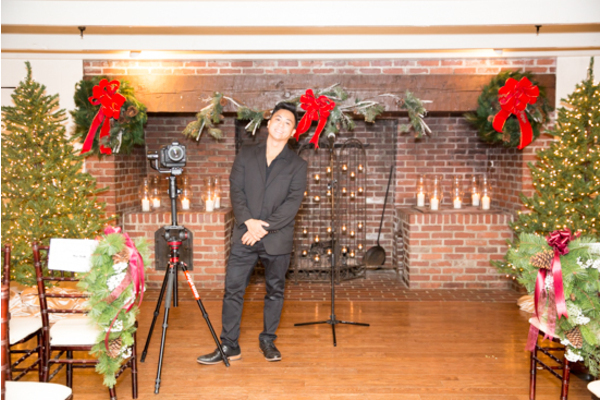 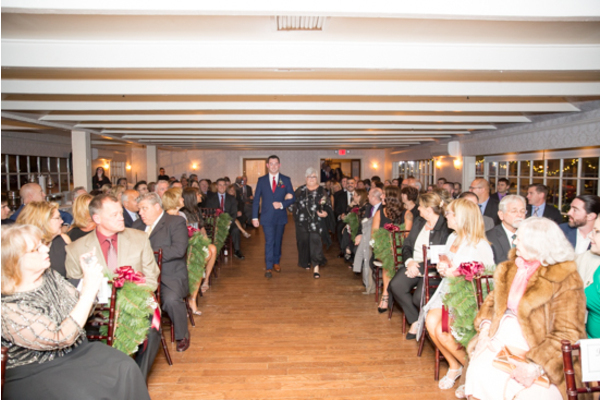 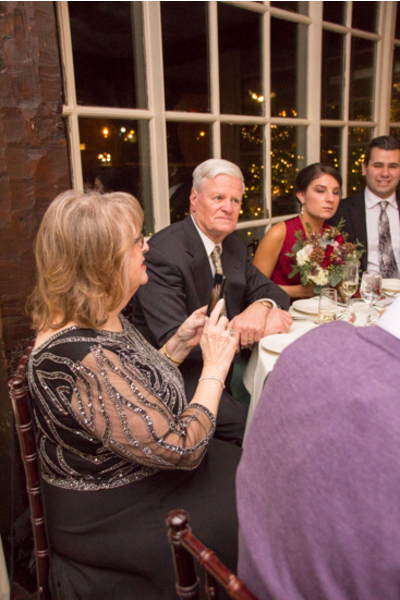 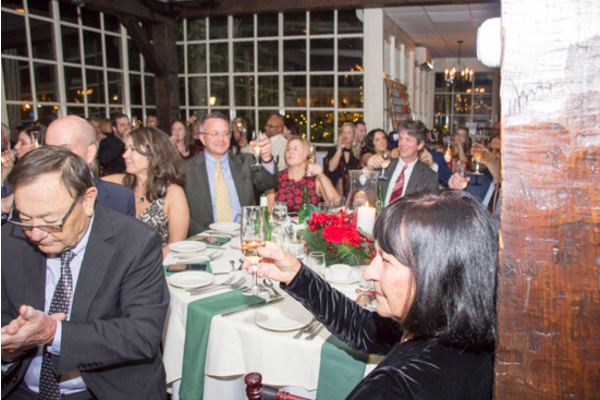 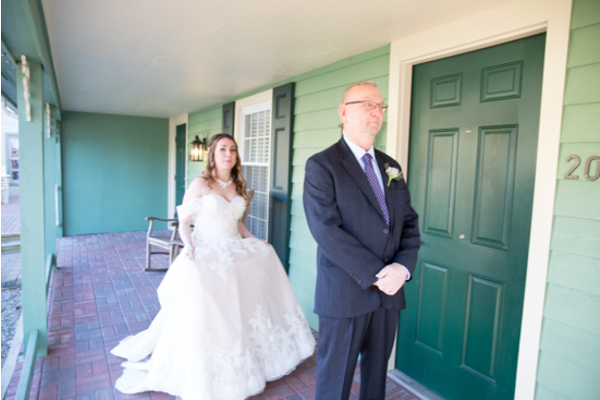 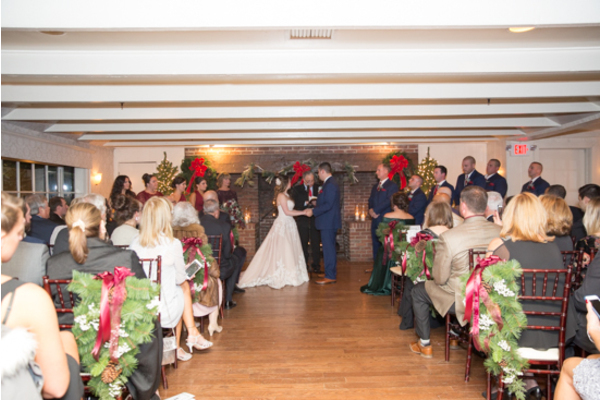 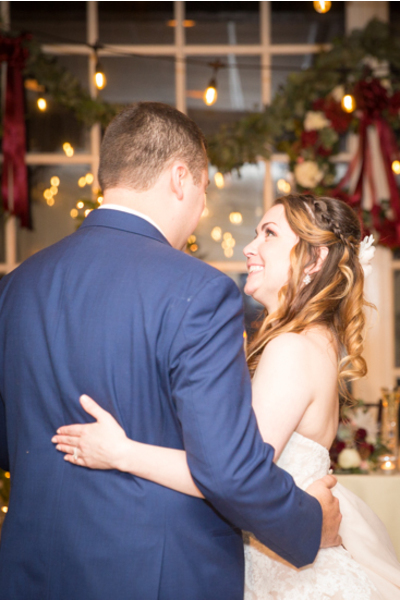 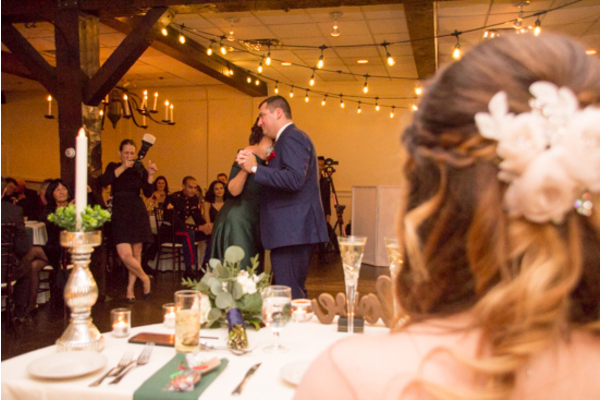 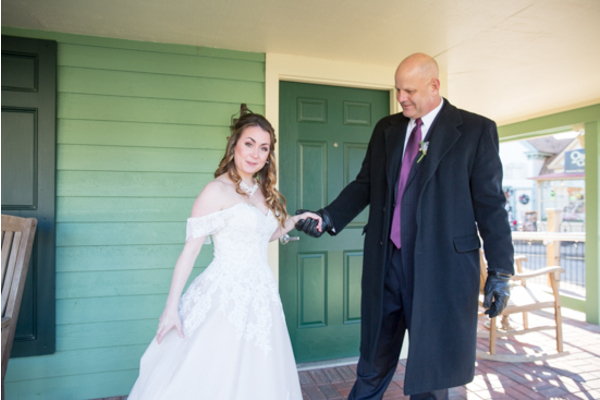 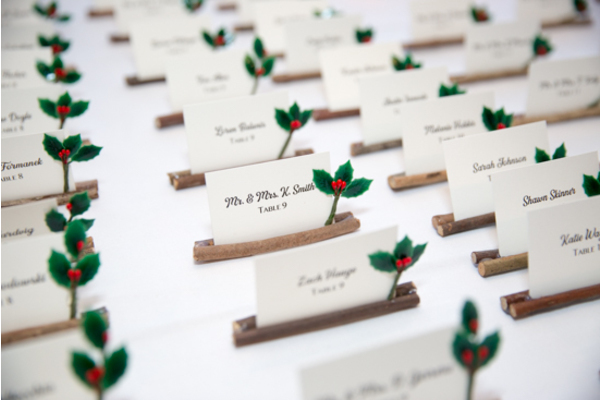 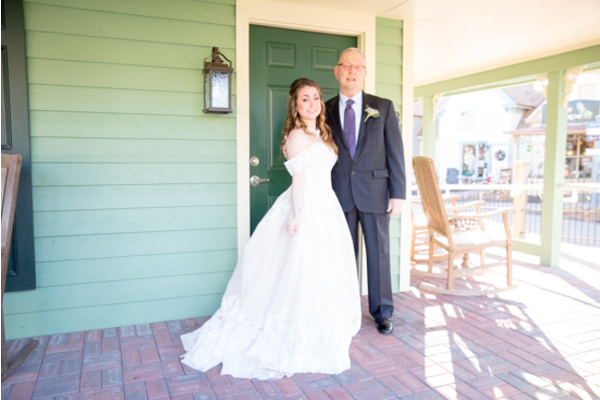 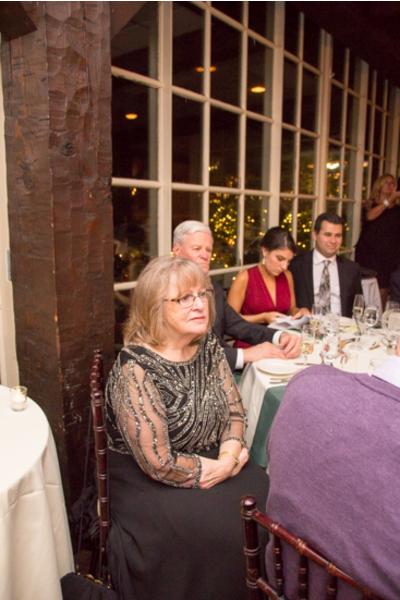 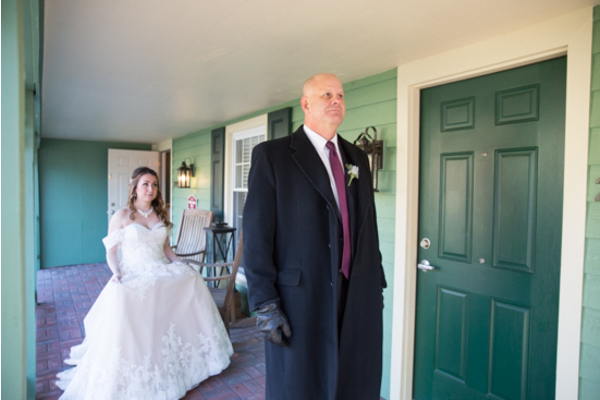 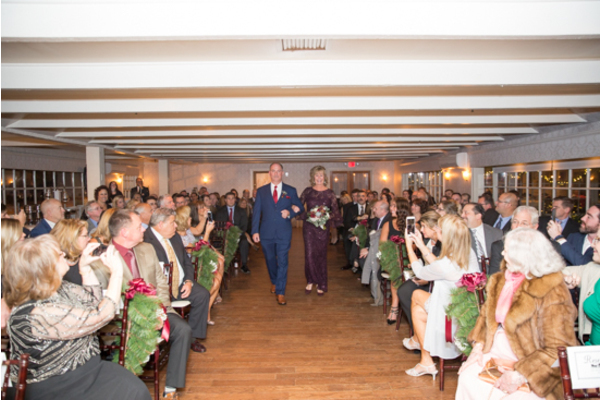 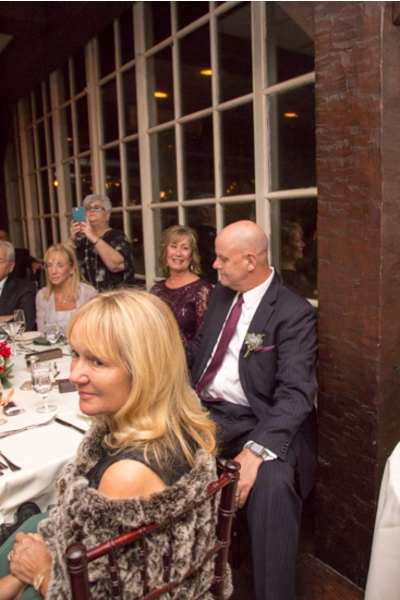 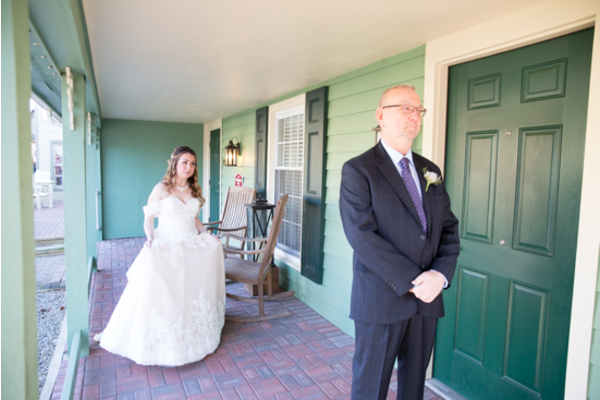 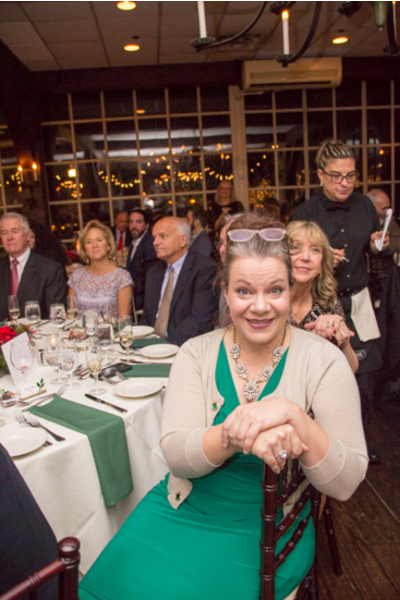 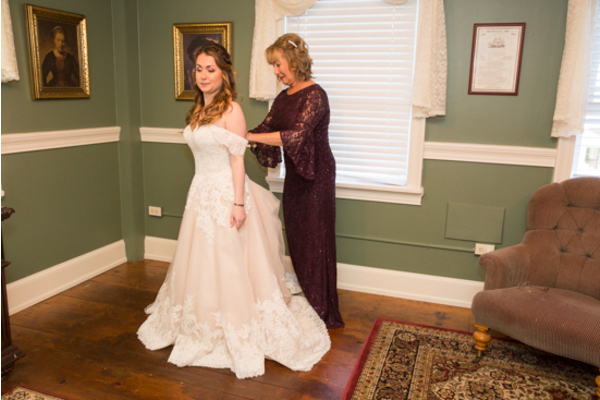 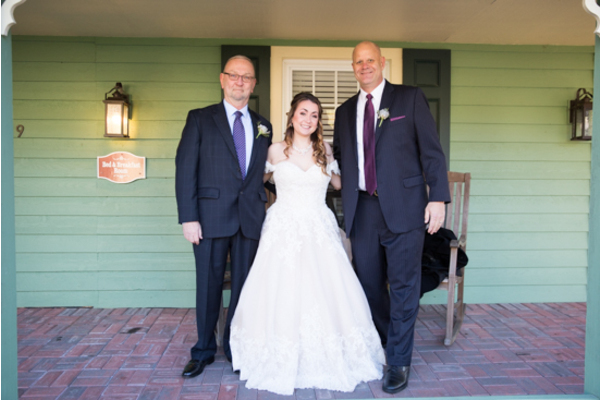 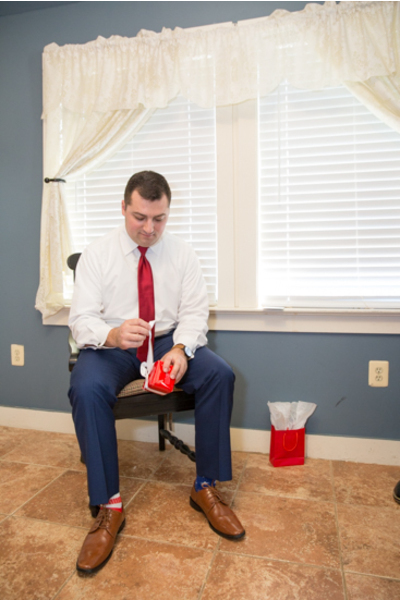 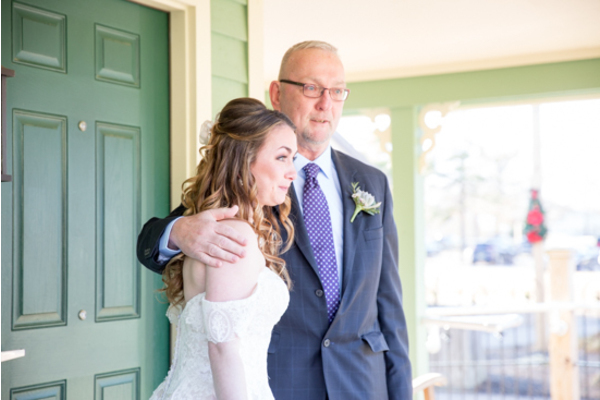 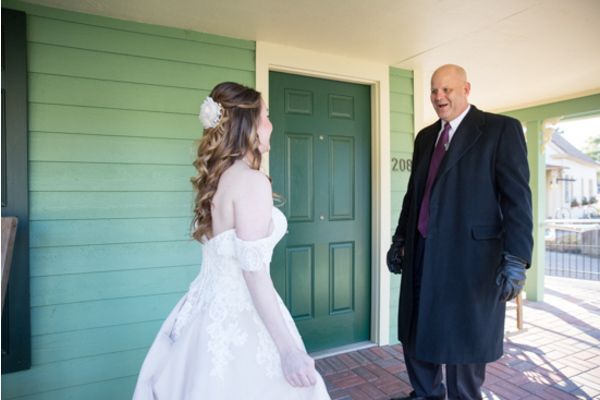 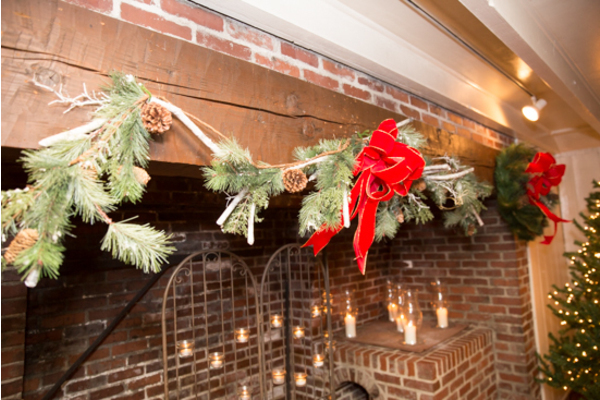 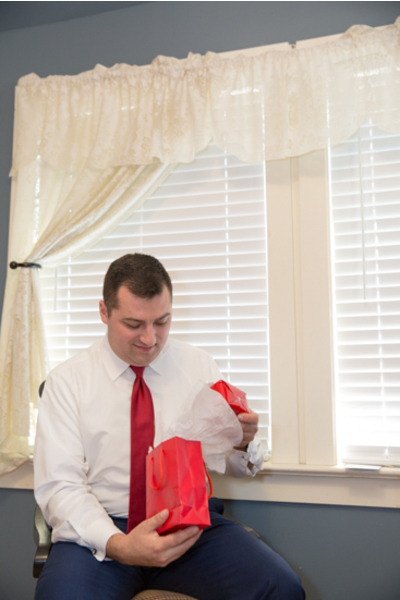 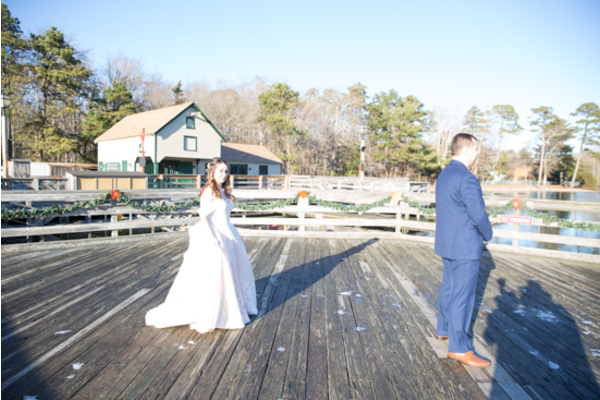 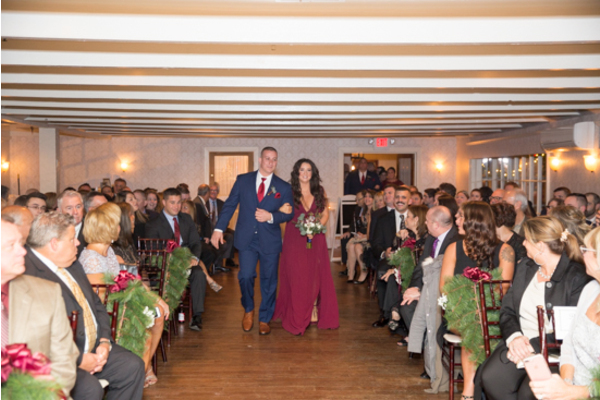 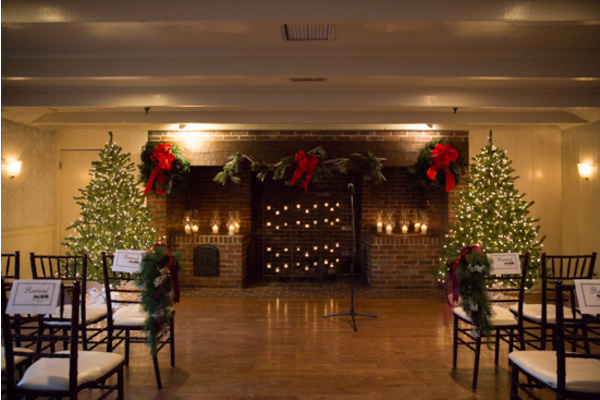 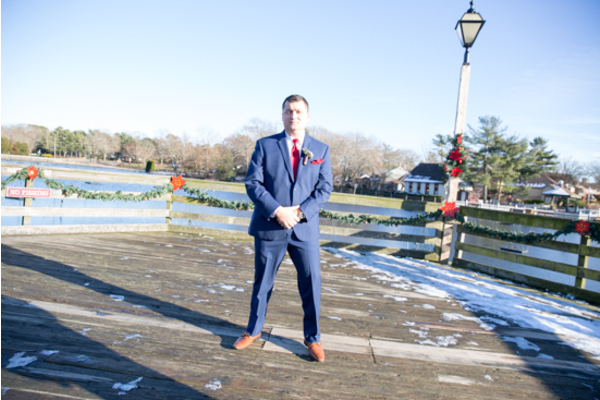 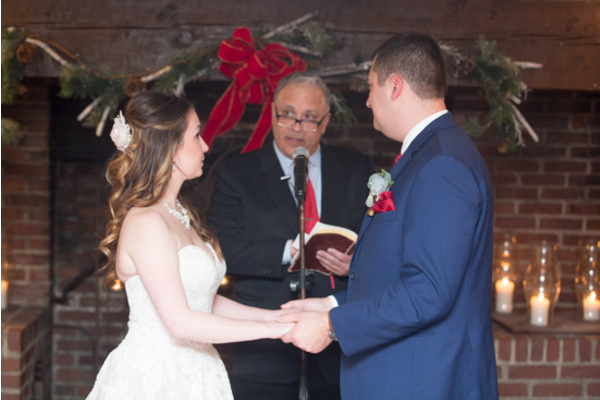 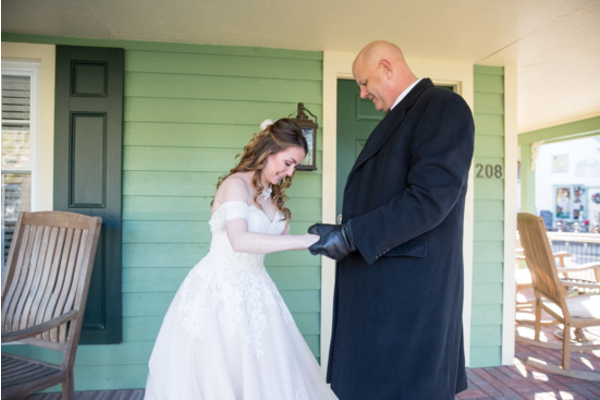 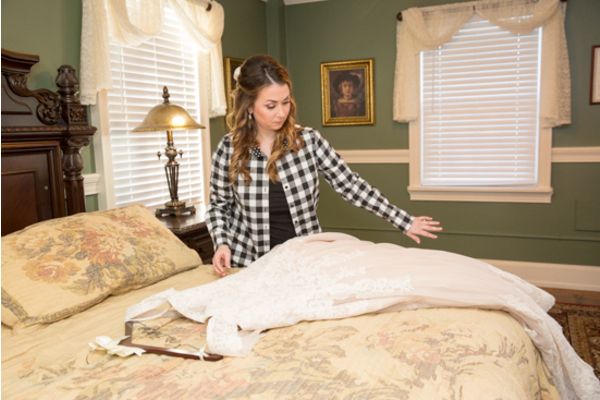 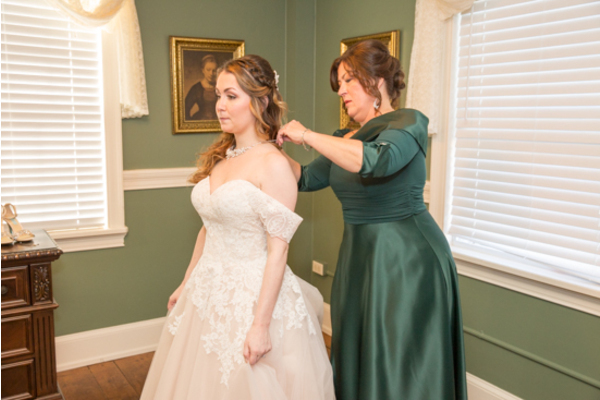 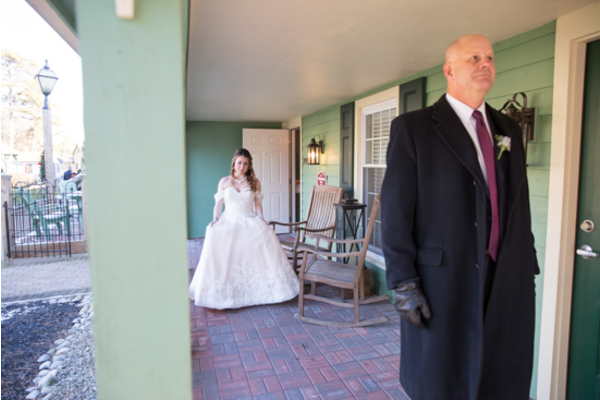 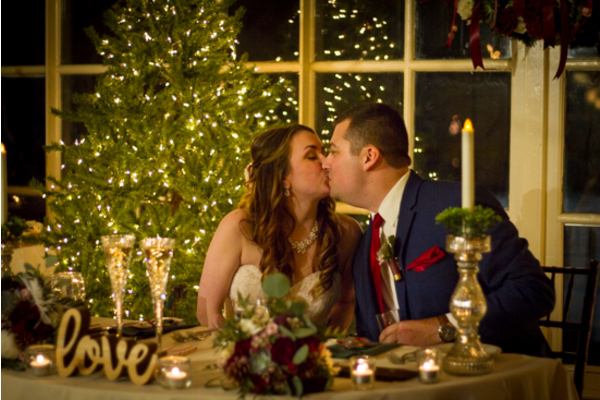 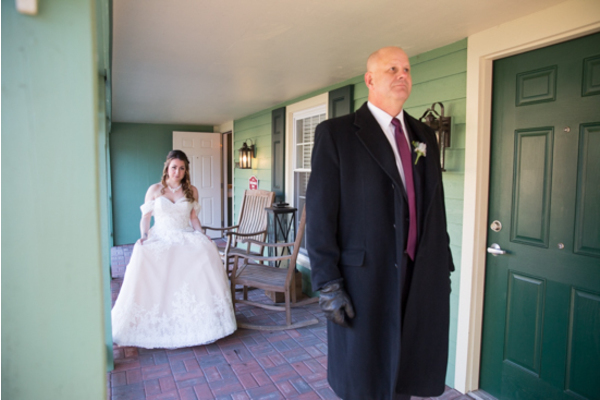 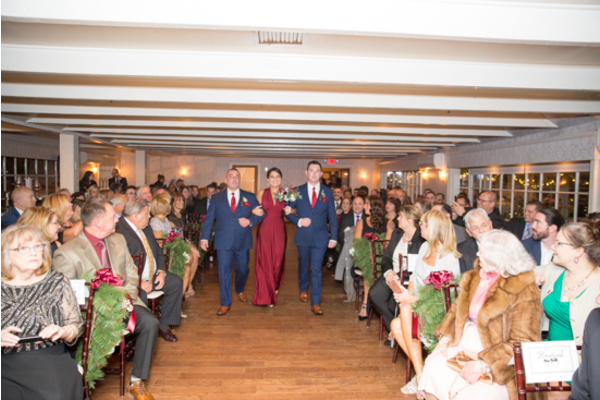 The cozy Smithville Inn was the perfect scenery for a Christmas-themed wedding. 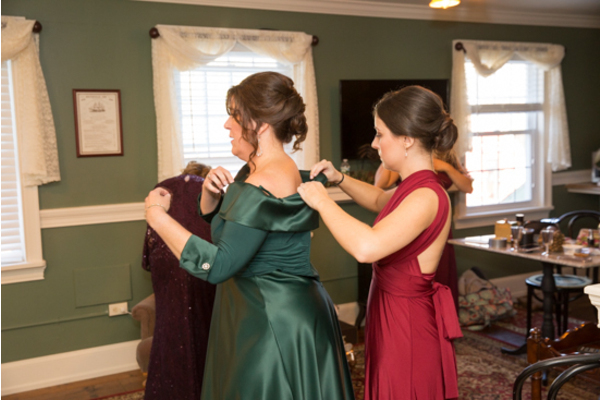 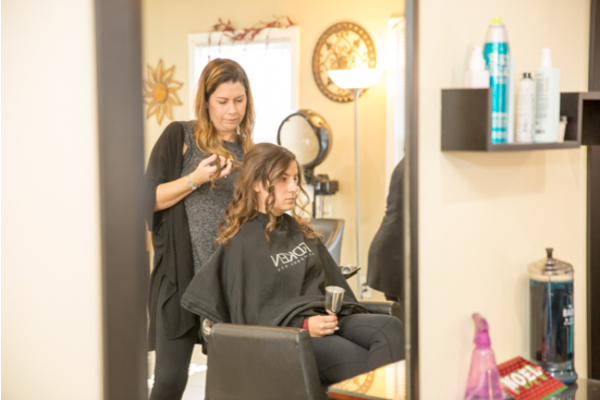 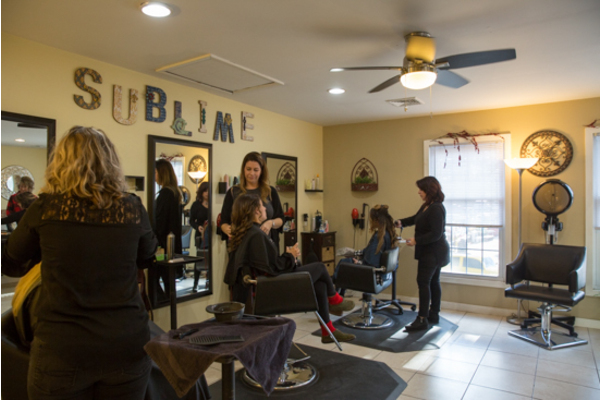 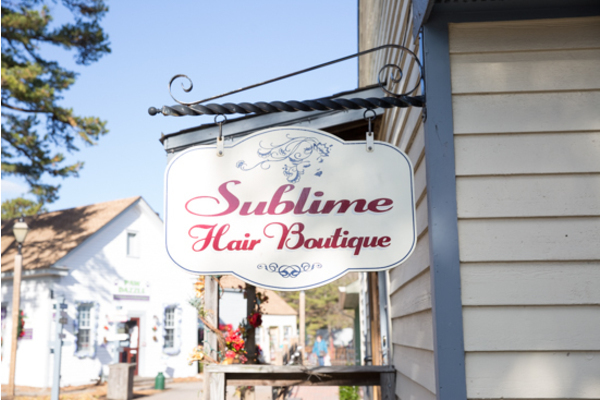 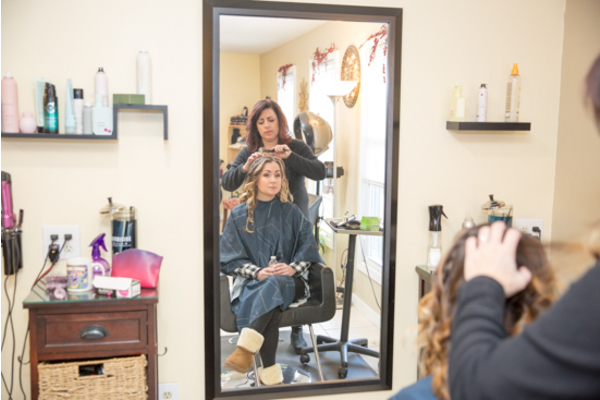 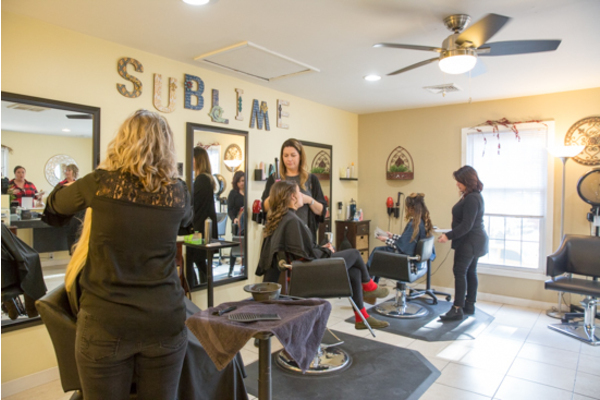 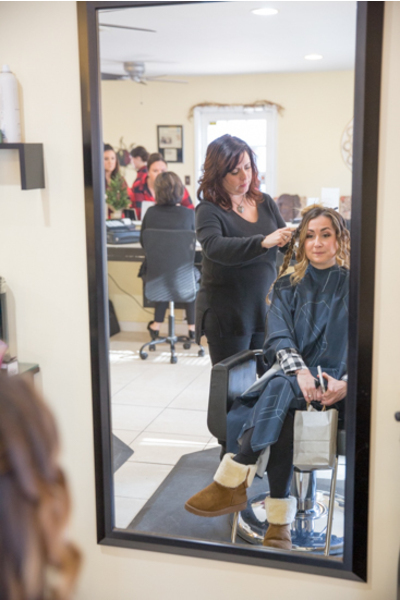 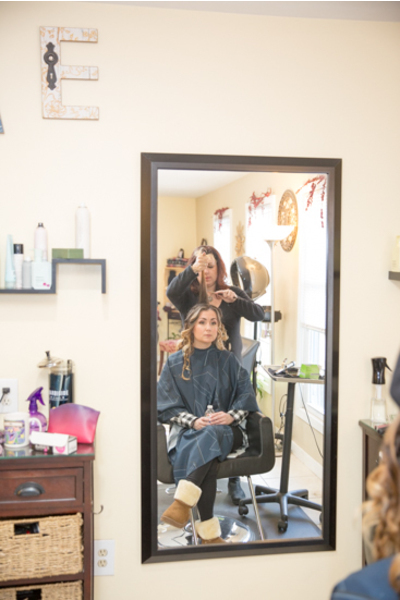 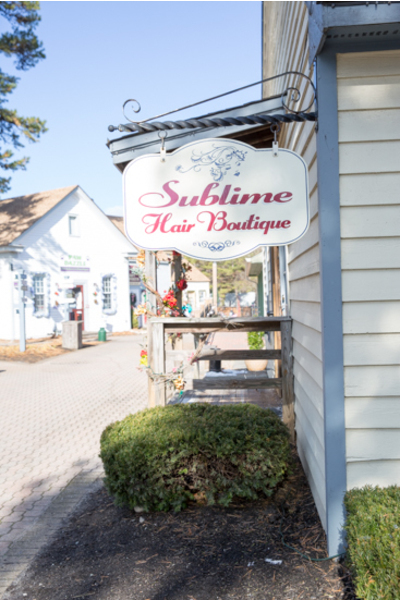 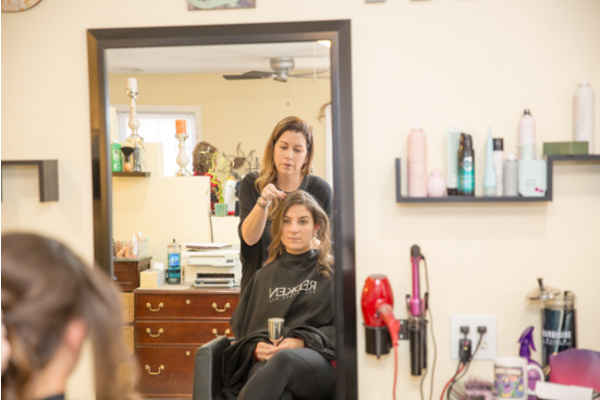 First, the beautiful bride kicked off her winter wedding getting her hair and makeup done at the Sublime Hair Boutique. 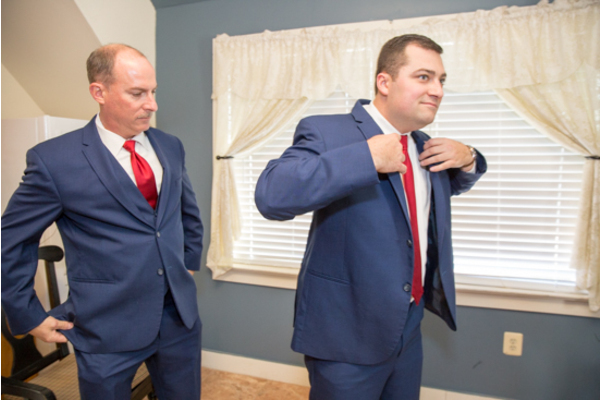 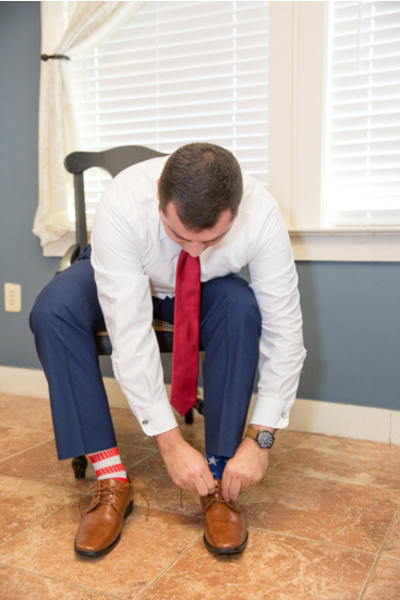 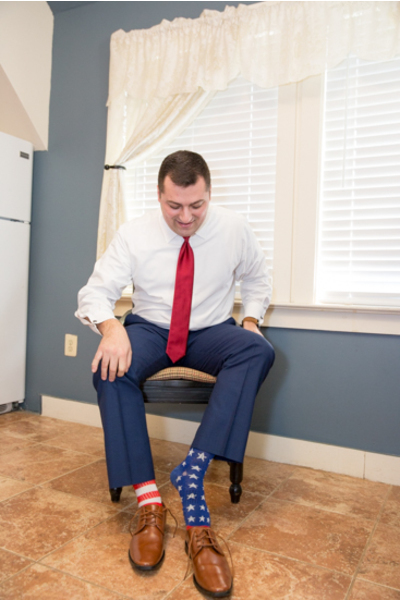 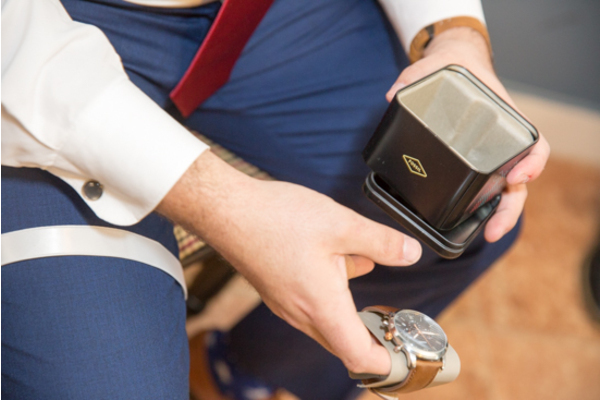 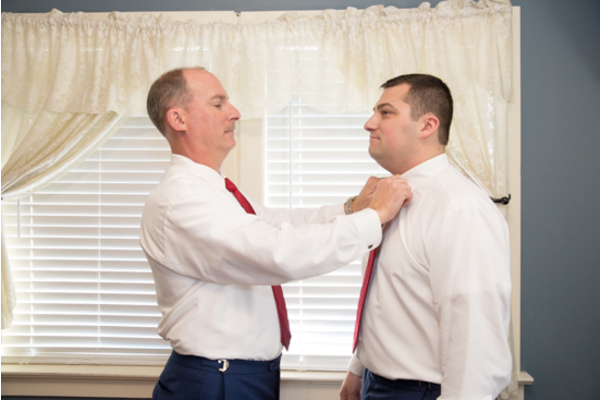 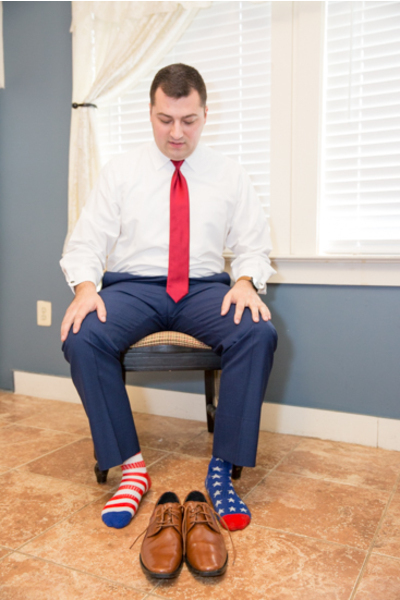 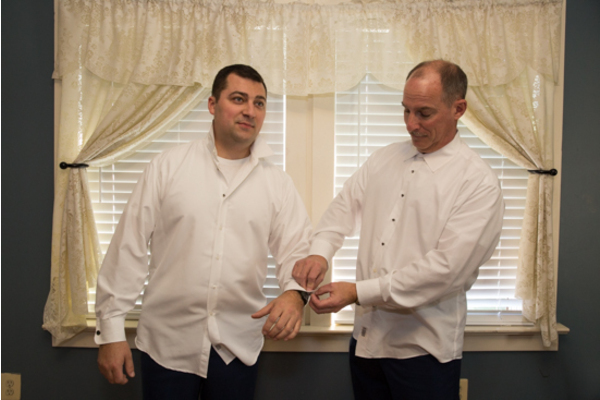 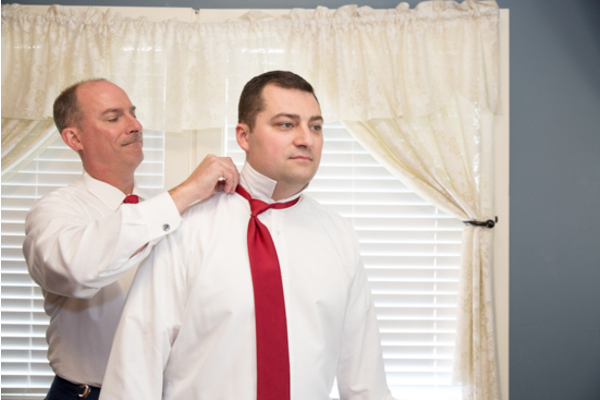 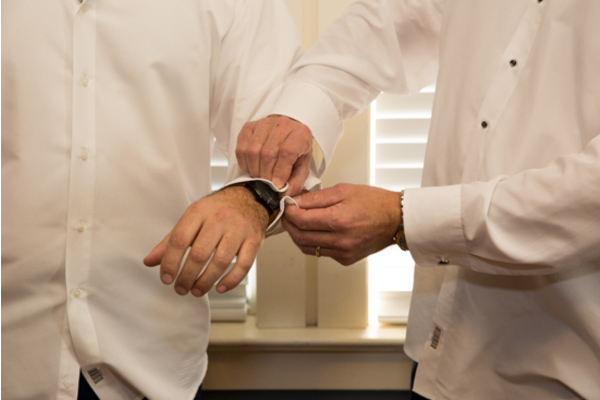 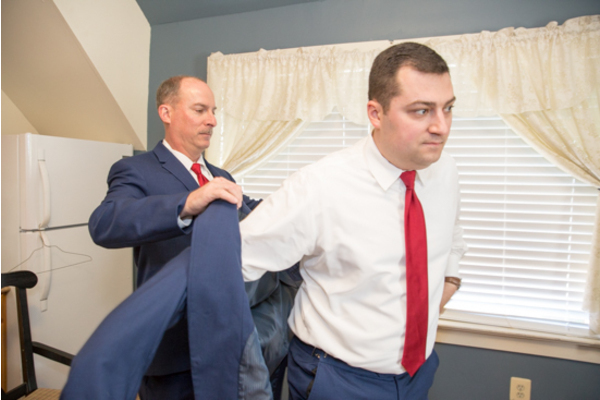 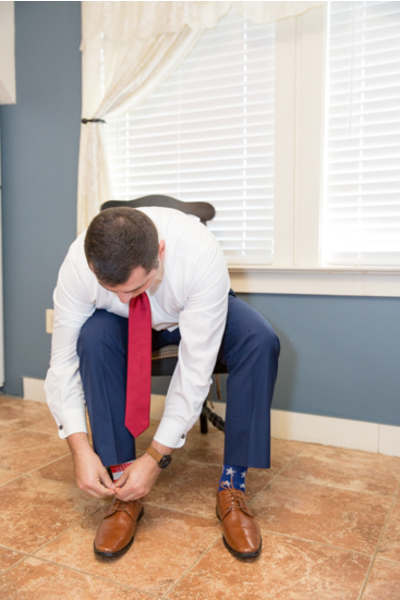 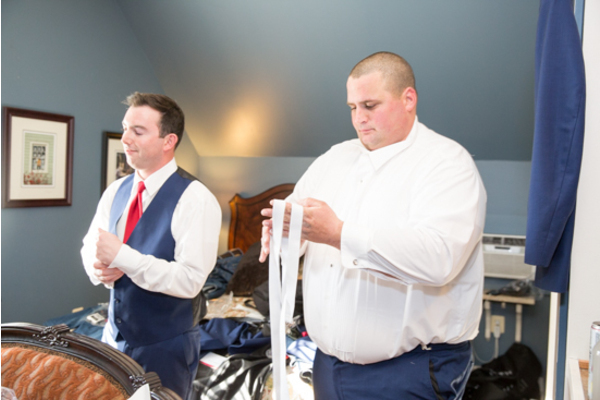 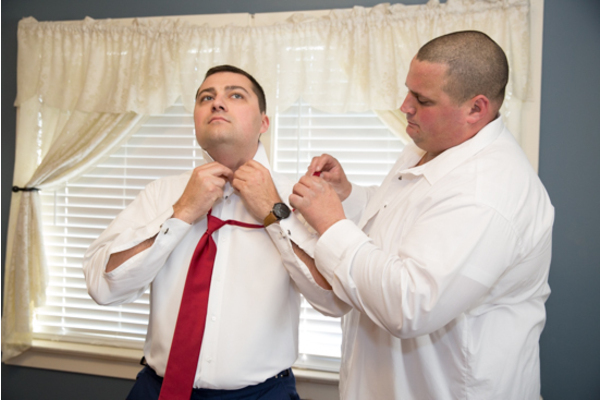 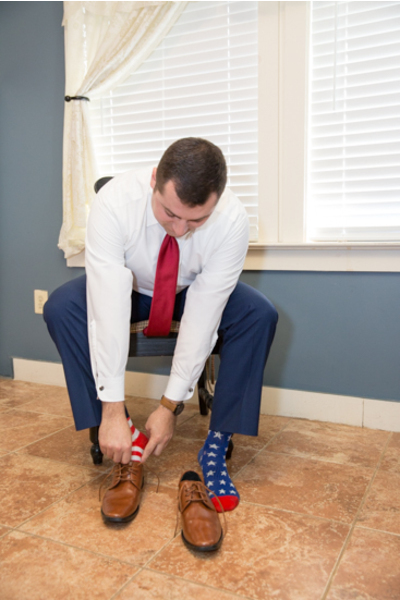 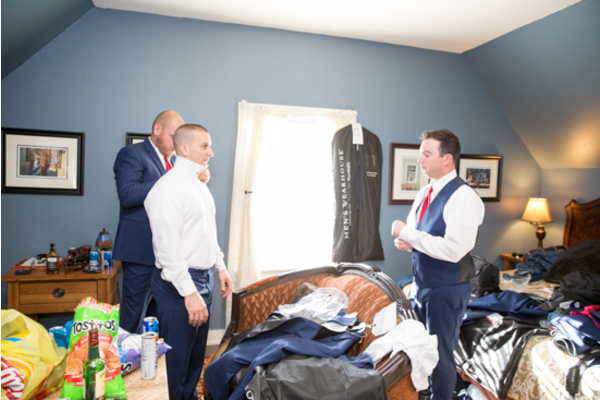 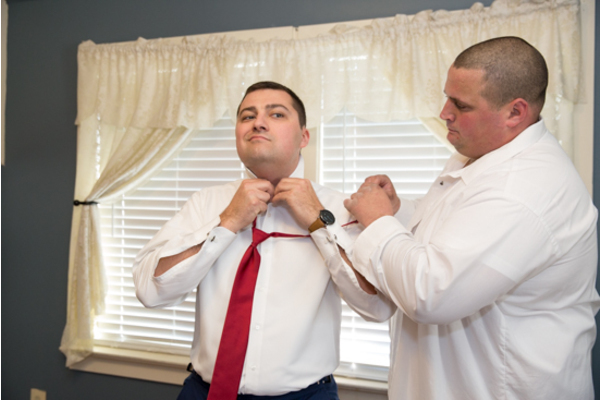 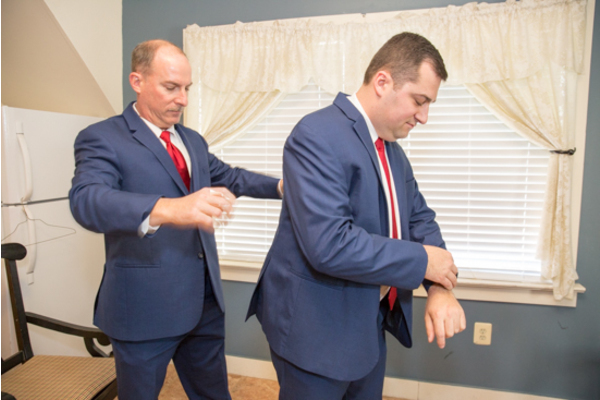 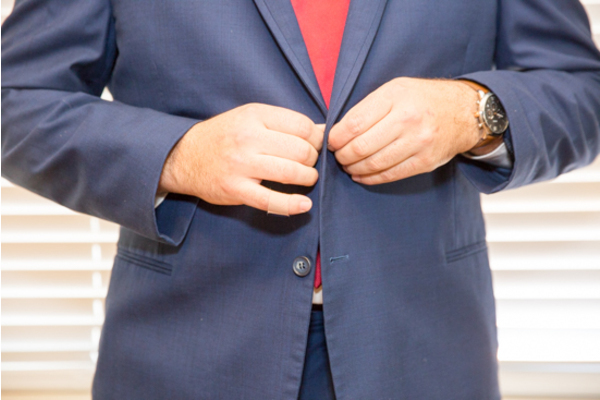 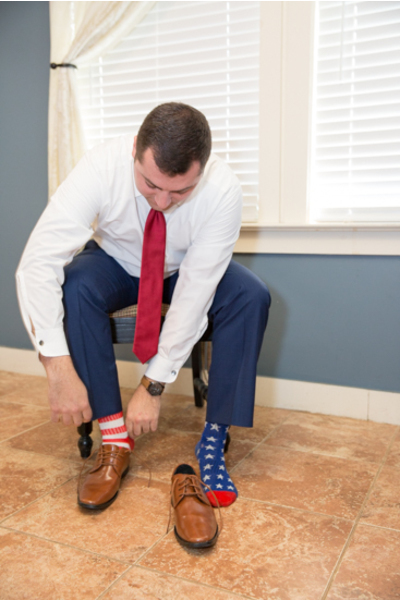 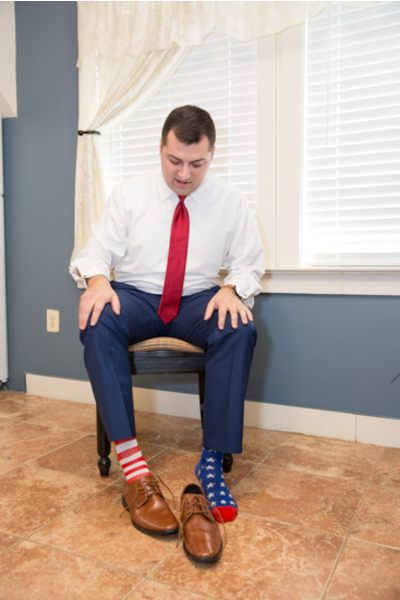 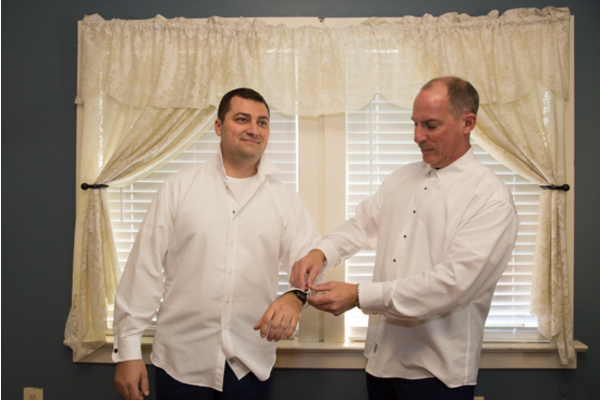 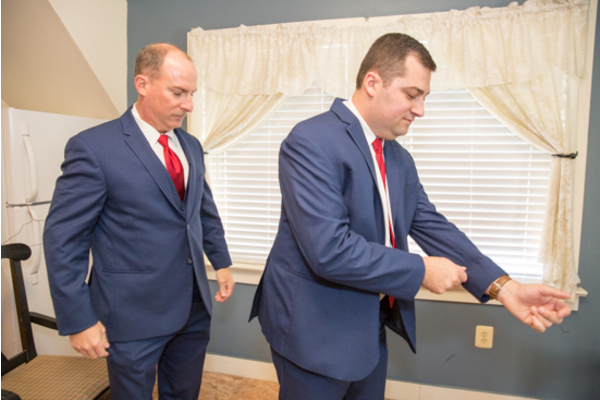 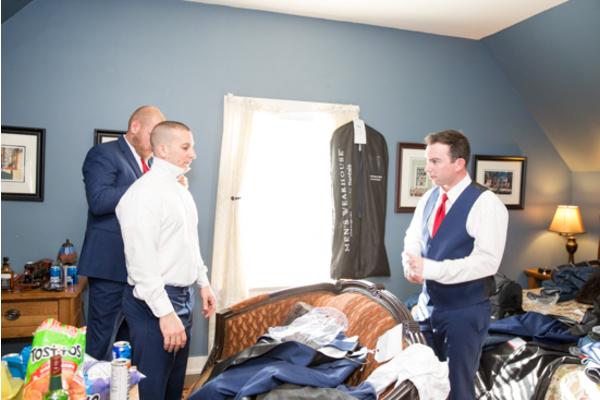 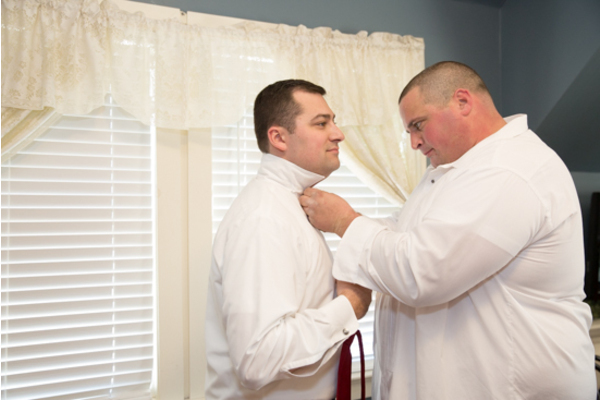 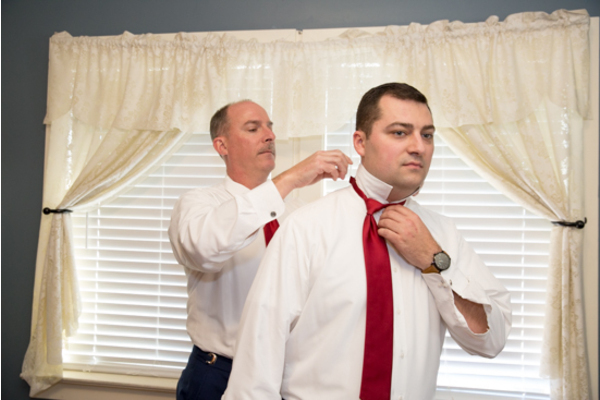 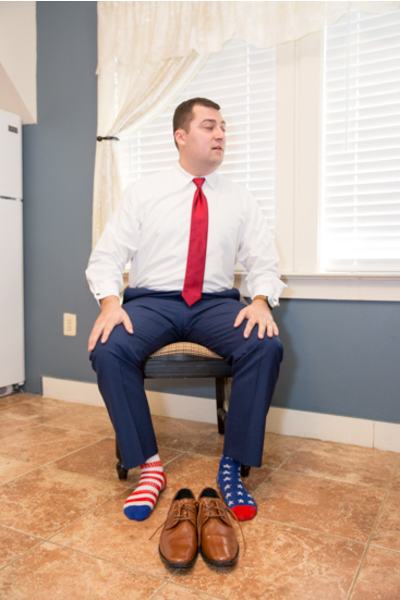 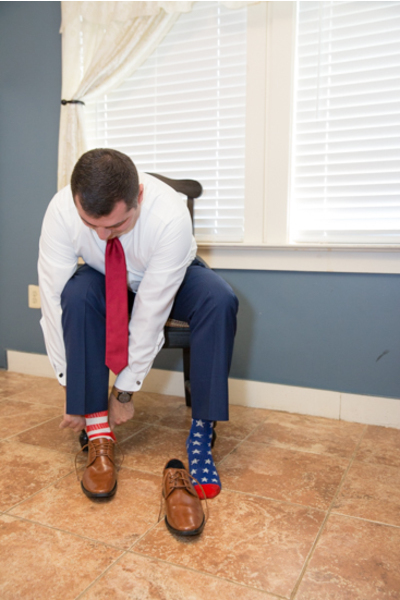 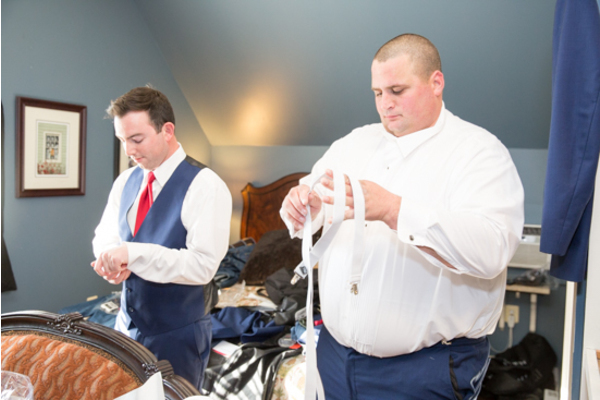 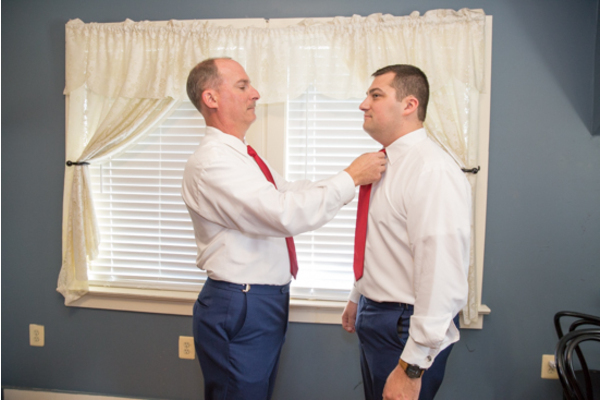 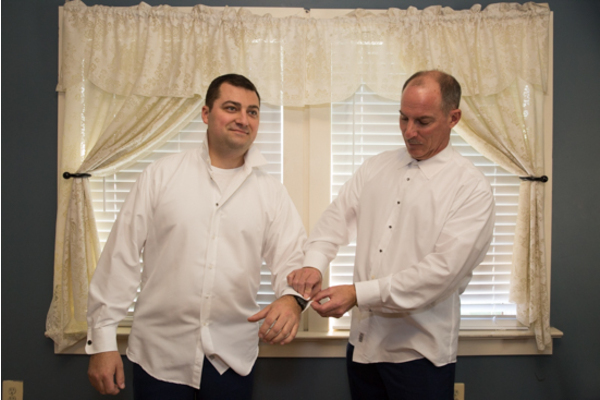 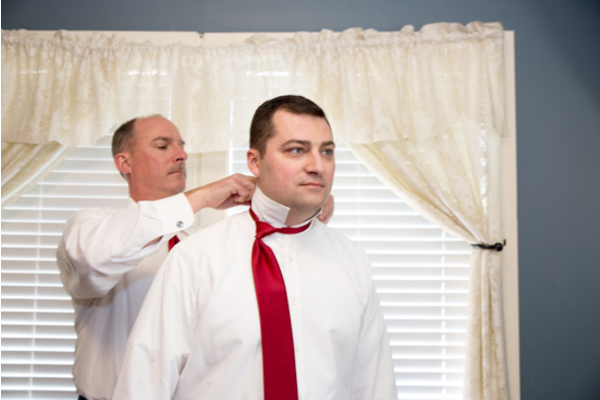 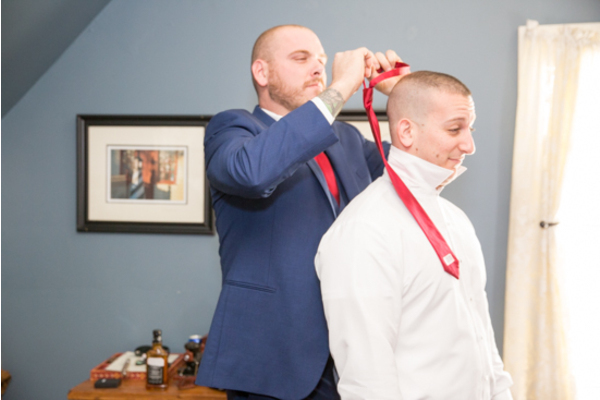 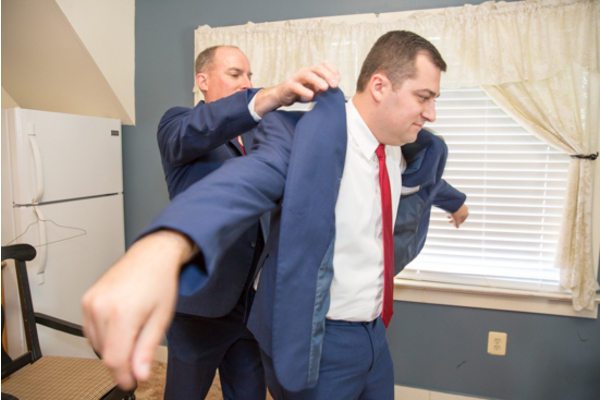 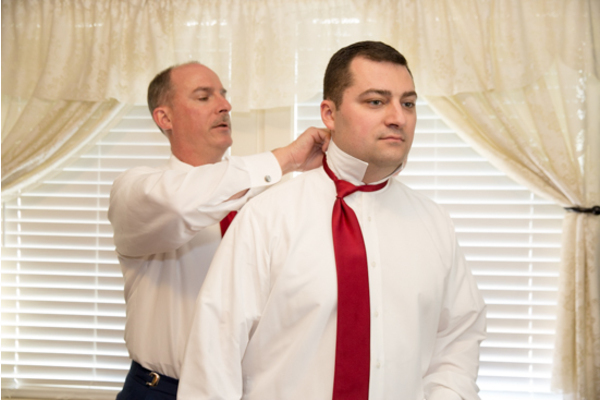 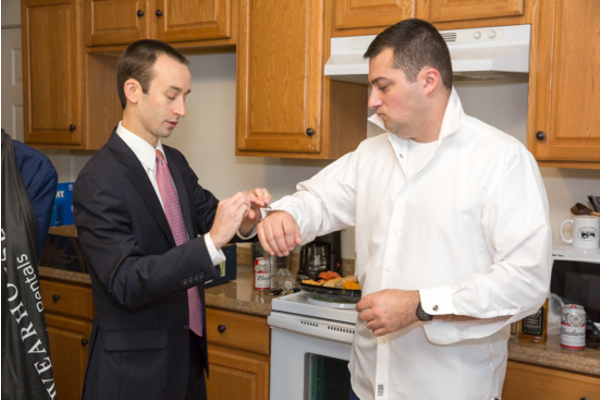 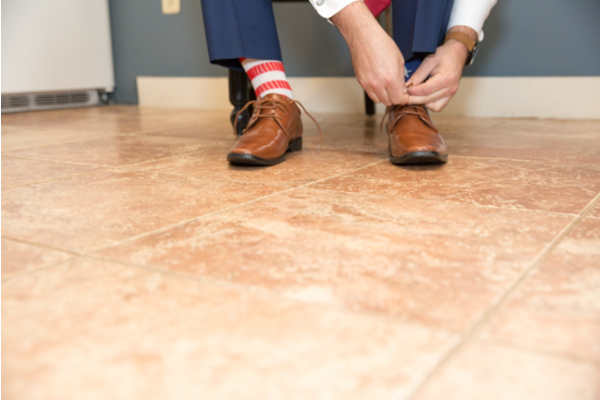 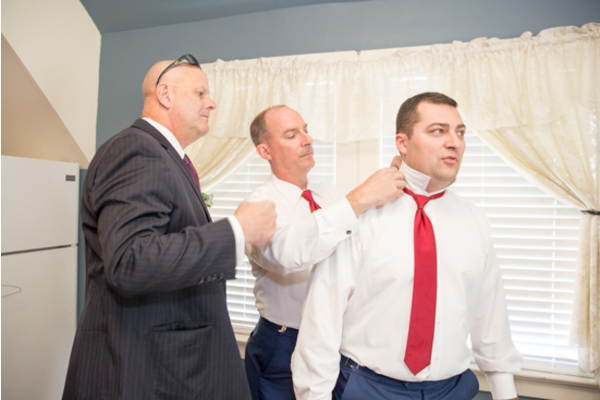 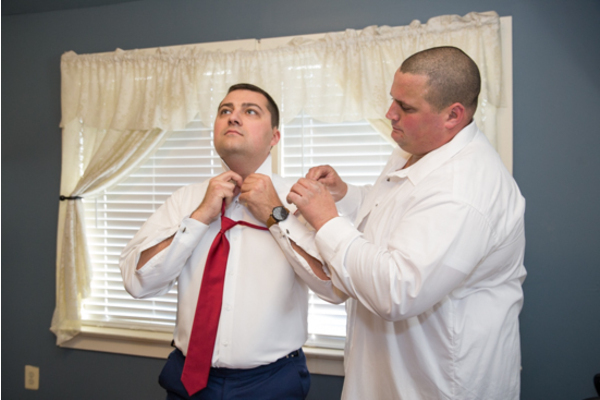 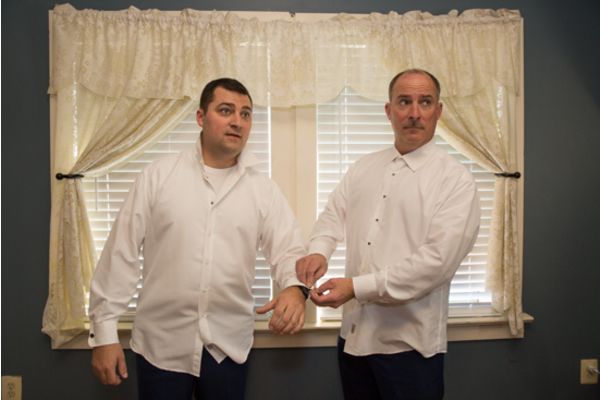 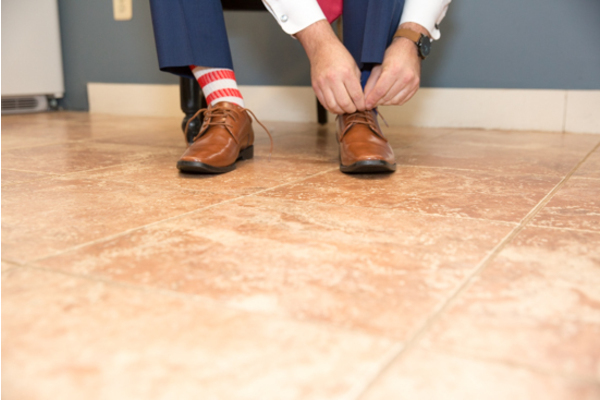 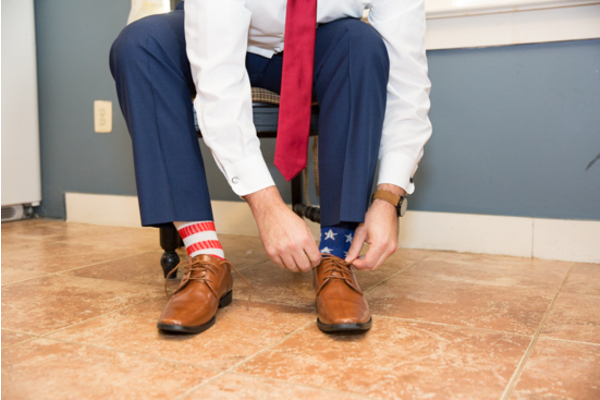 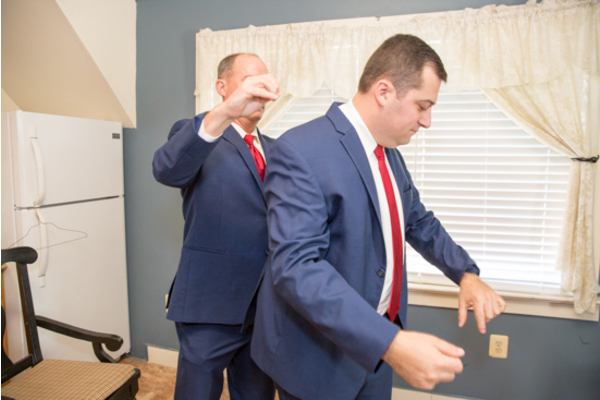 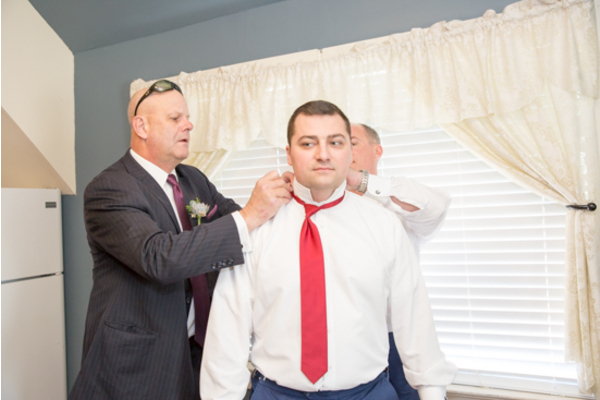 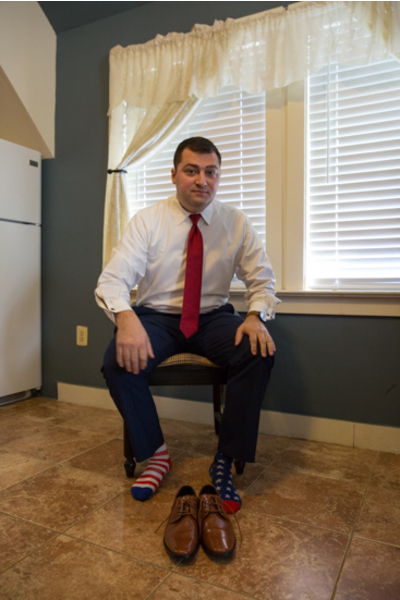 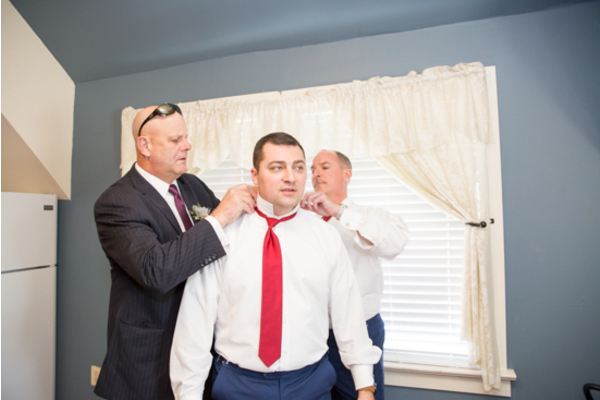 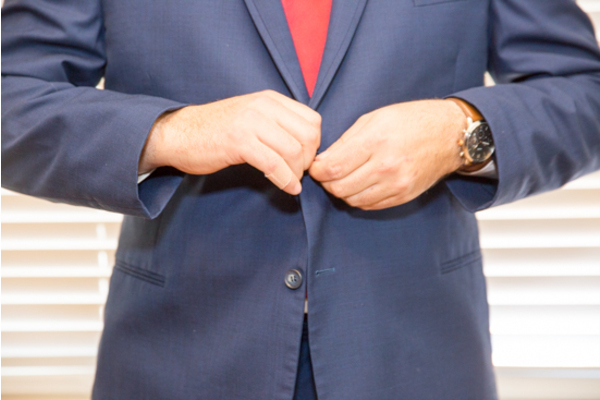 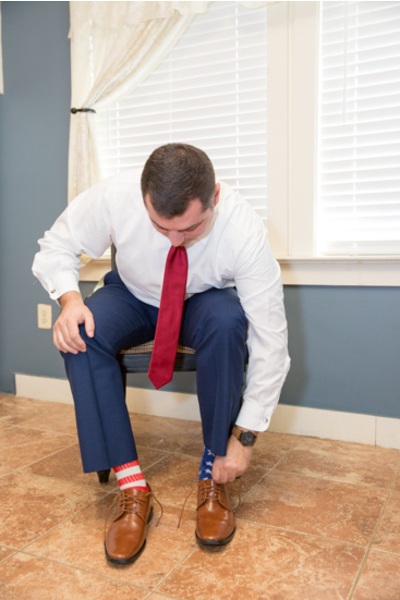 Nearby, Jarrod was also freshening up with his groomsmen in preparation for the wedding. 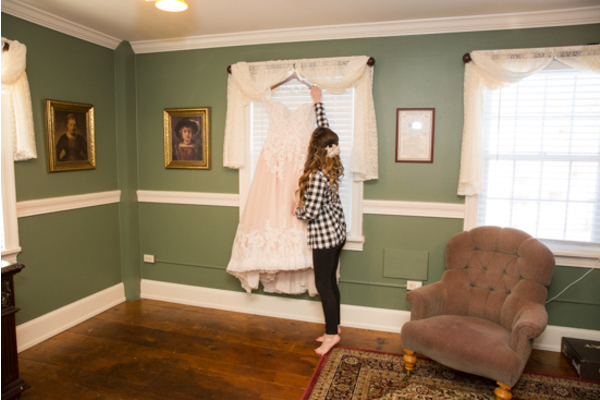 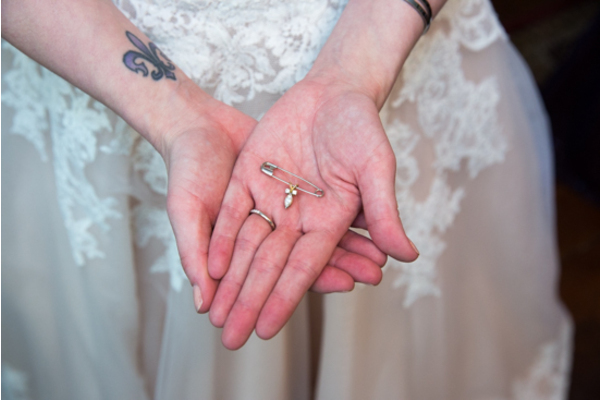 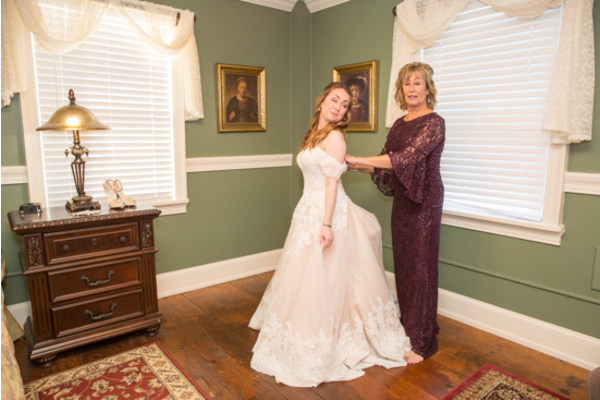 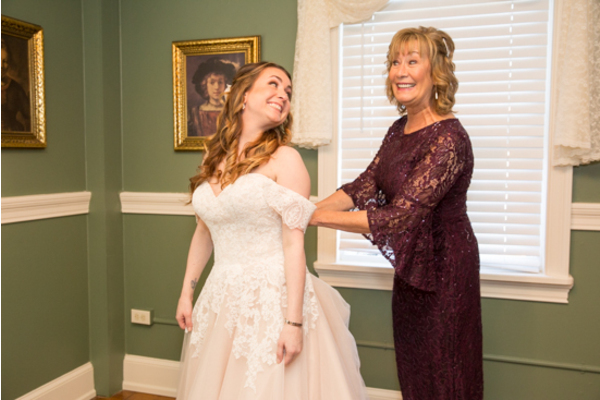 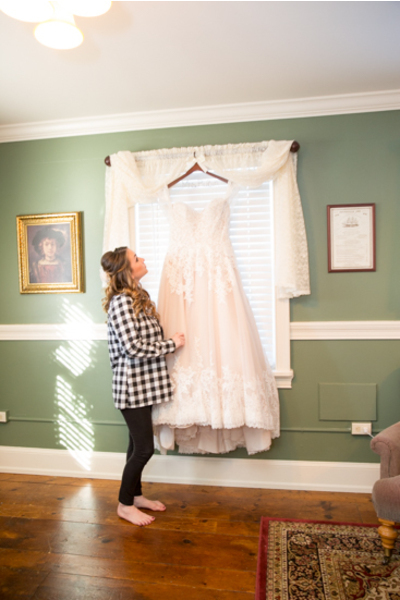 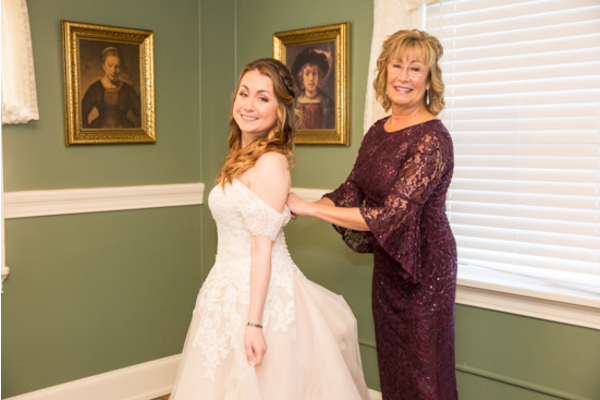 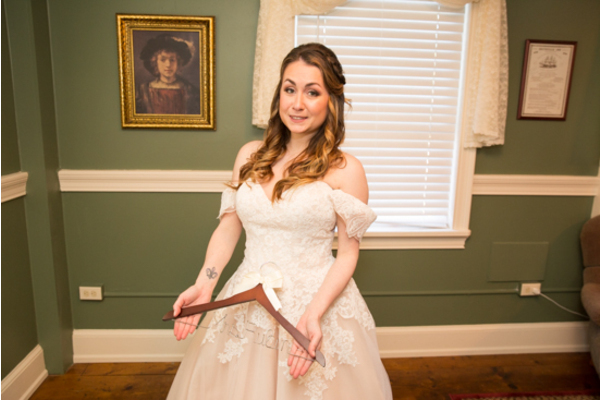 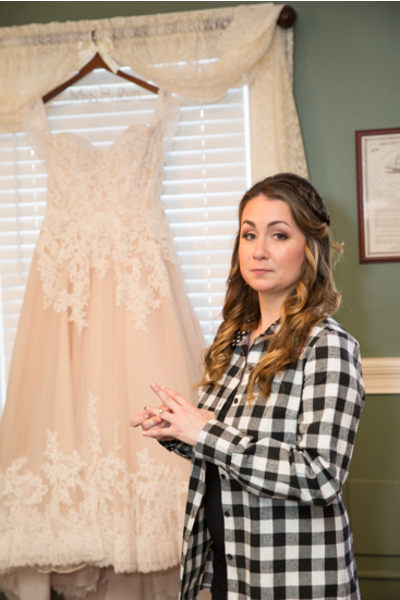 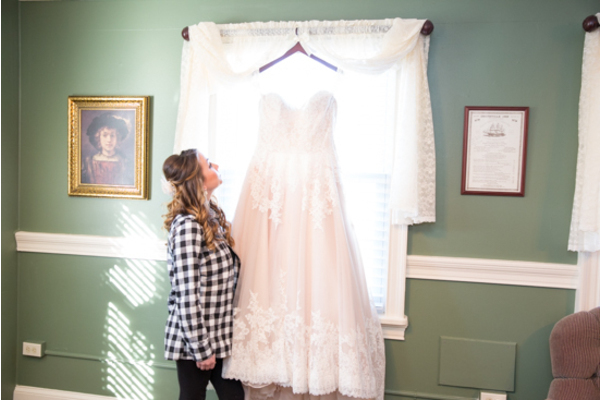 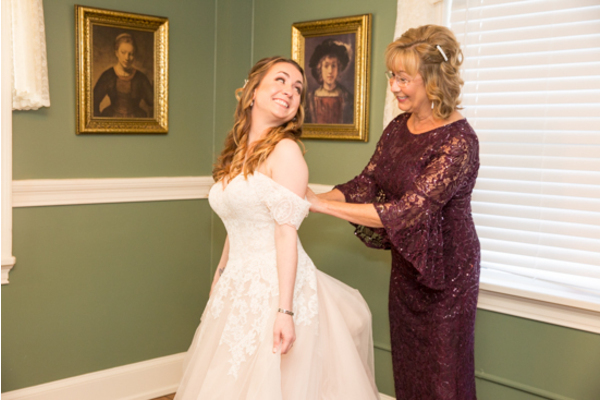 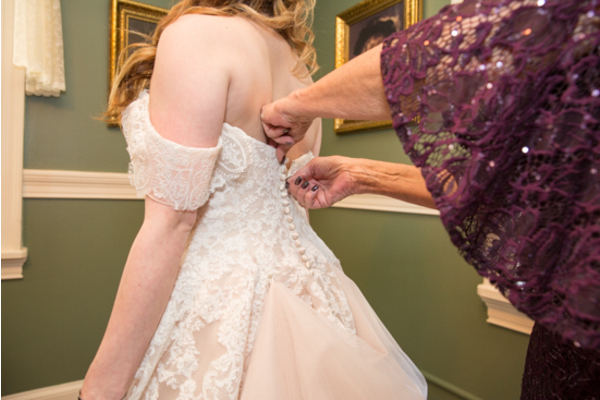 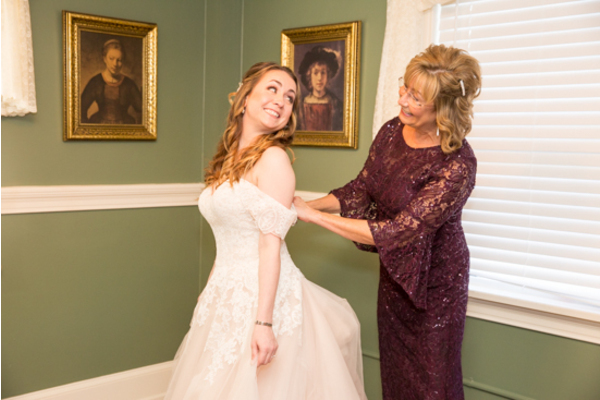 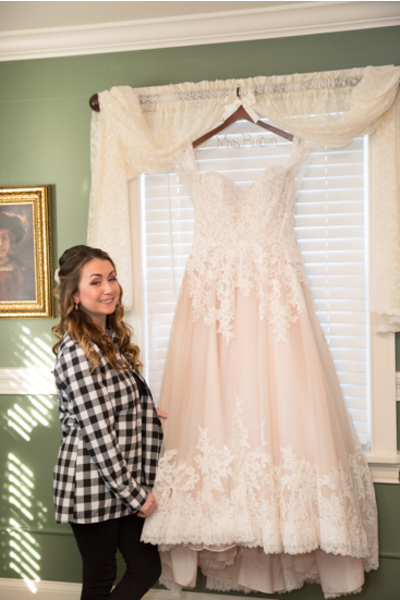 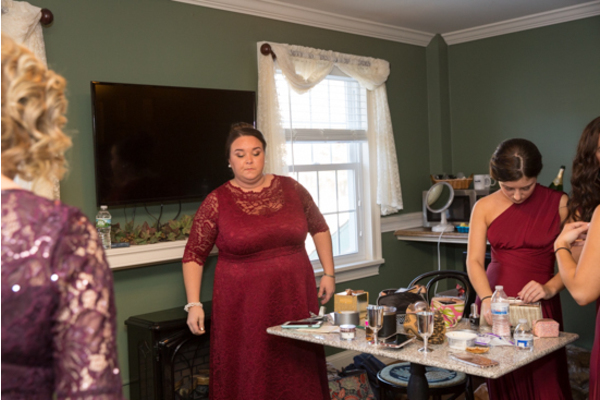 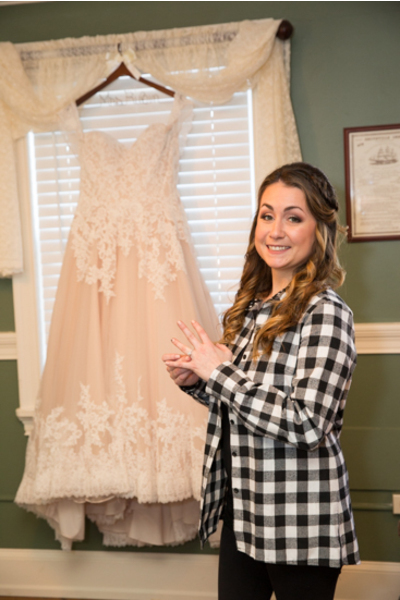 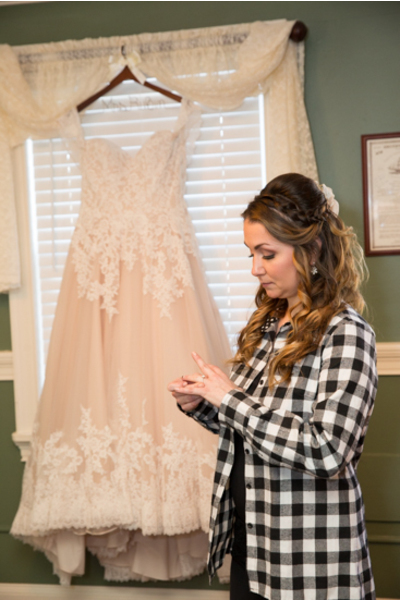 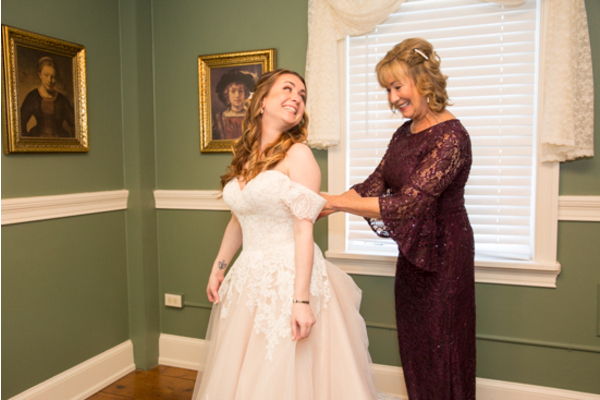 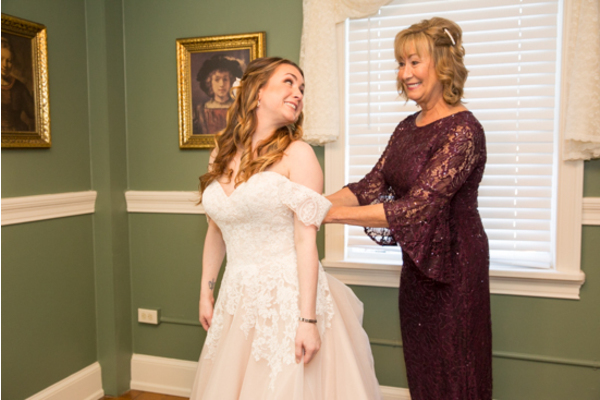 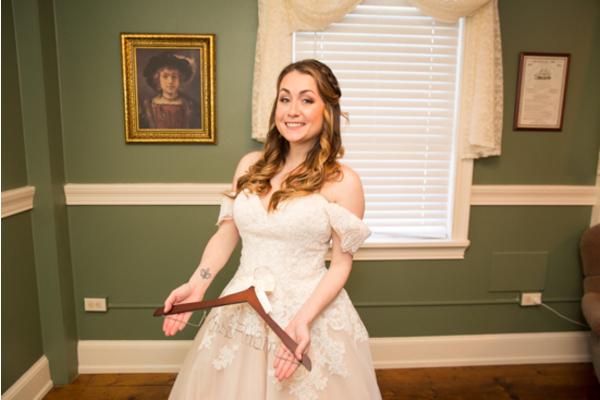 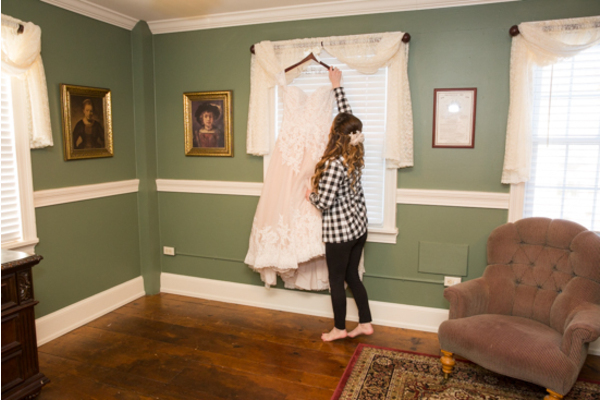 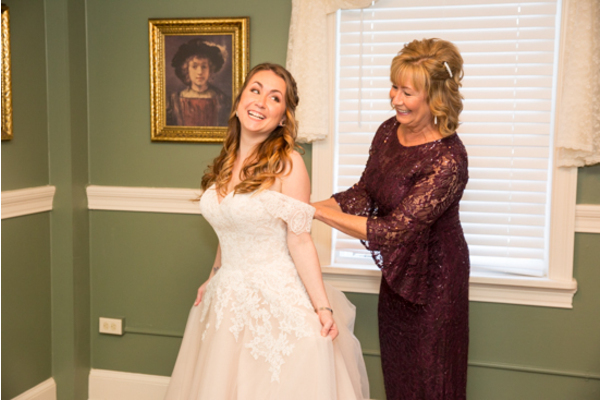 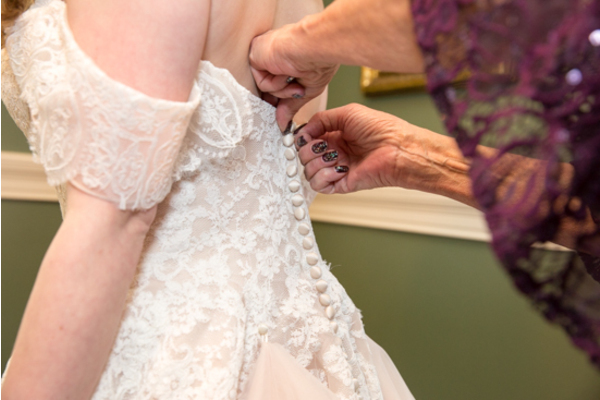 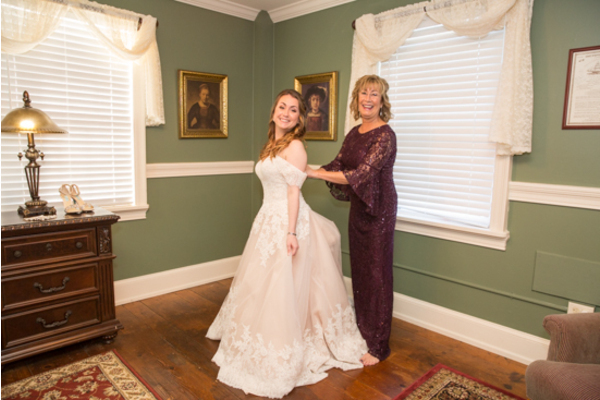 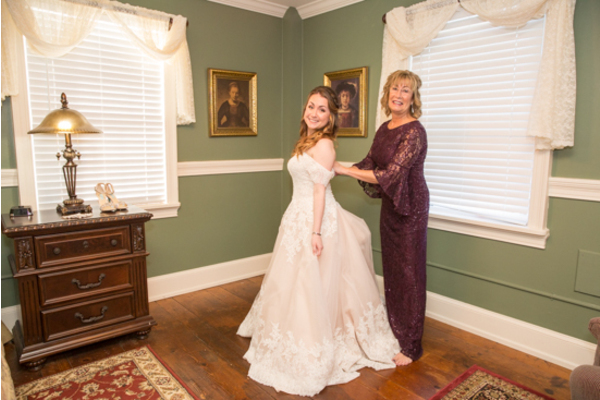 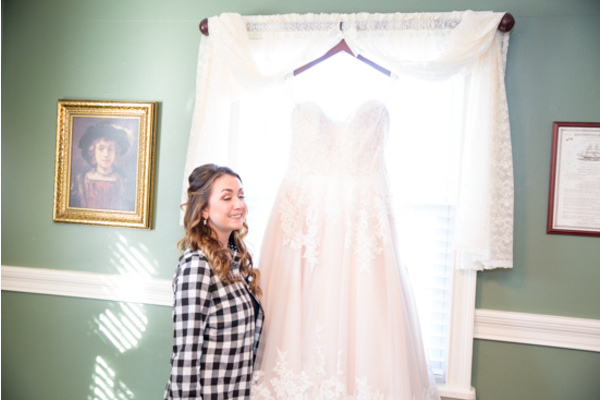 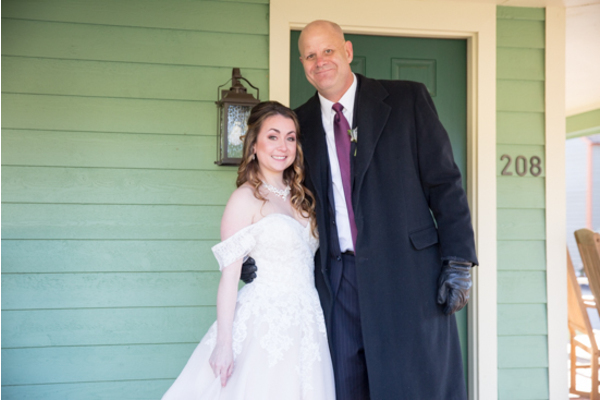 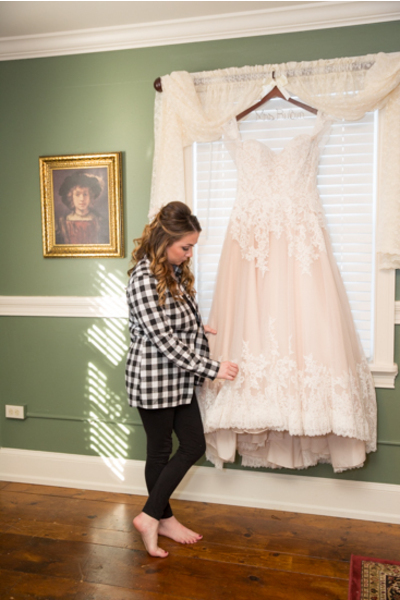 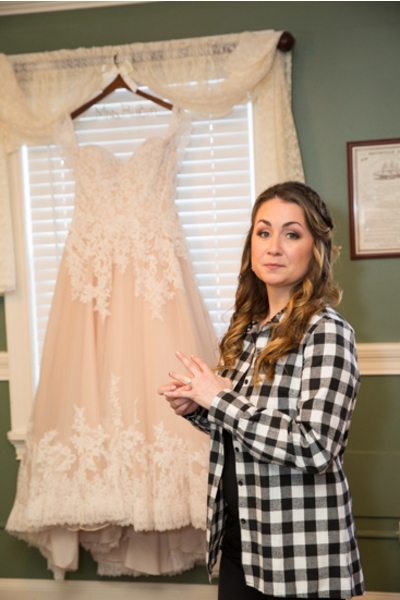 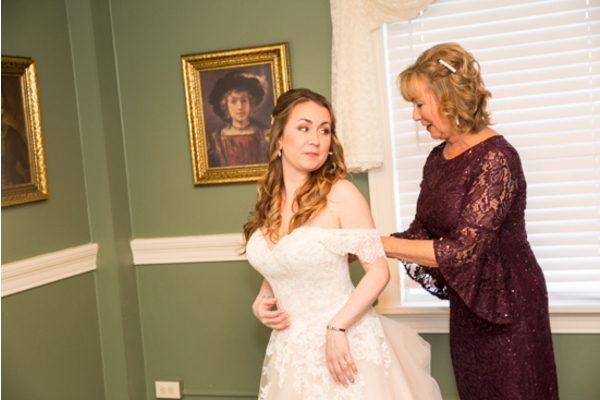 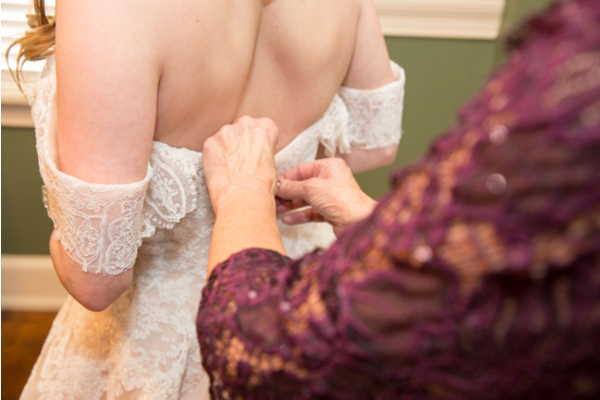 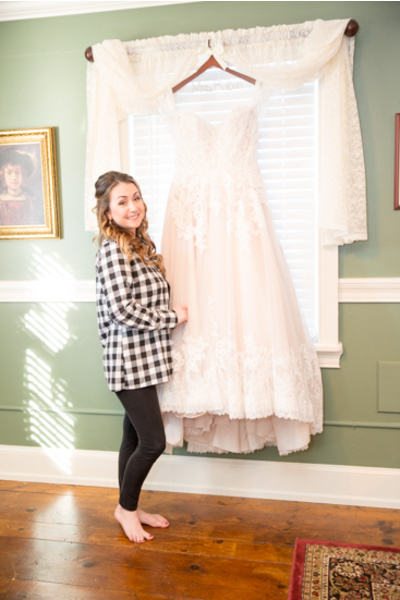 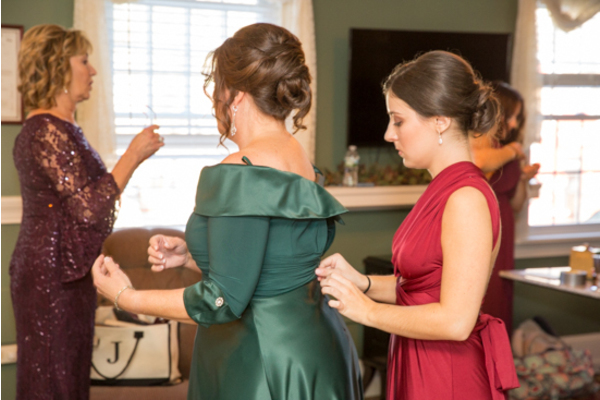 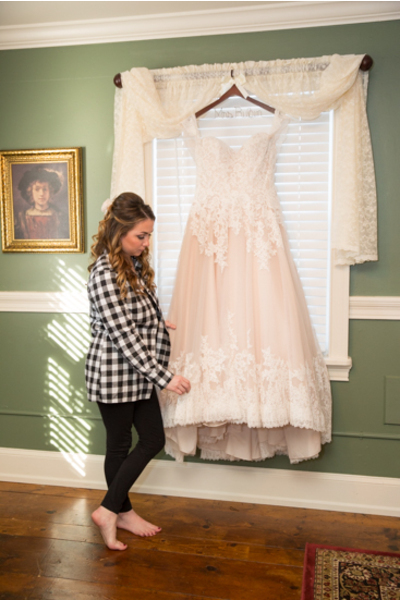 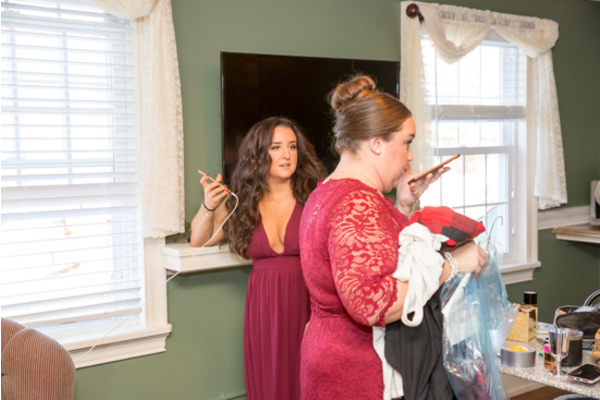 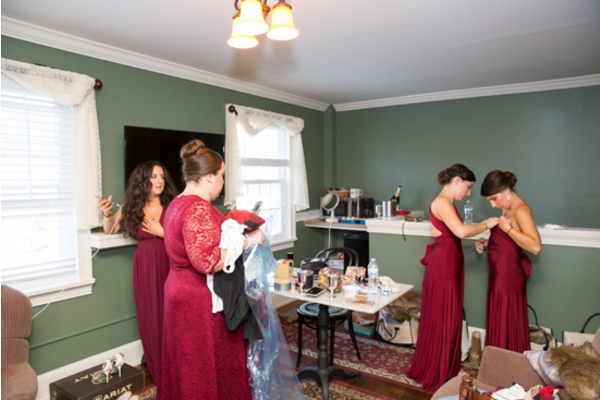 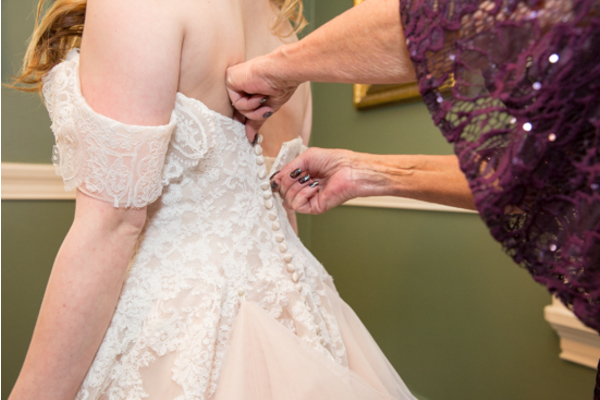 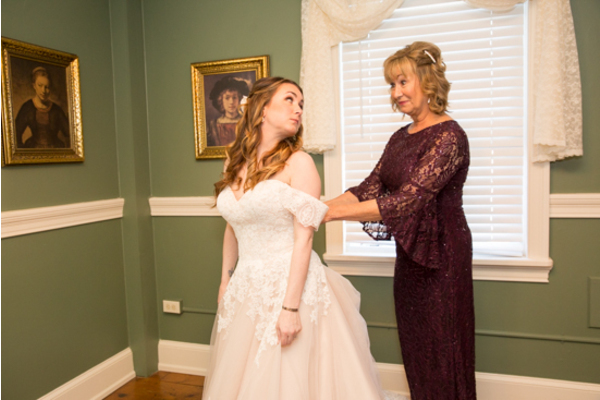 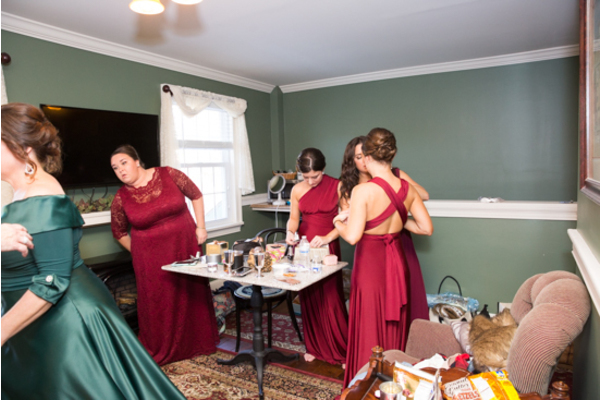 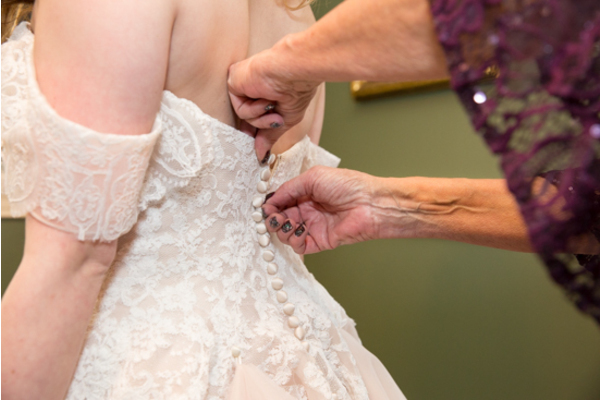 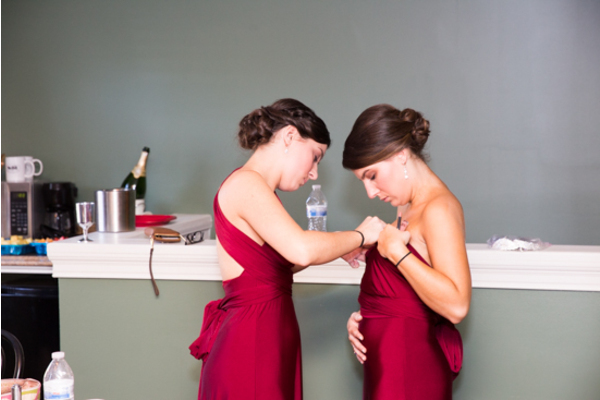 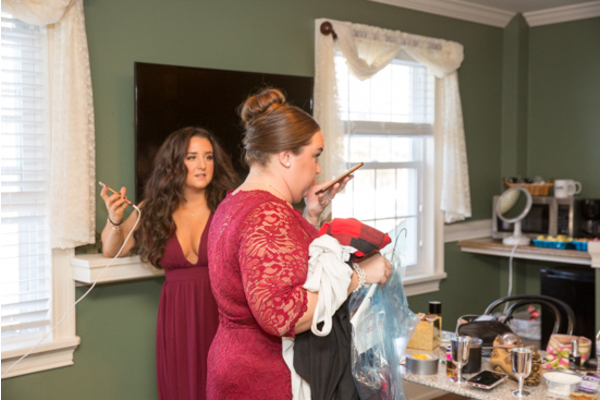 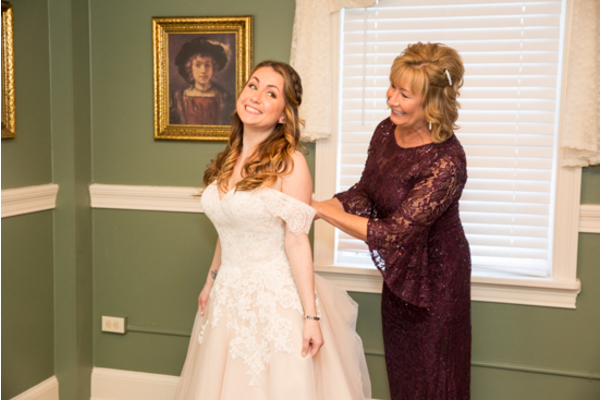 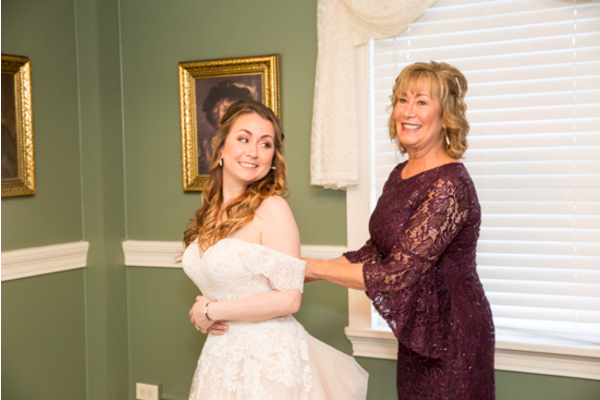 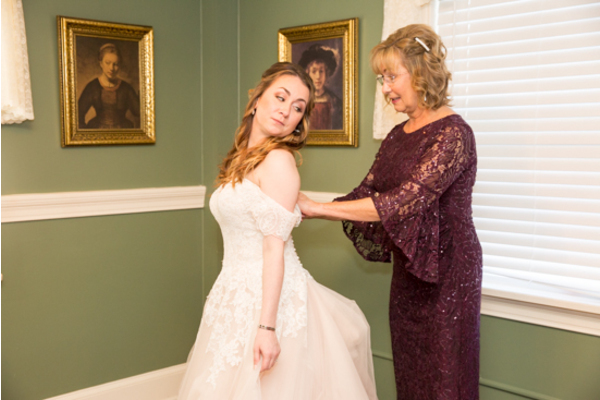 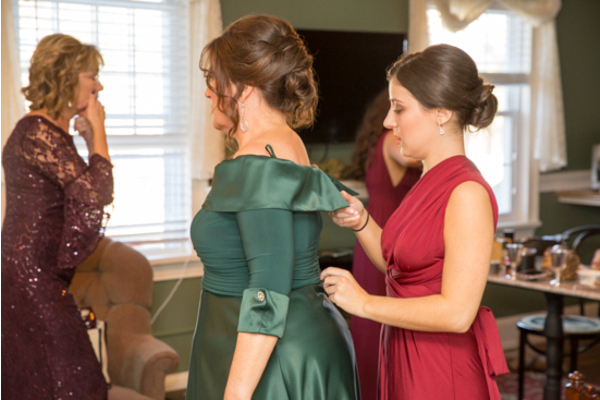 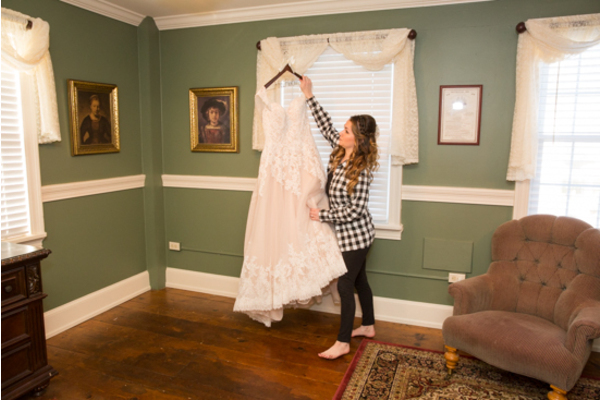 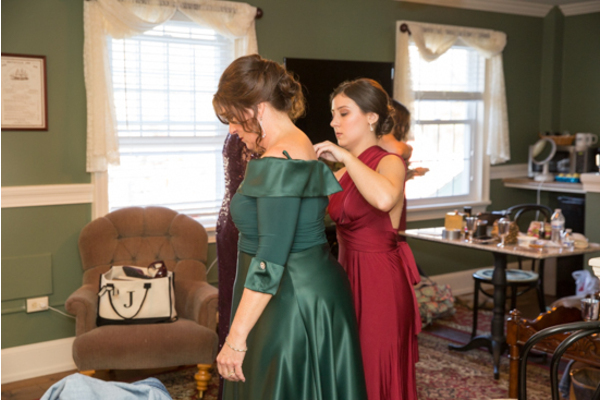 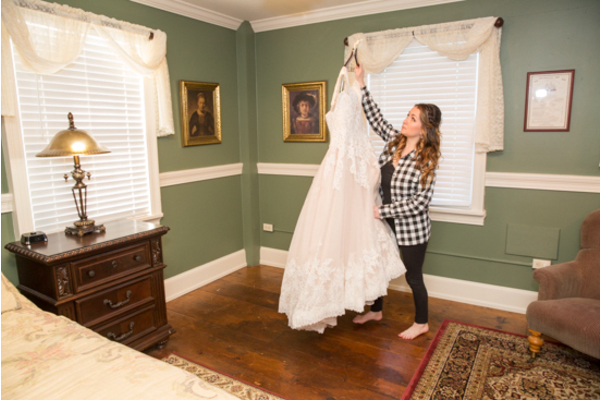 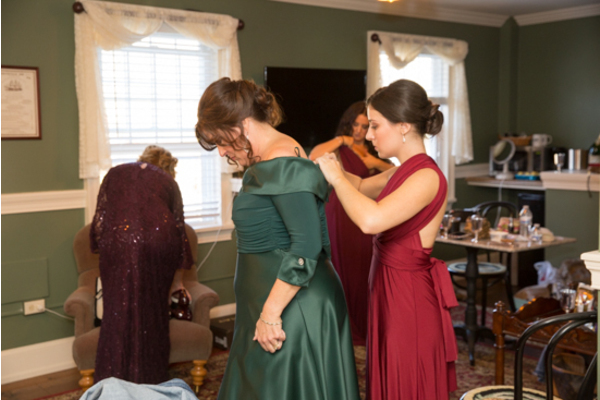 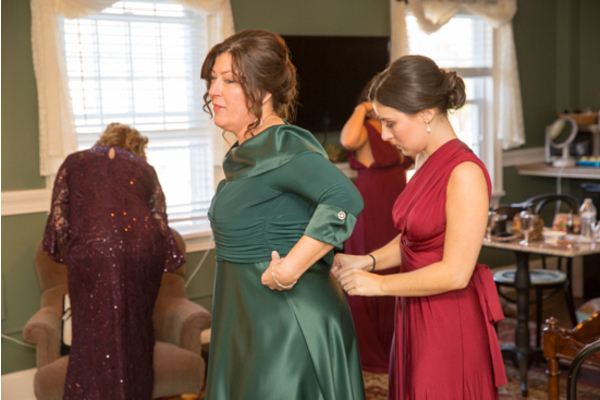 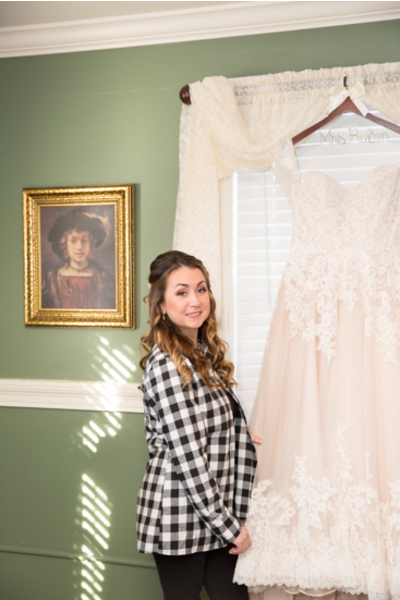 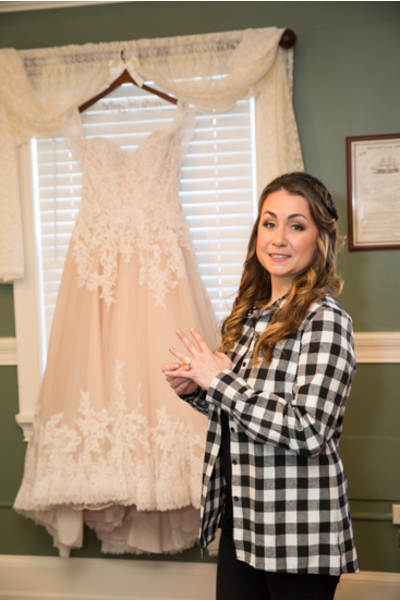 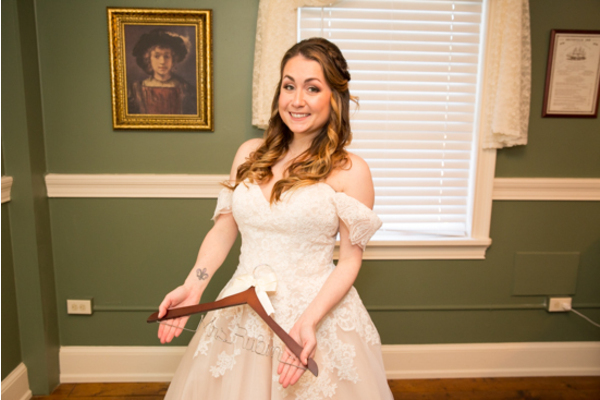 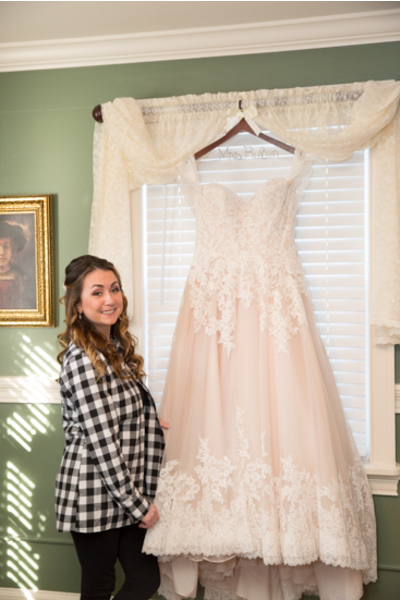 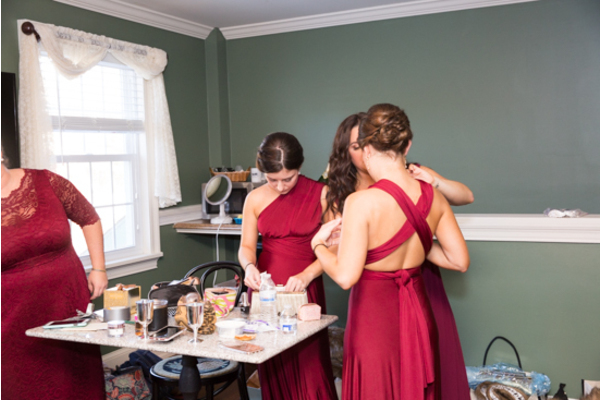 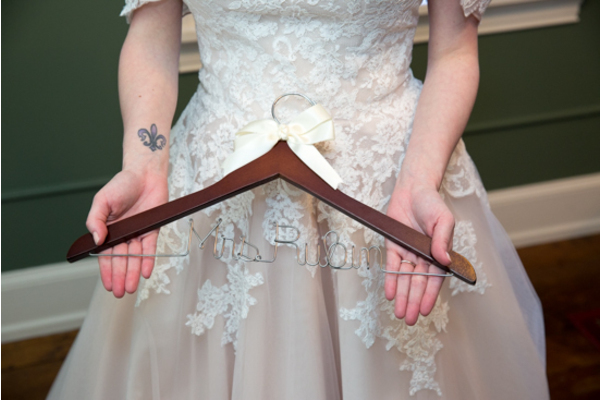 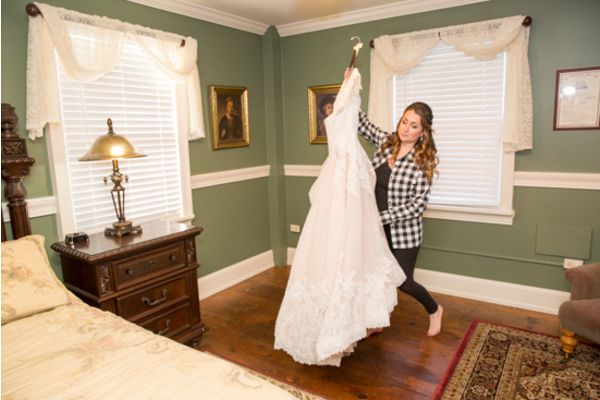 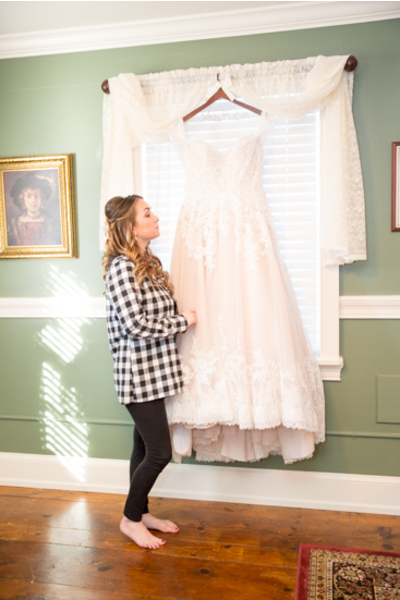 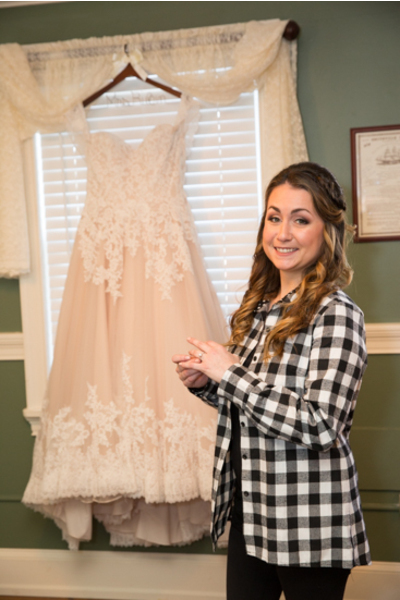 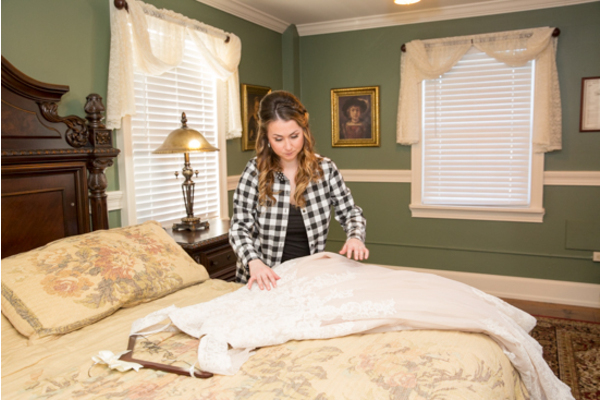 Next, Mackenzie received special gifts from her bridal party and got glamour shots taken by our NJ Wedding Photographer! 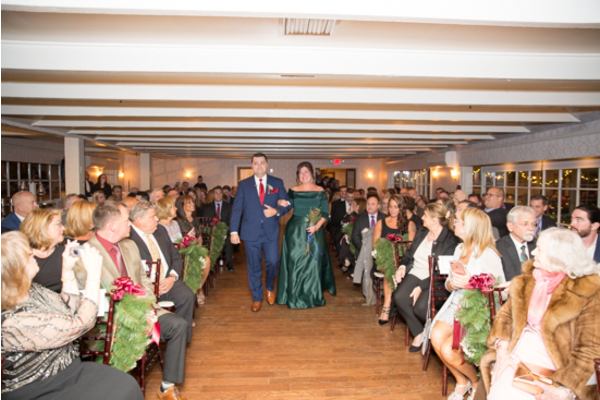 After all the pre-wedding prep was completed, the lovers were ready to meet each other at the end of the aisle. 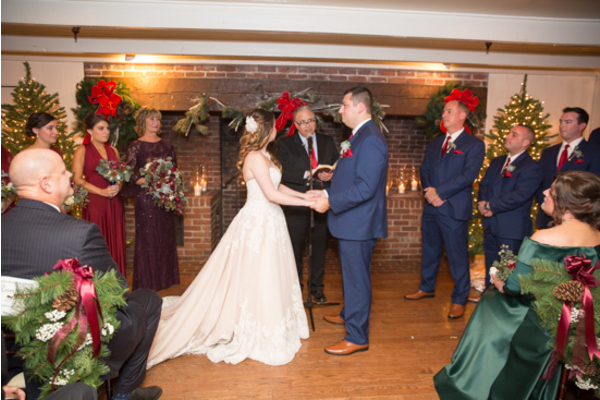 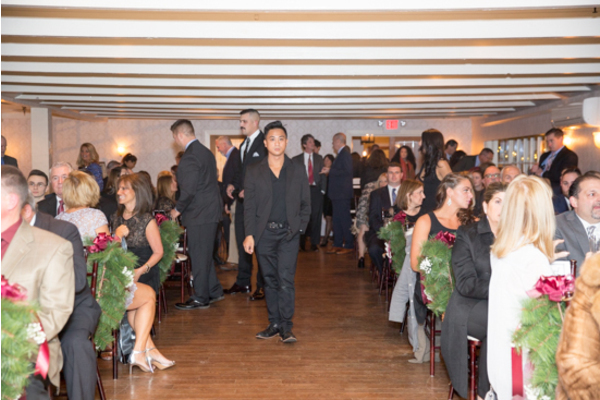 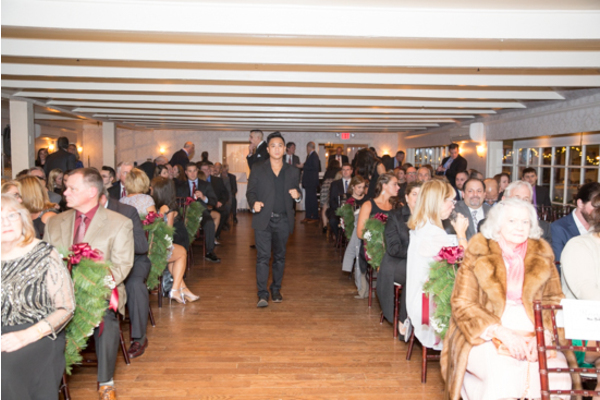 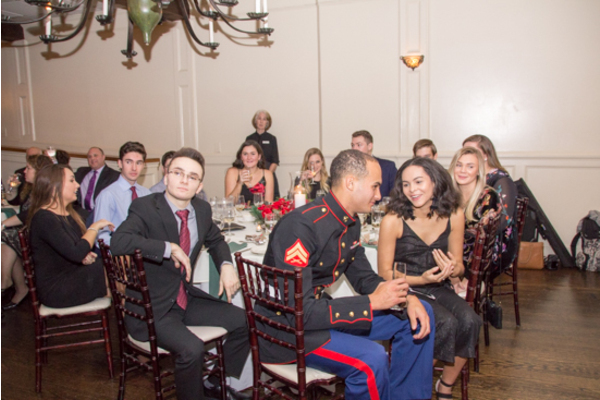 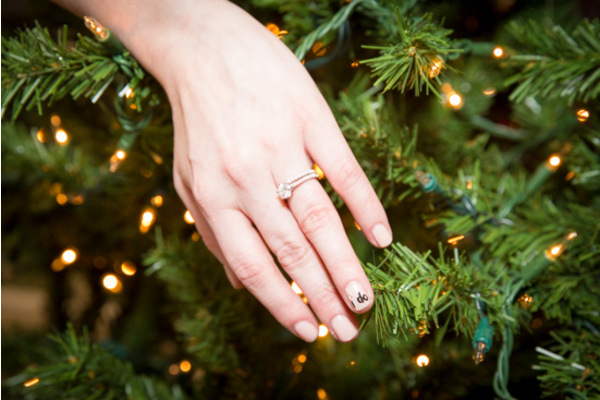 The ceremony was filled with holiday cheer and all around Christmas vibes! 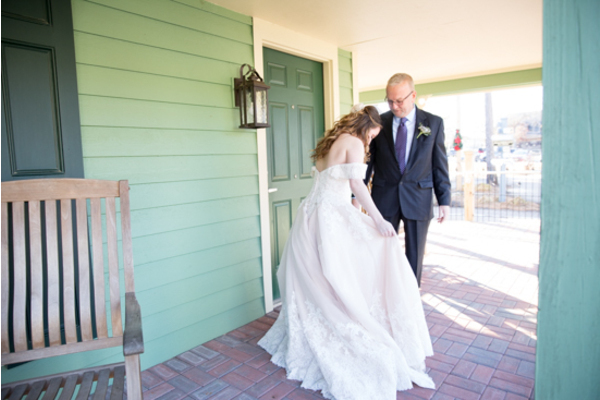 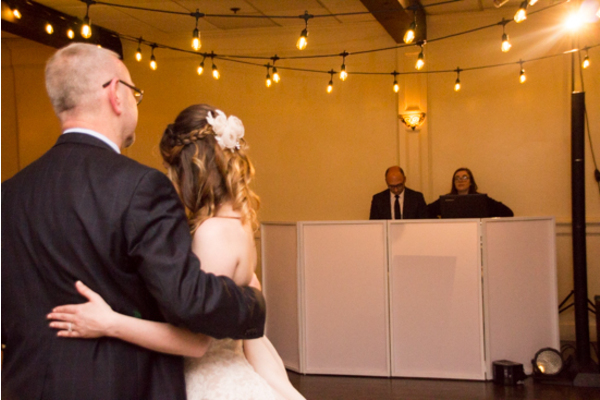 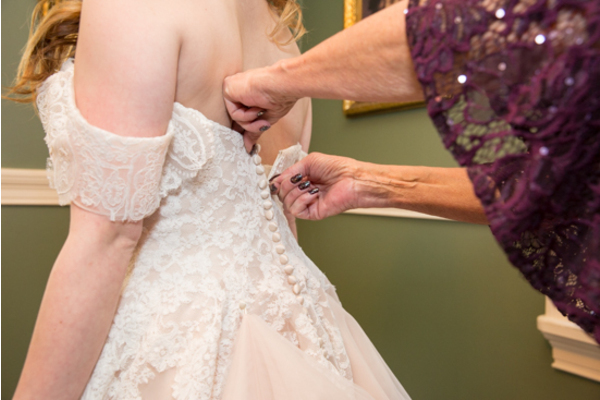 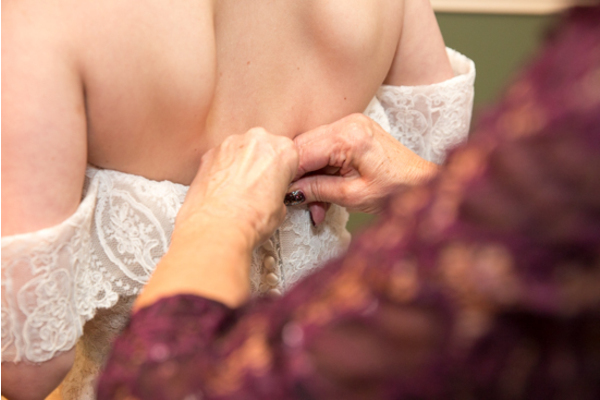 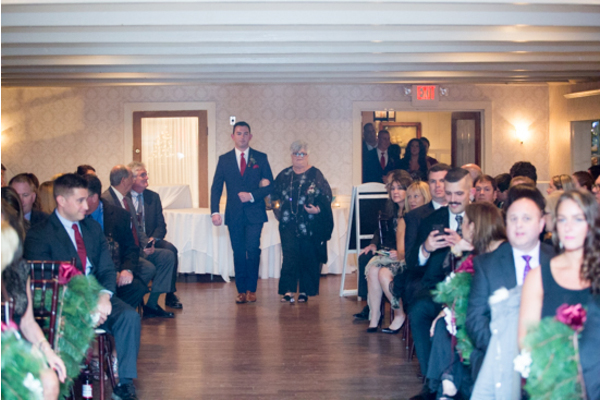 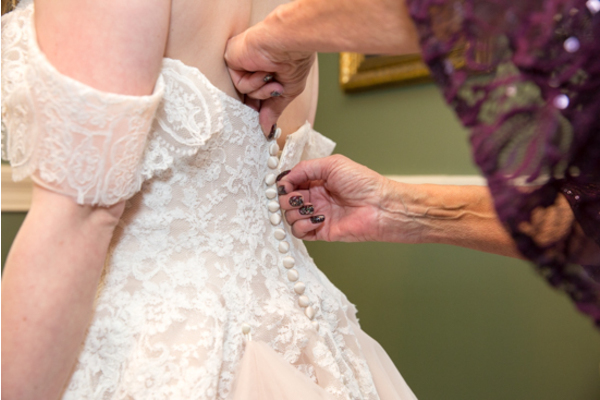 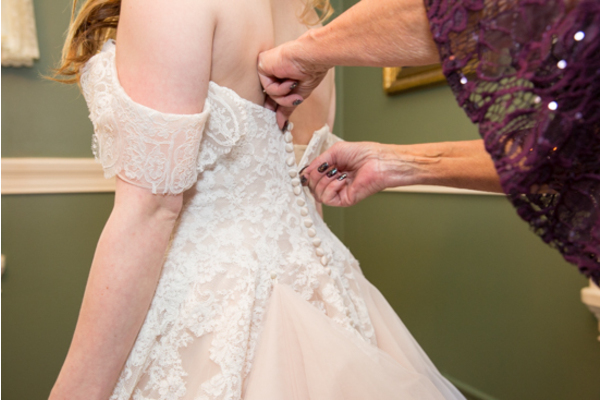 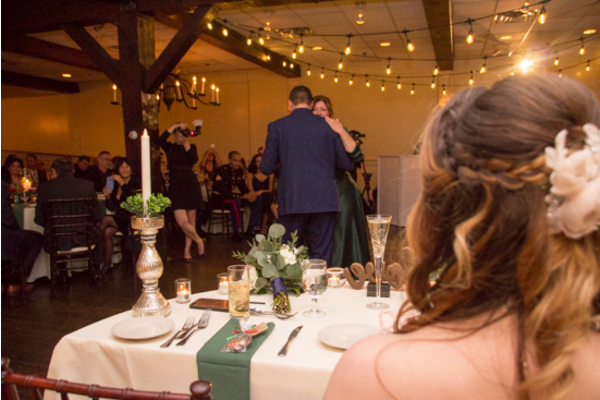 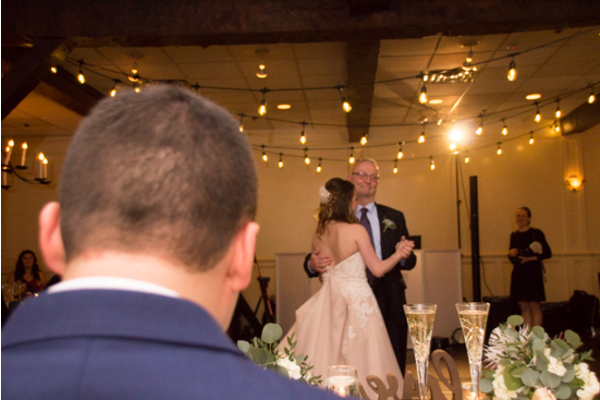 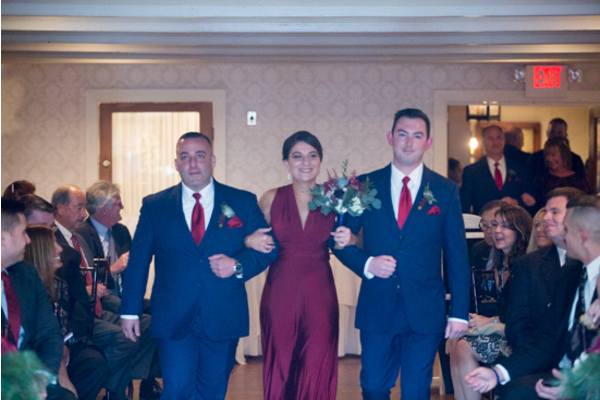 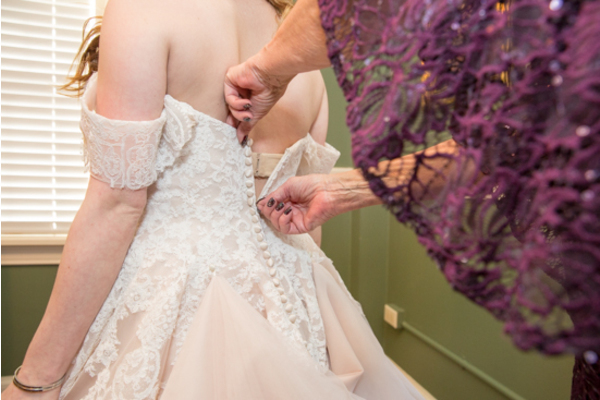 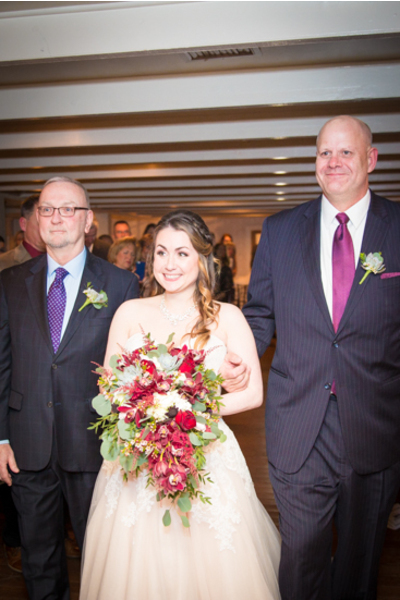 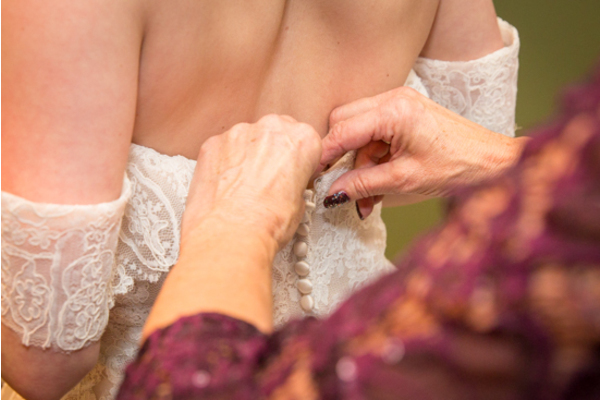 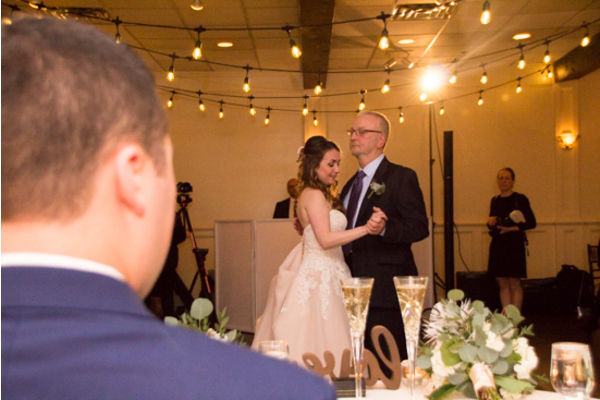 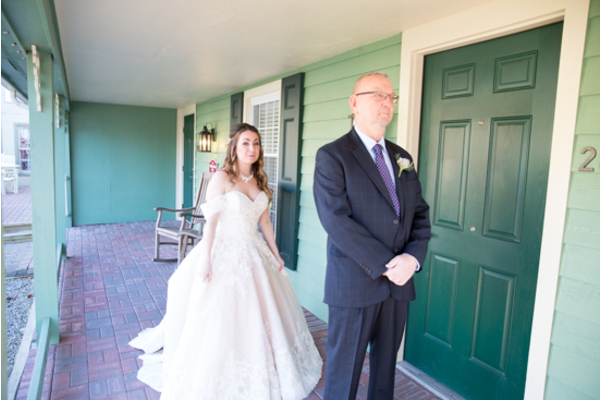 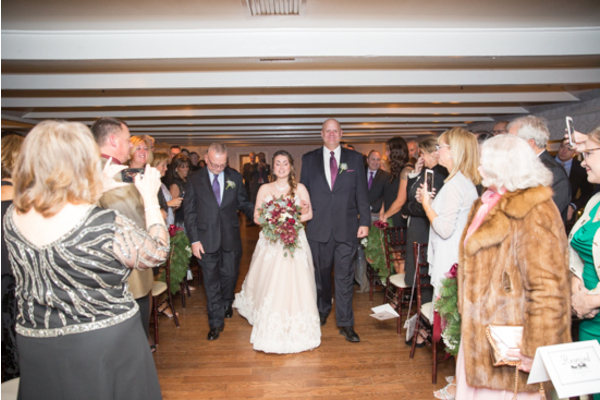 Once the guests took their seats, it was time for the bride to make her way down the aisle. 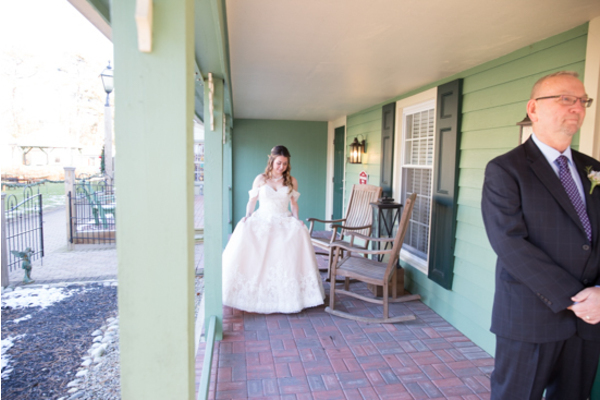 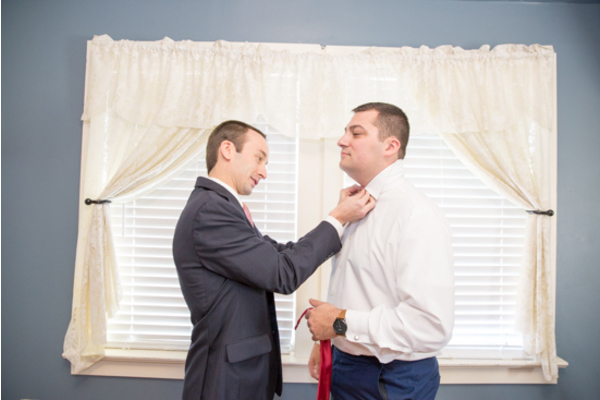 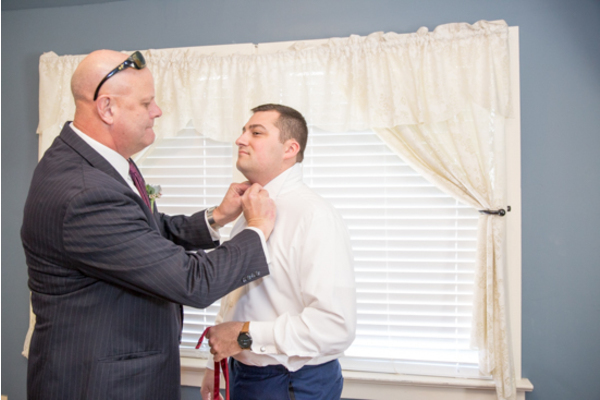 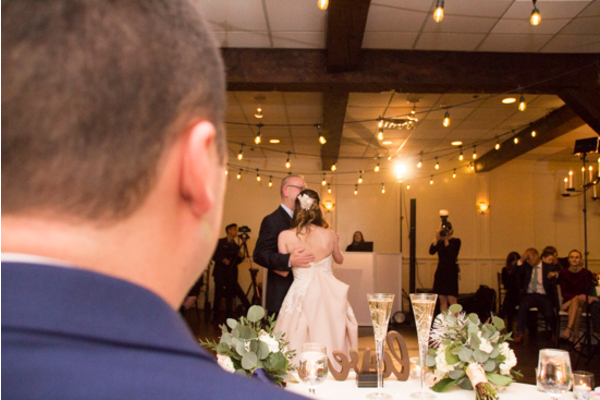 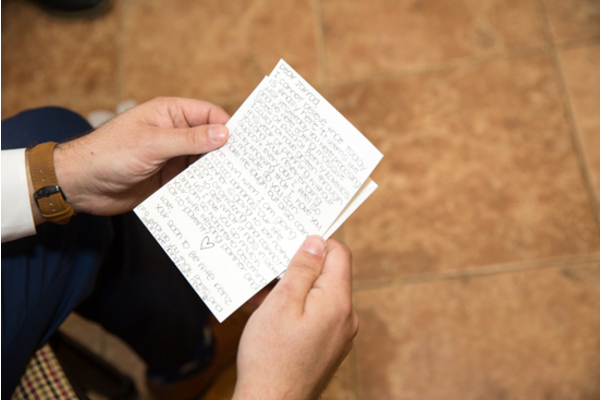 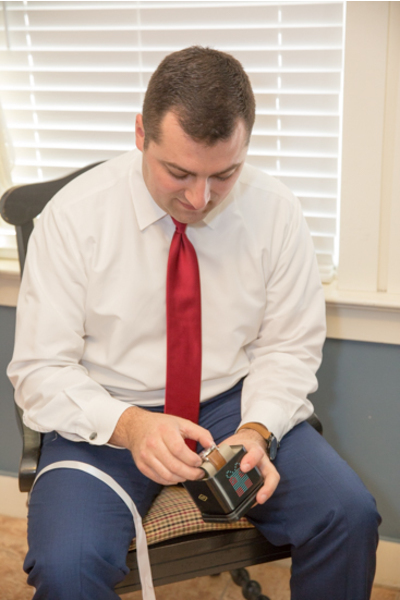 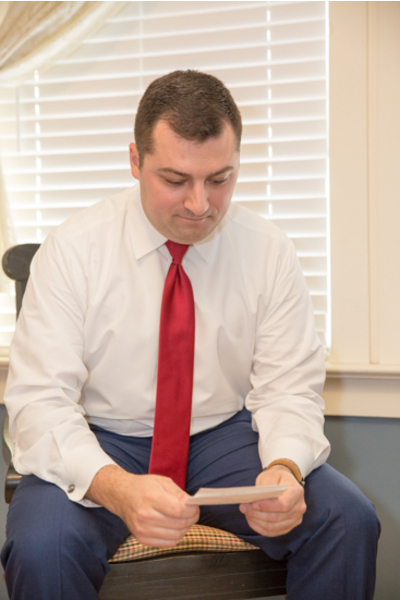 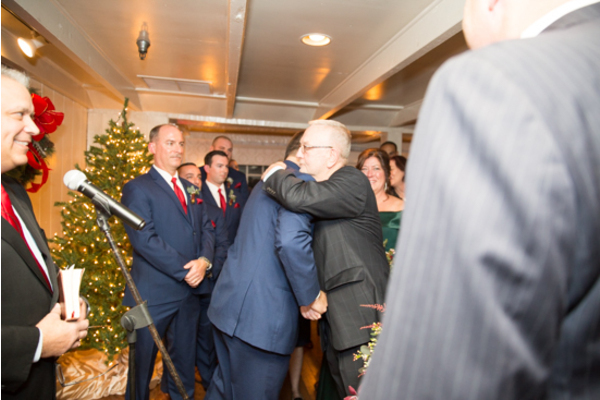 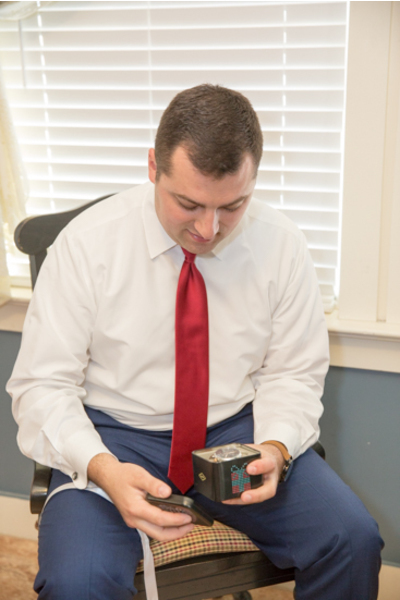 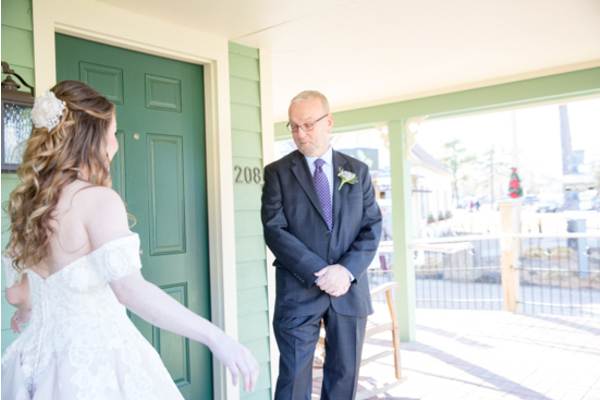 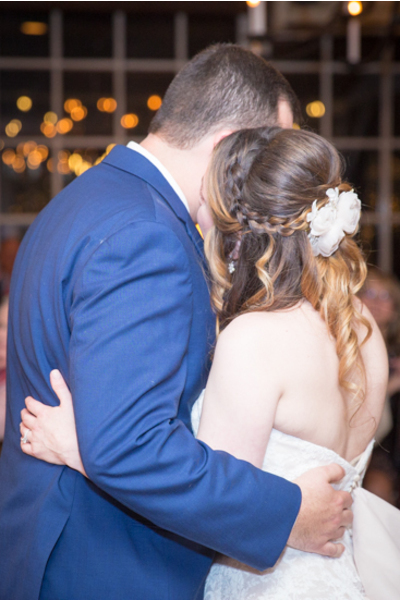 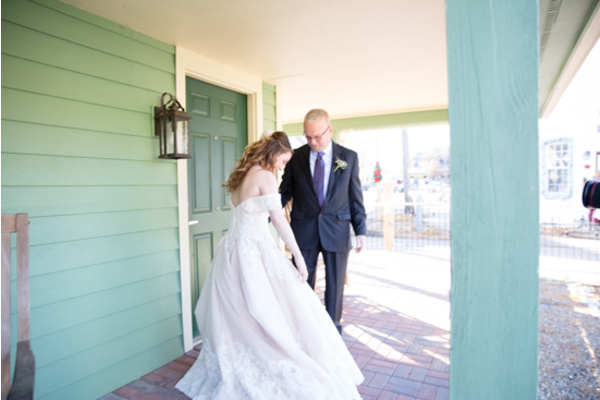 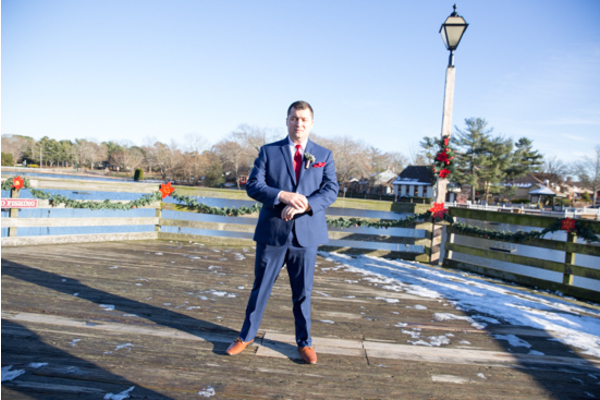 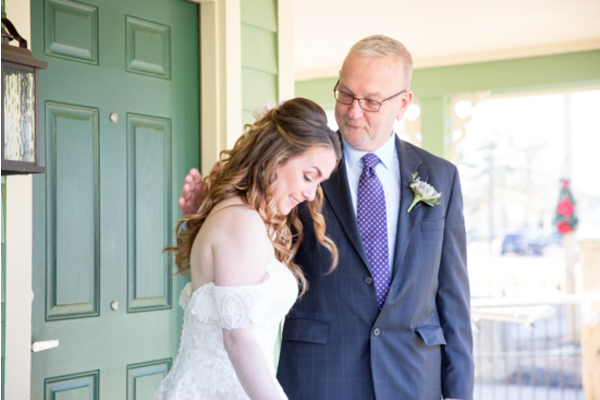 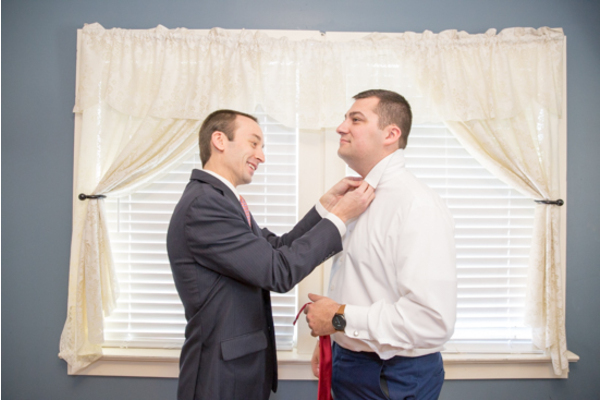 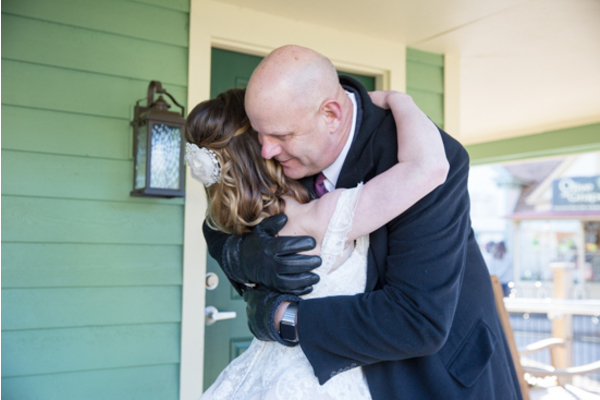 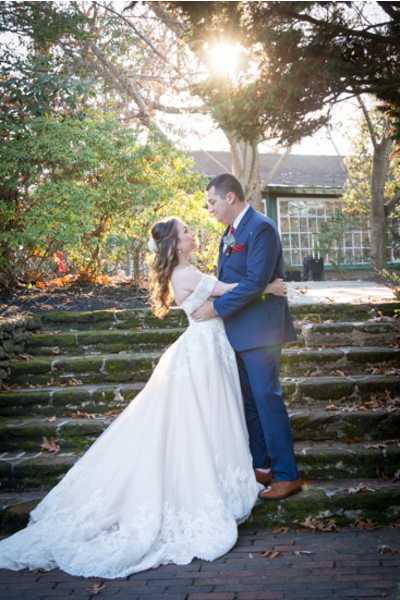 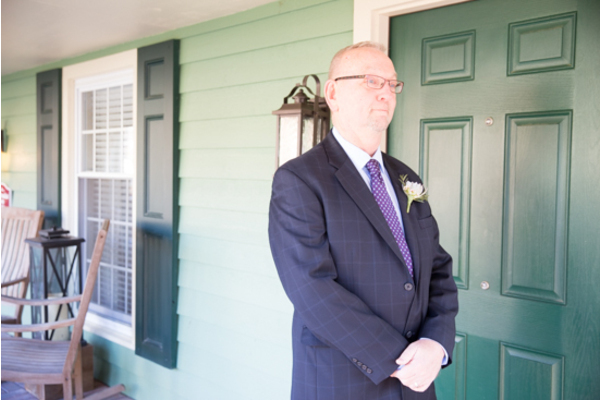 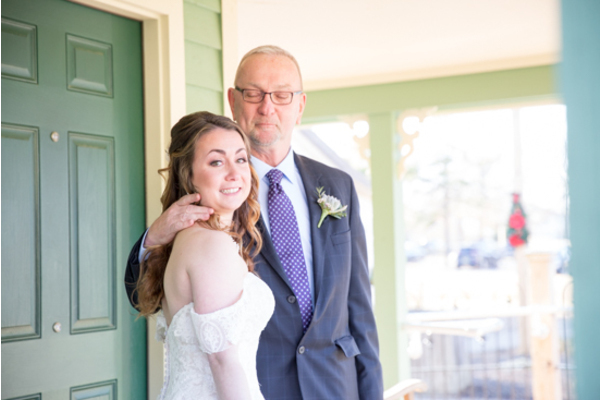 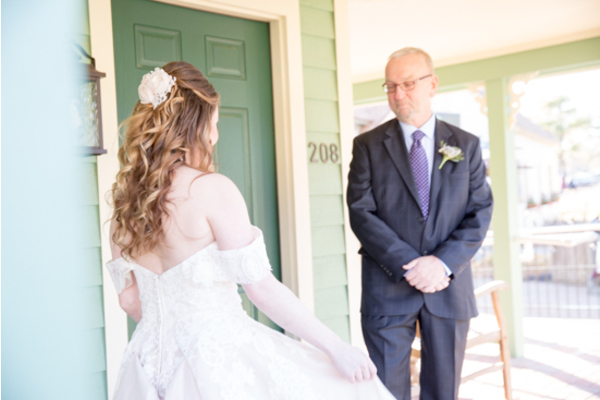 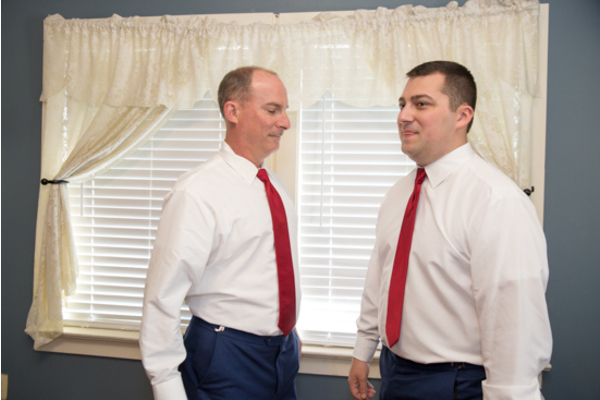 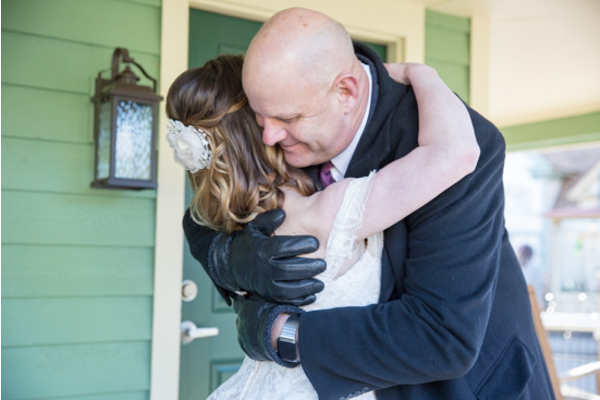 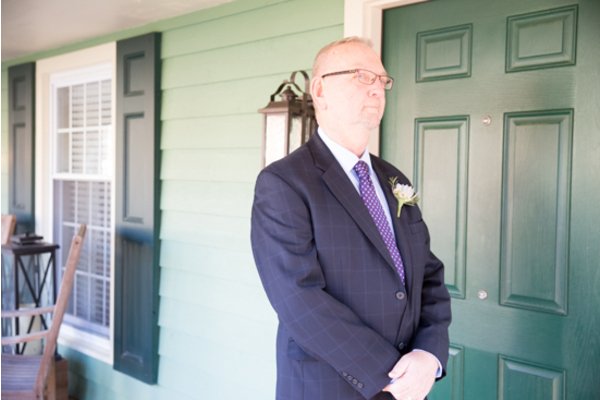 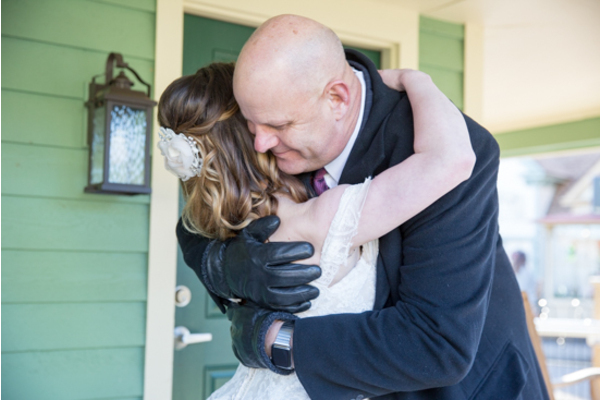 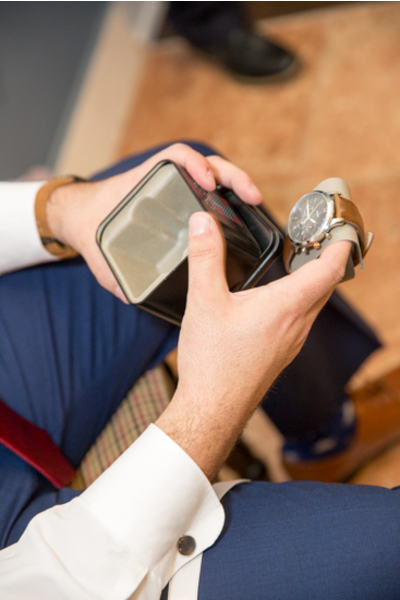 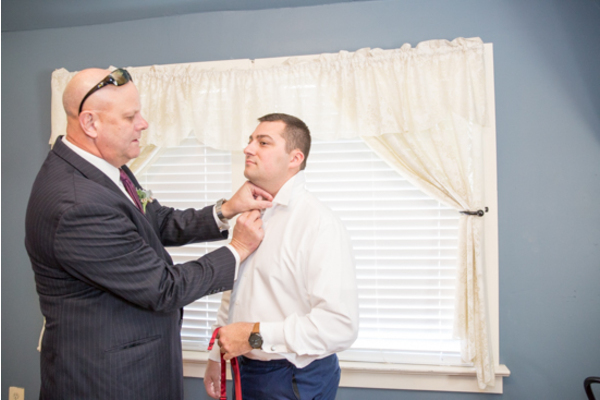 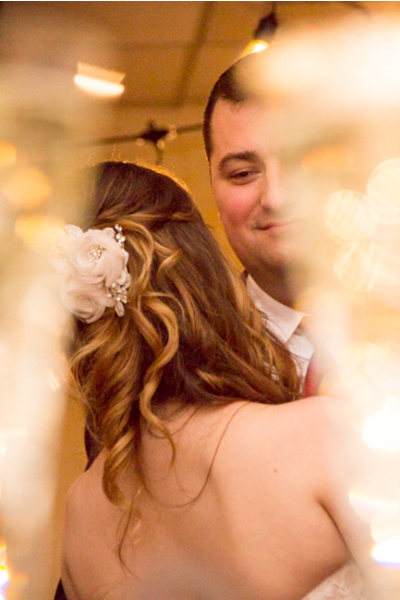 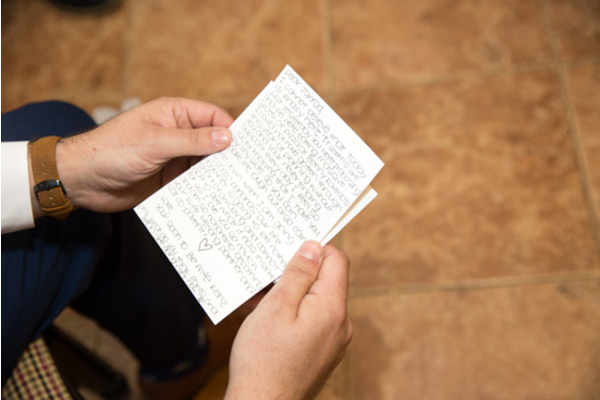 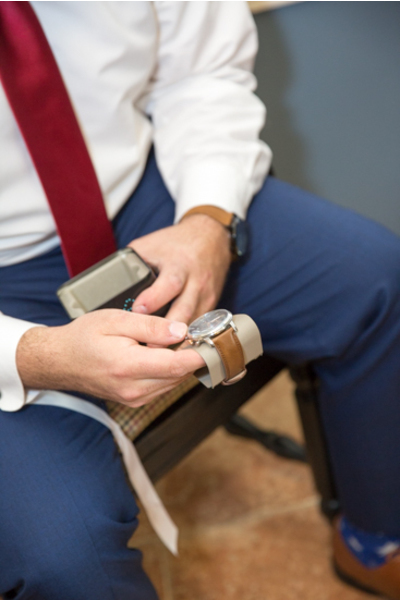 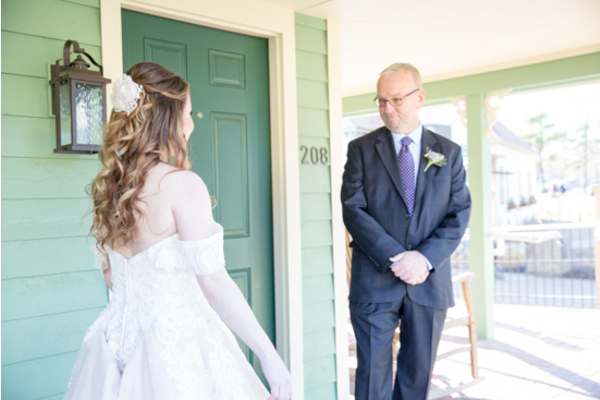 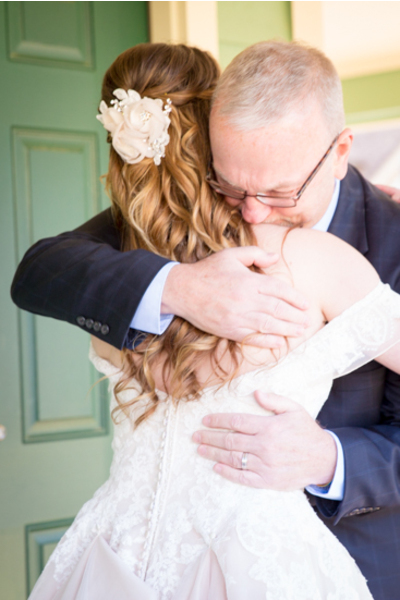 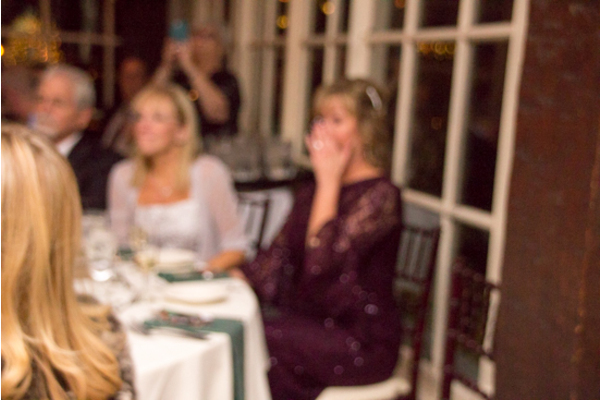 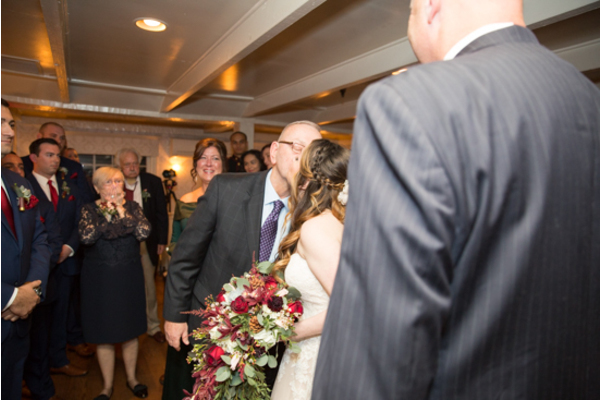 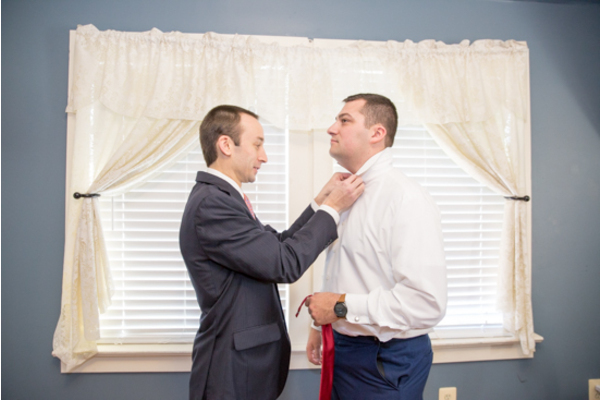 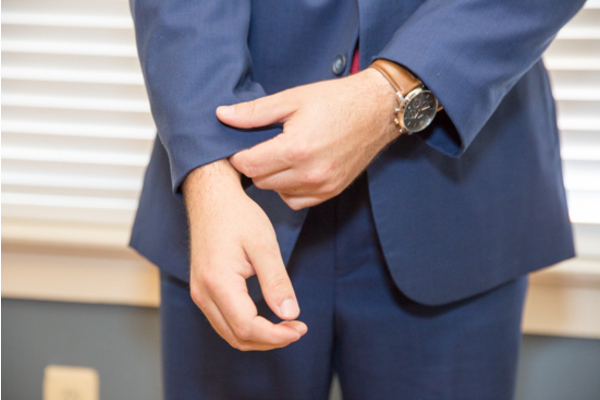 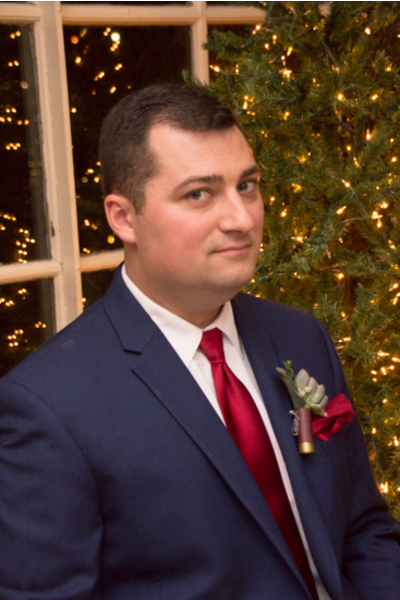 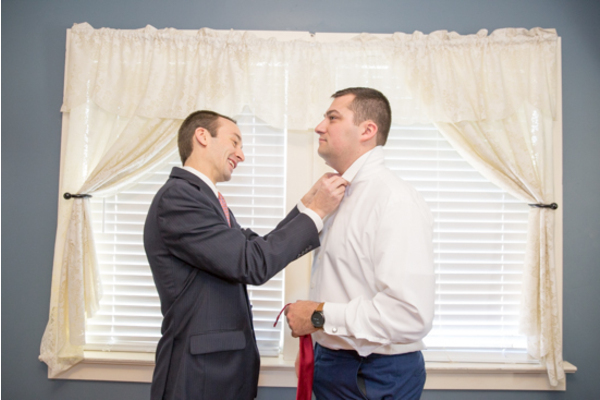 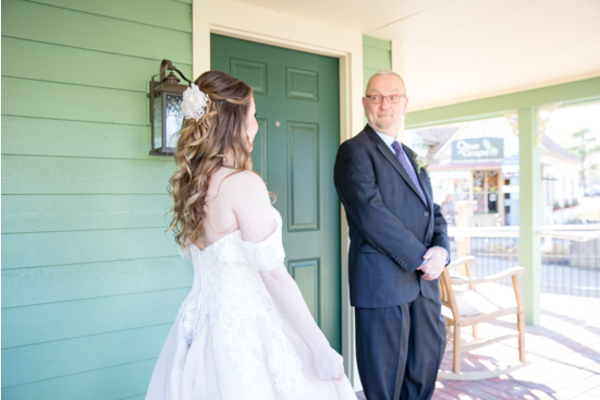 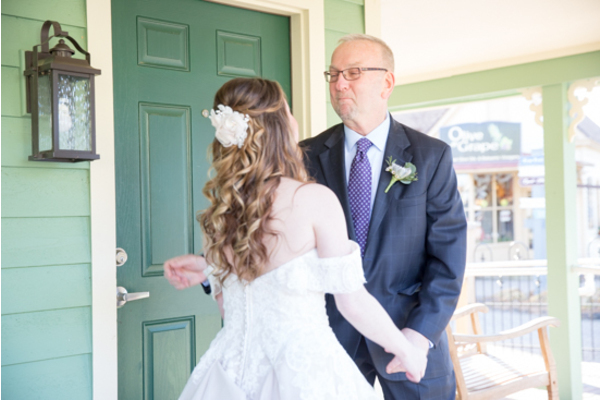 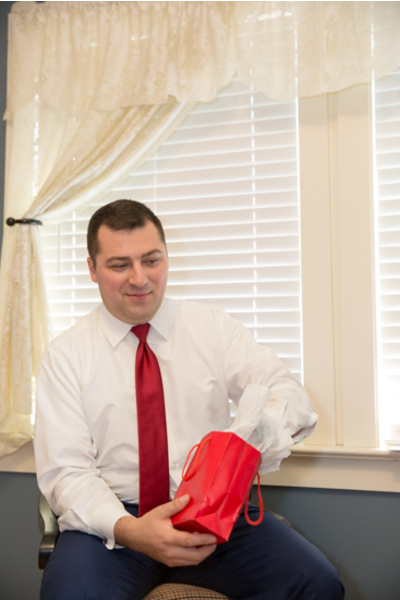 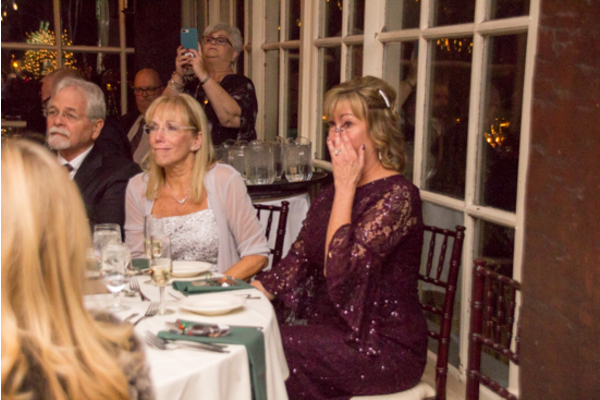 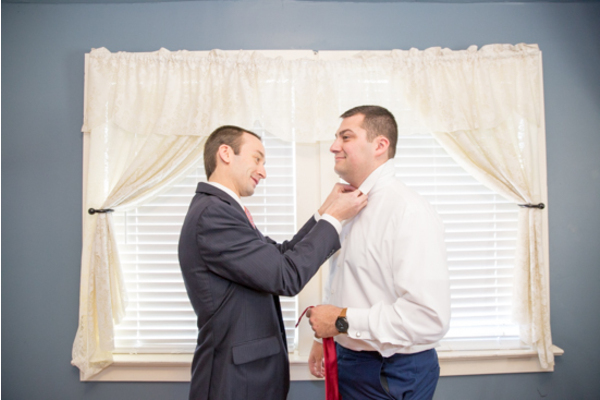 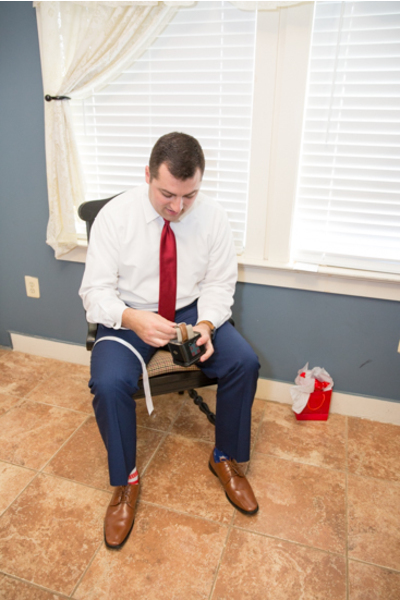 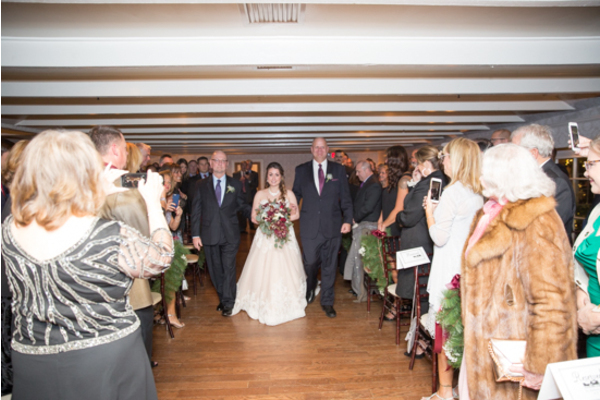 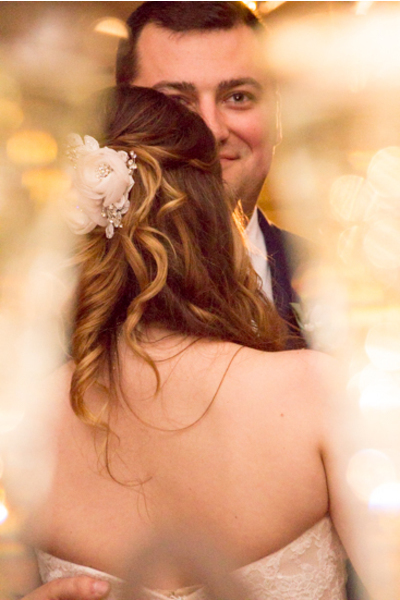 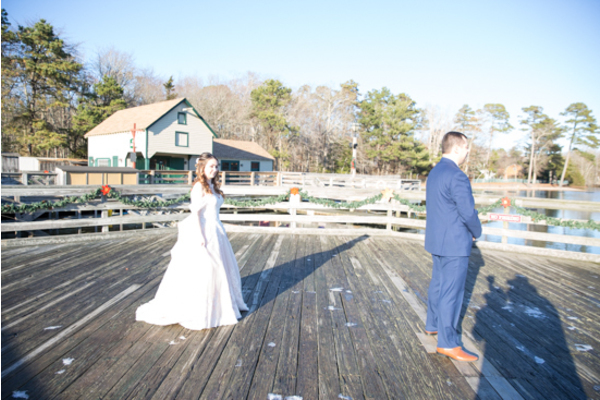 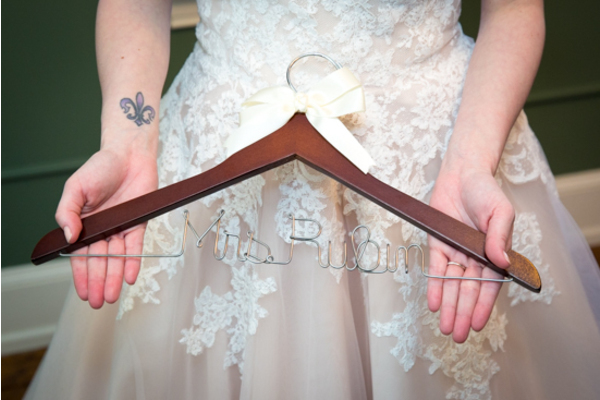 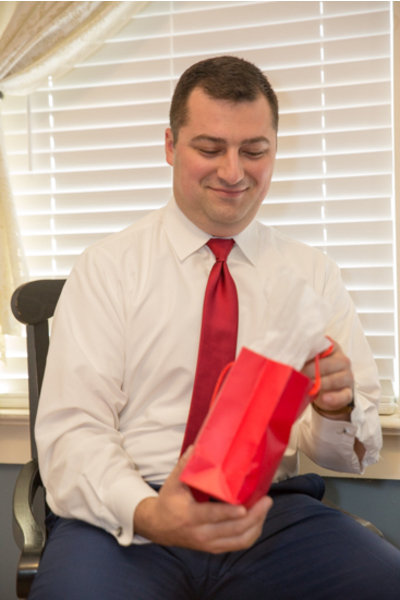 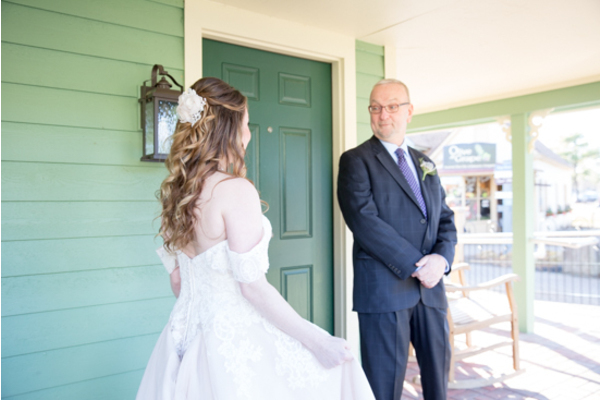 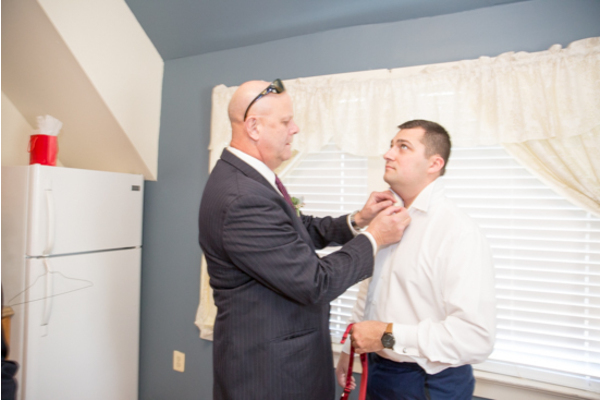 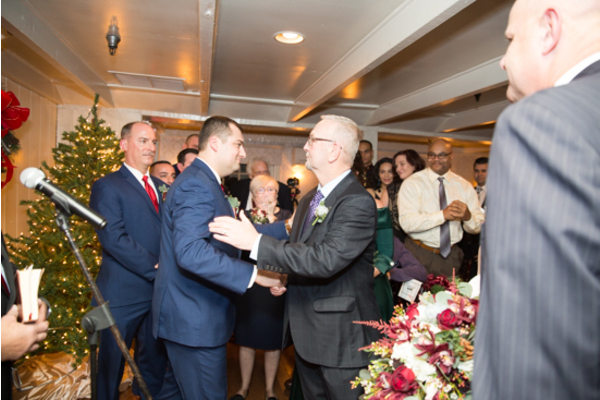 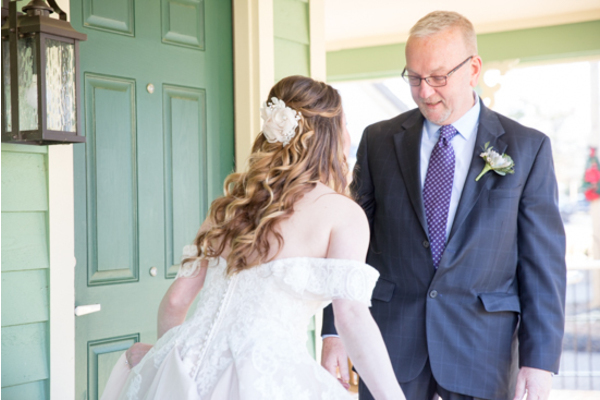 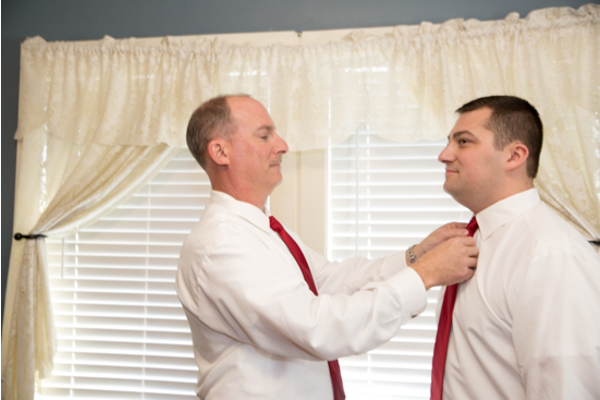 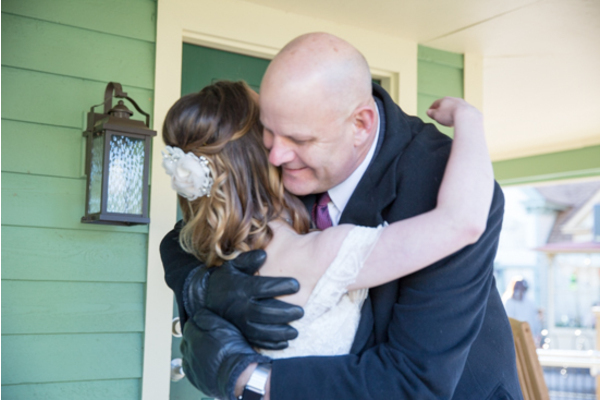 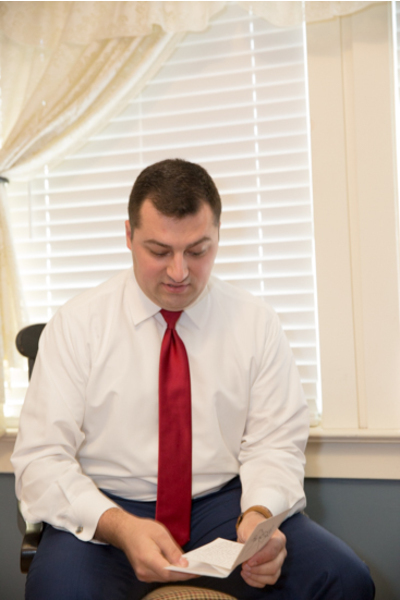 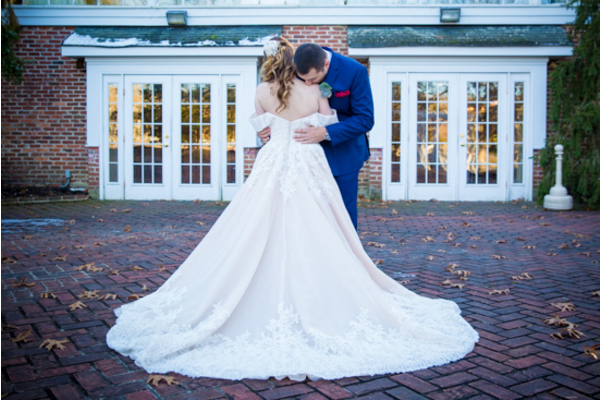 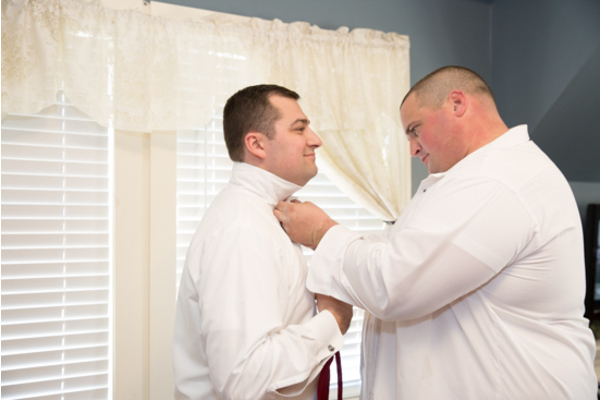 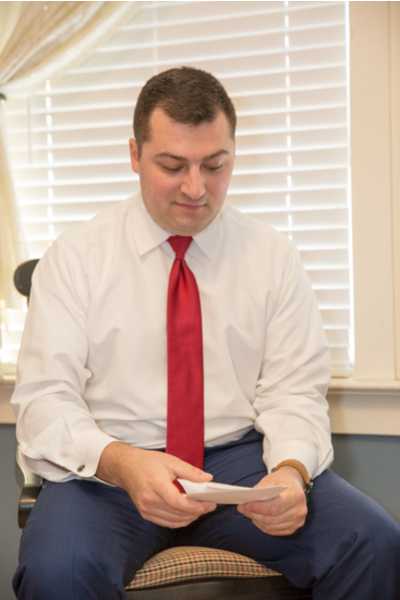 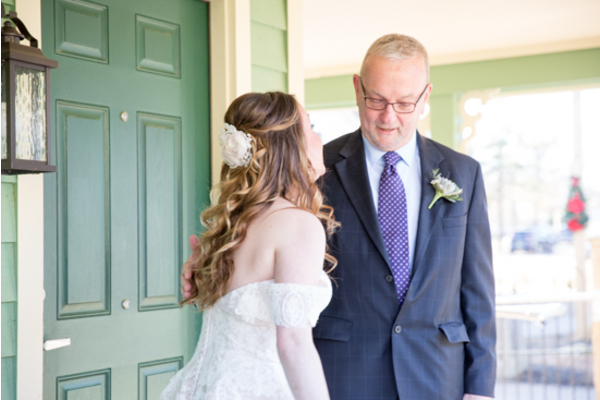 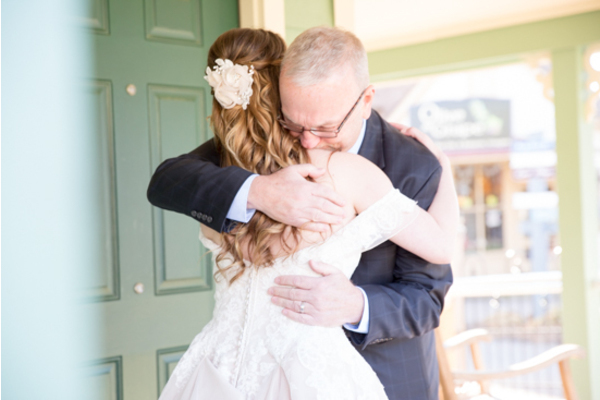 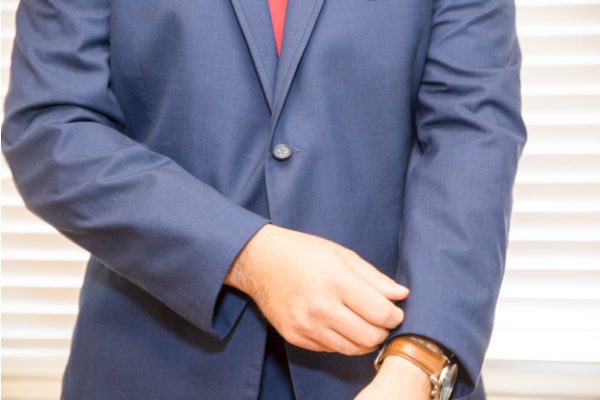 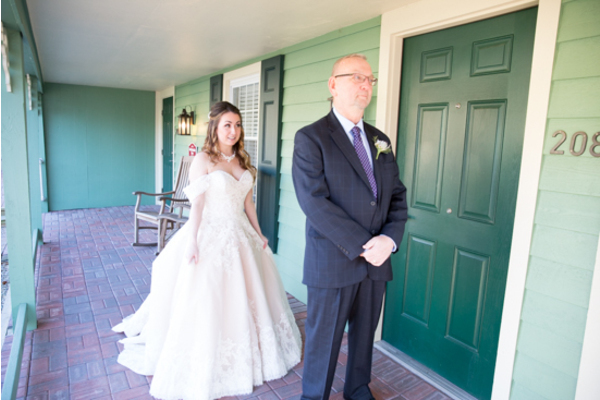 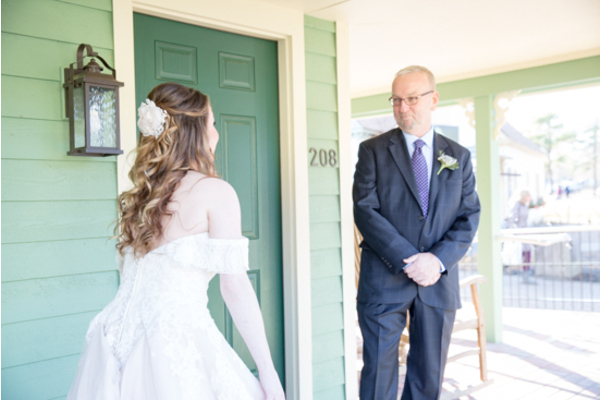 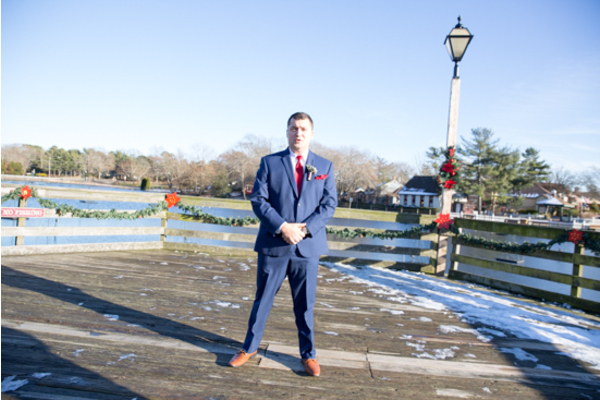 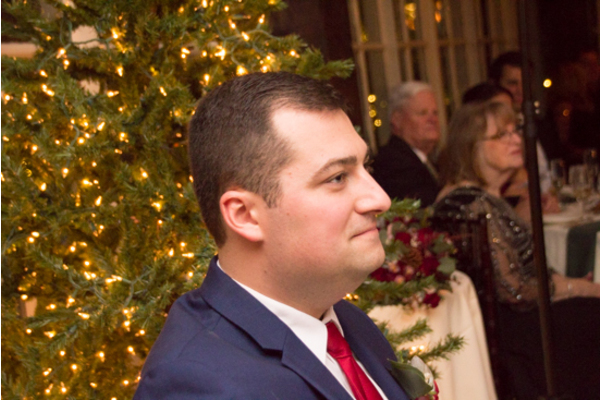 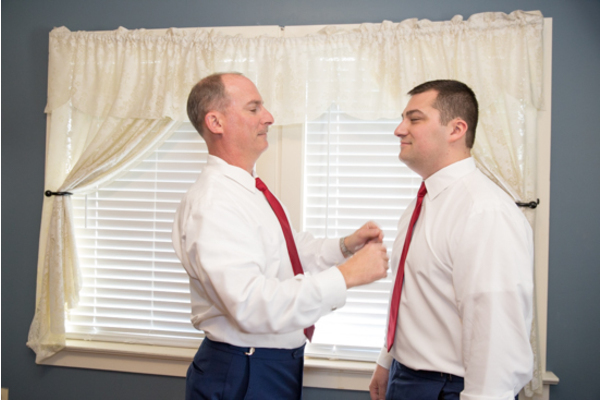 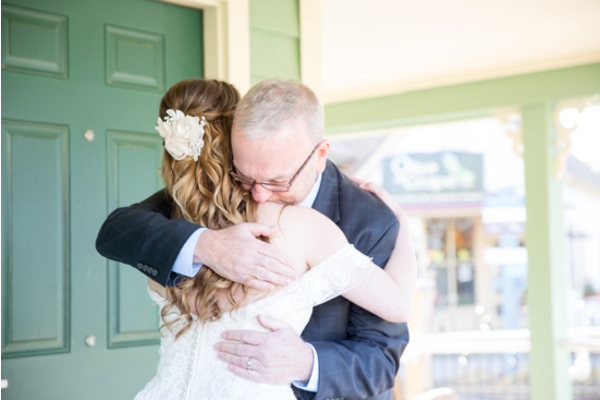 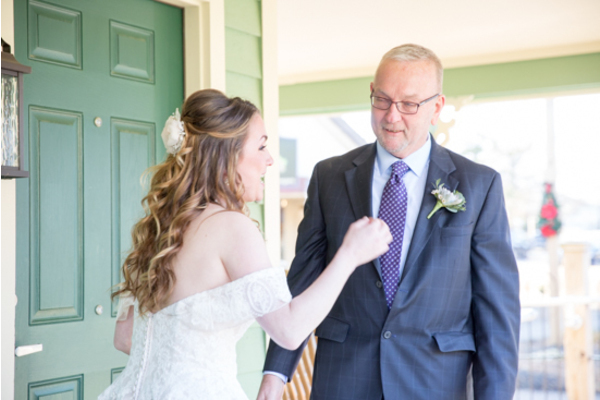 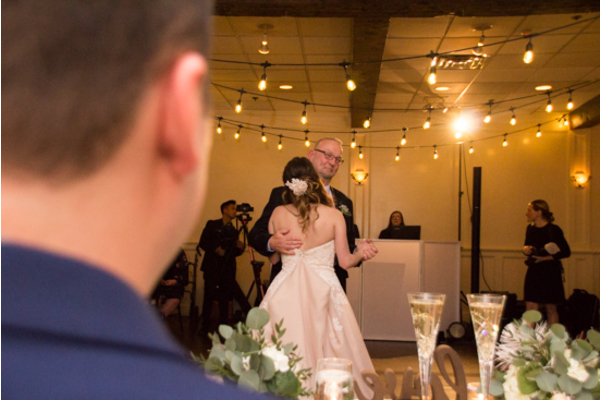 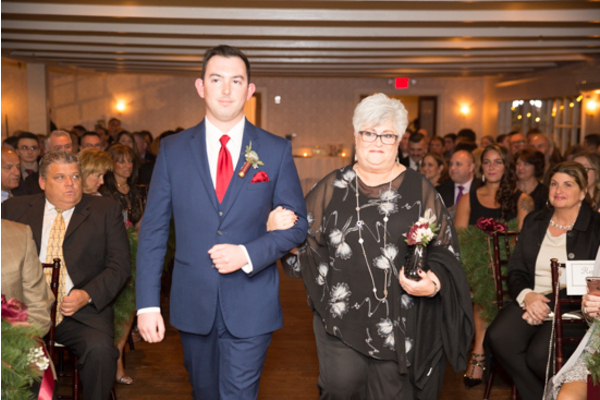 Our NJ Wedding Photographer captured the romantic first look of Jarrod seeing his bride. 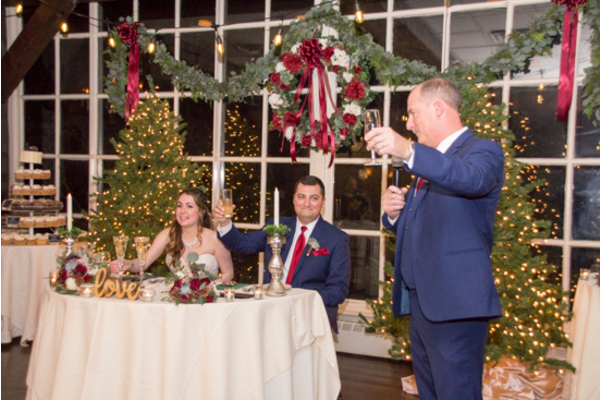 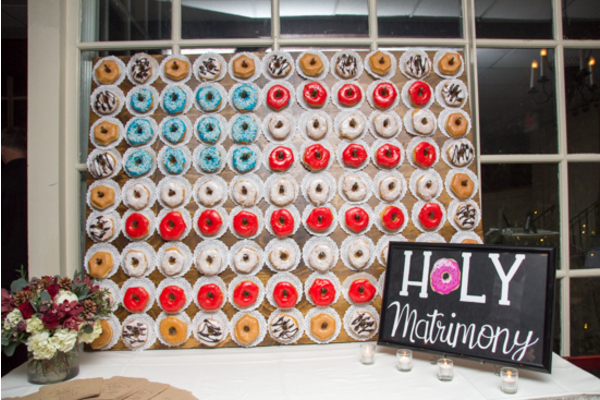 After the couple sealed the deal, it was time for the reception! 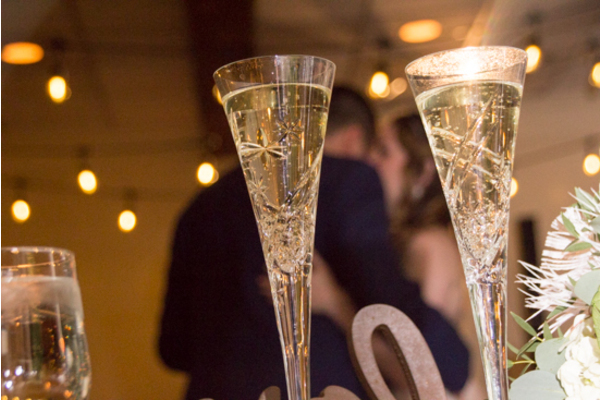 To kick off the party, the couple toasted with champagne flutes! 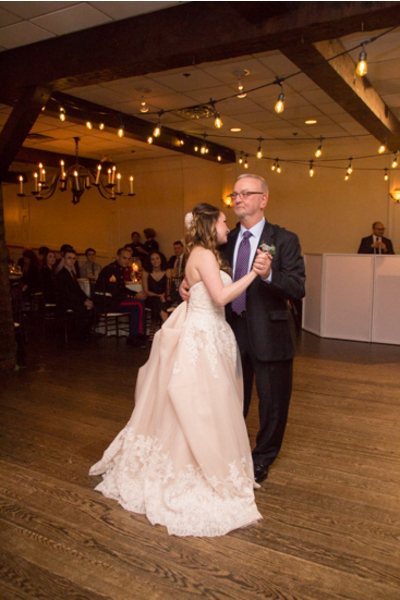 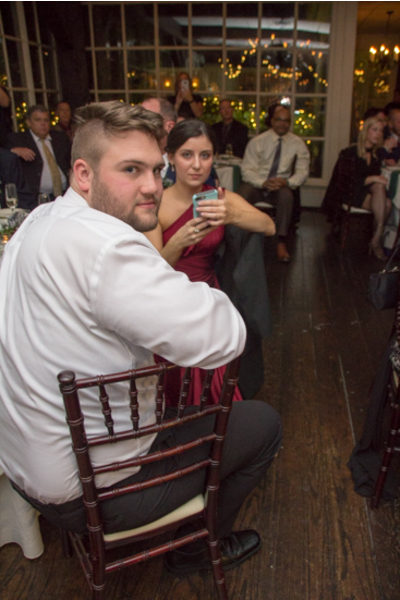 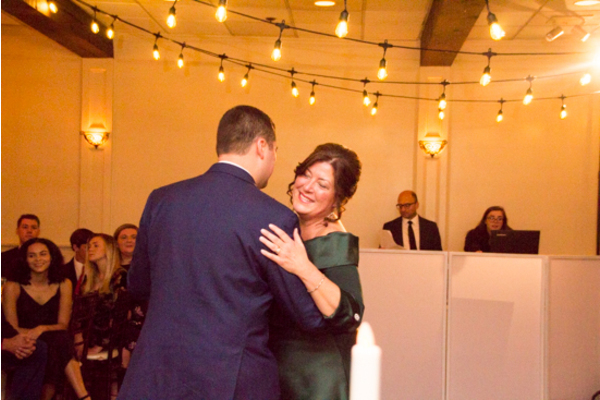 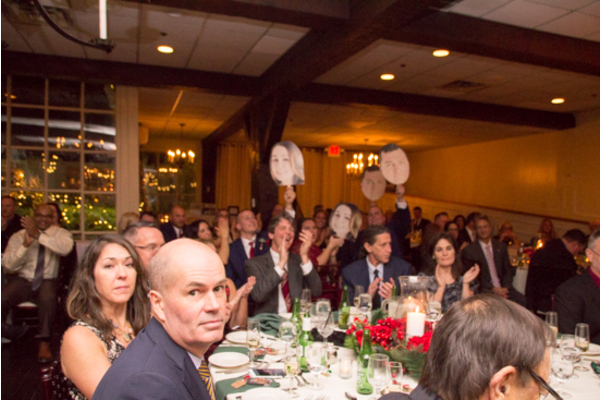 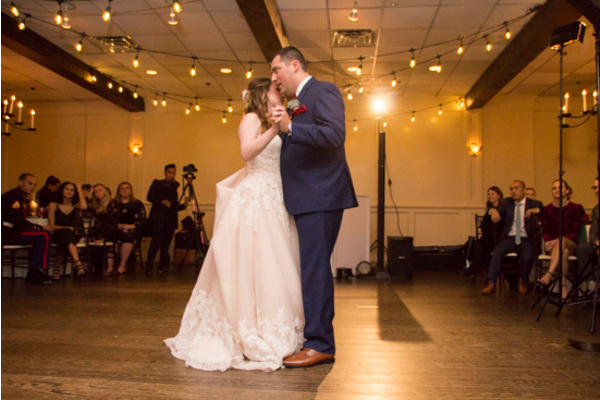 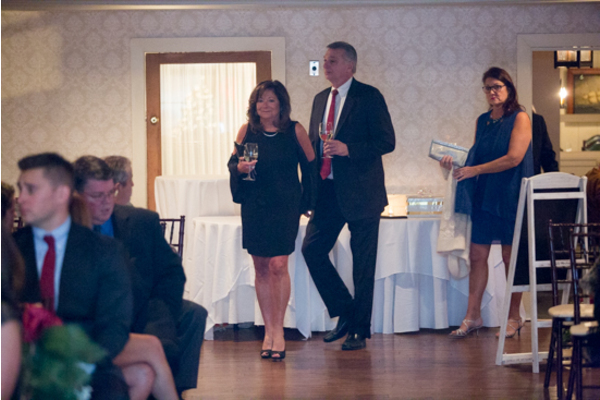 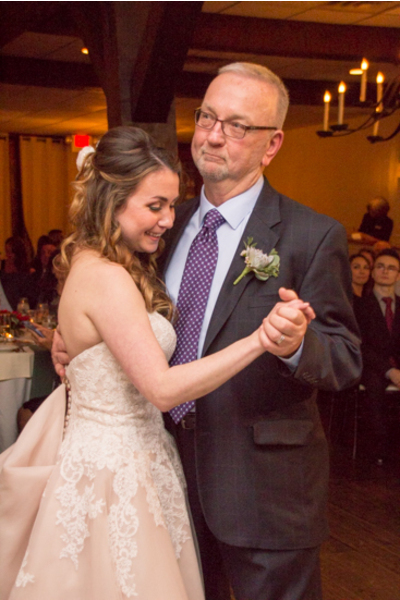 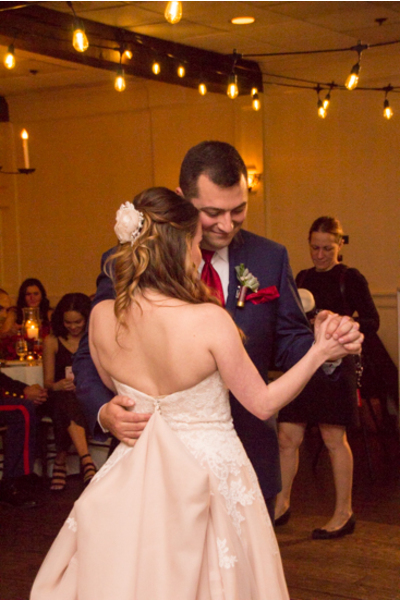 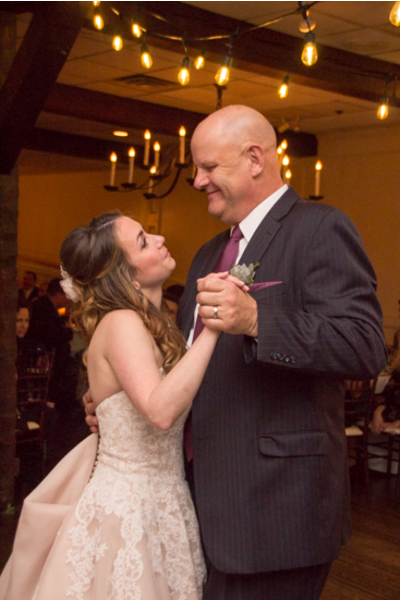 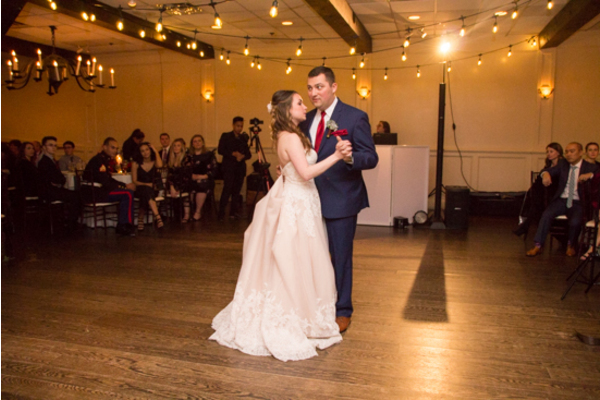 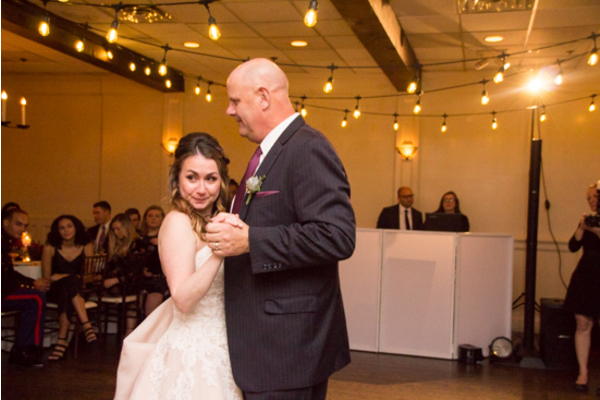 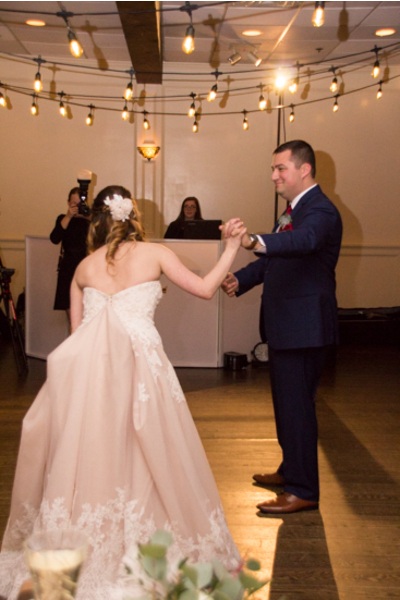 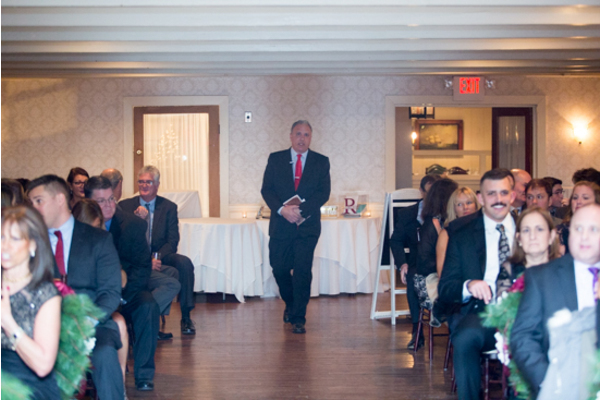 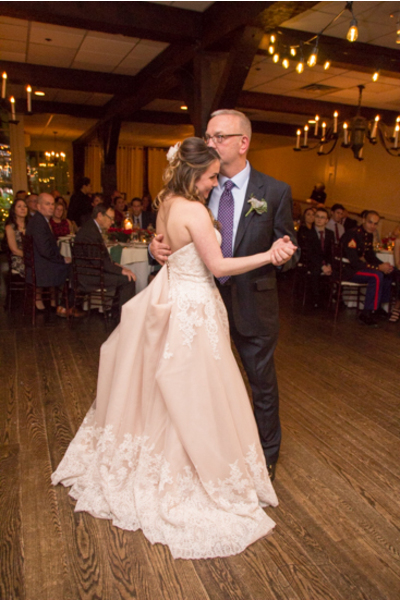 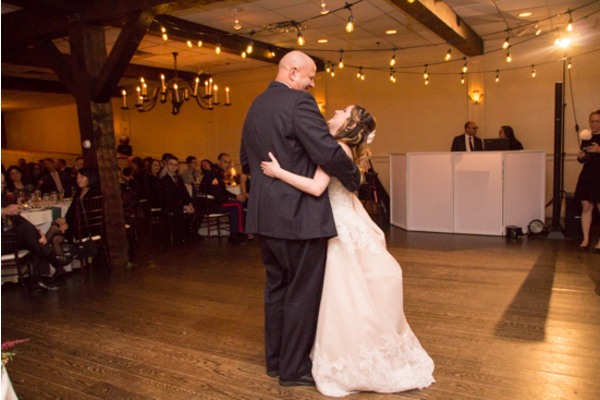 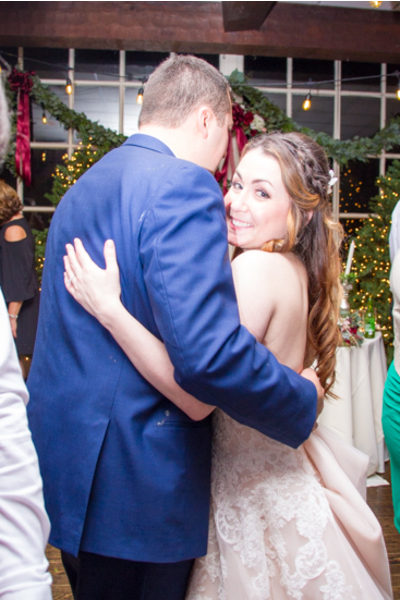 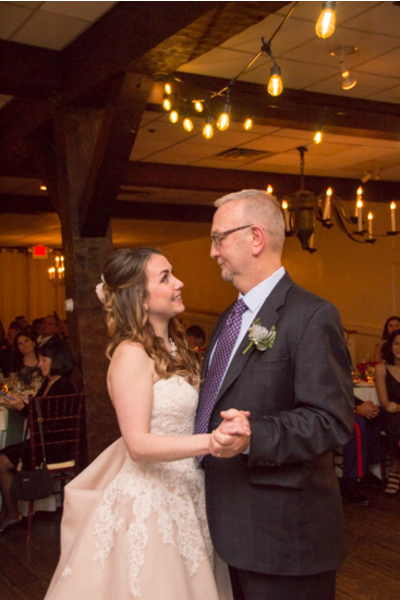 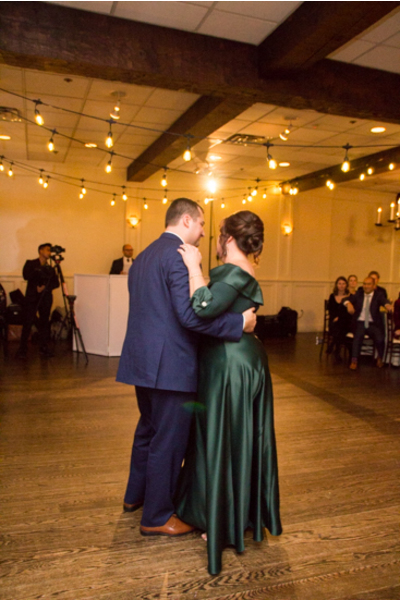 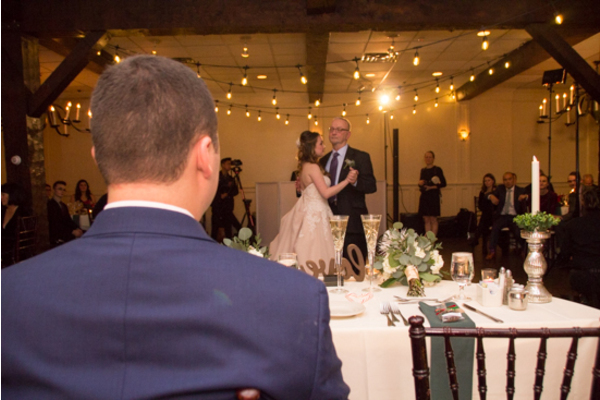 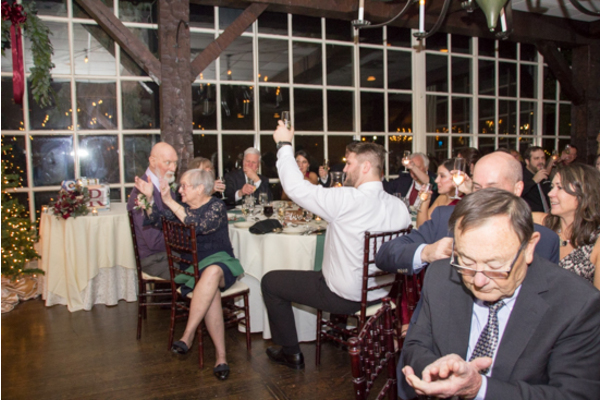 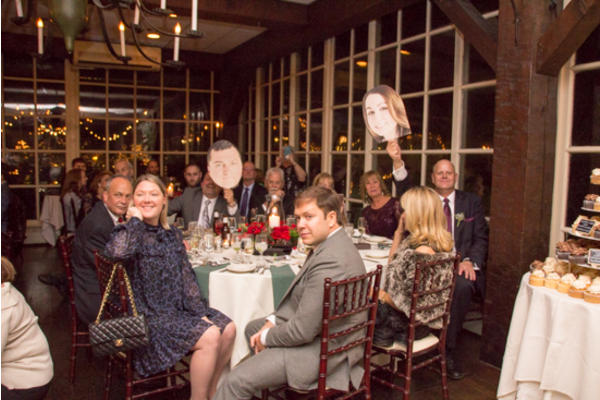 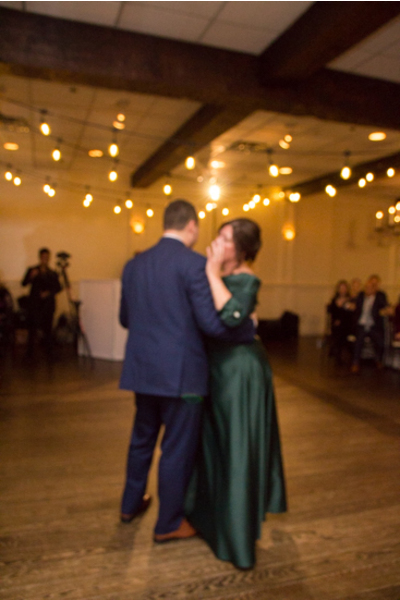 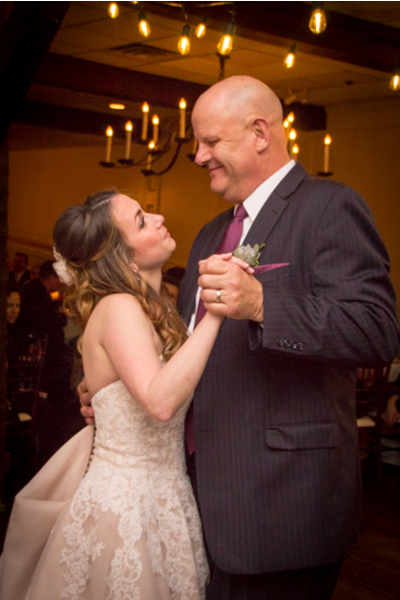 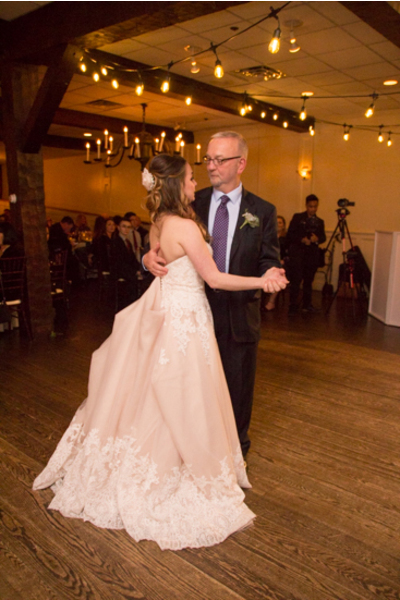 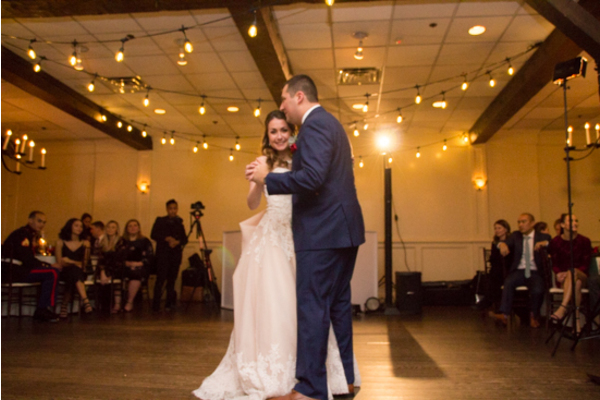 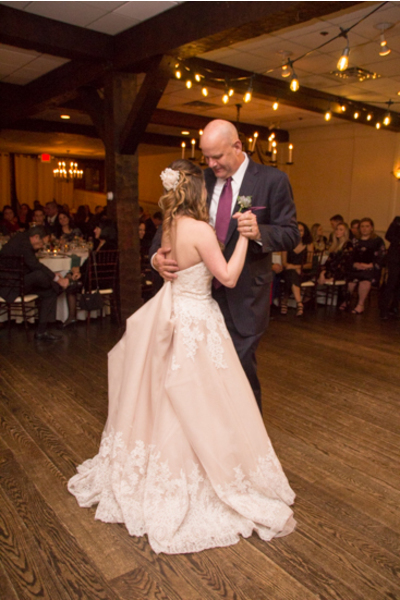 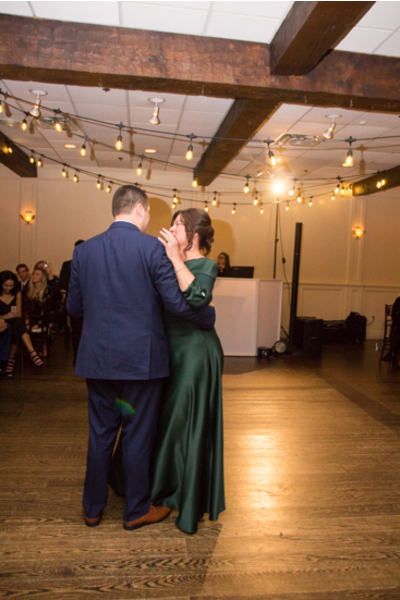 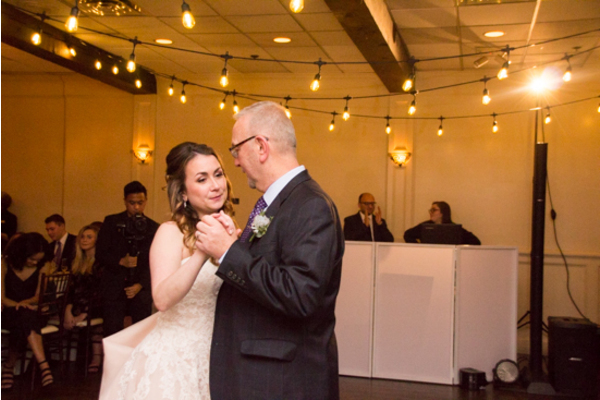 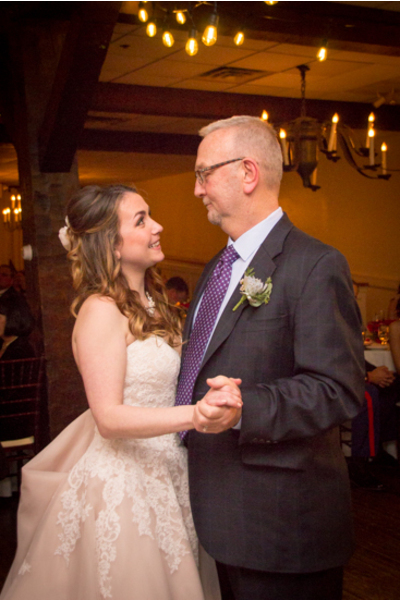 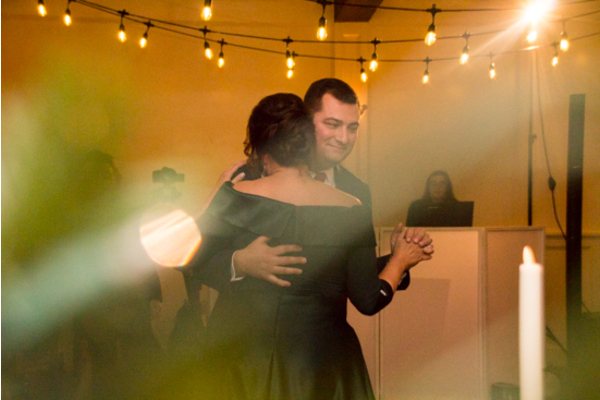 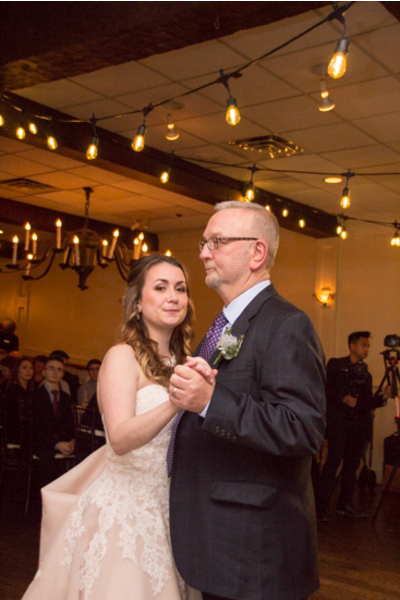 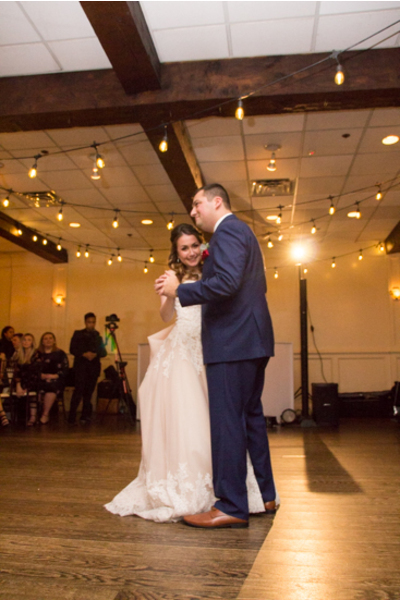 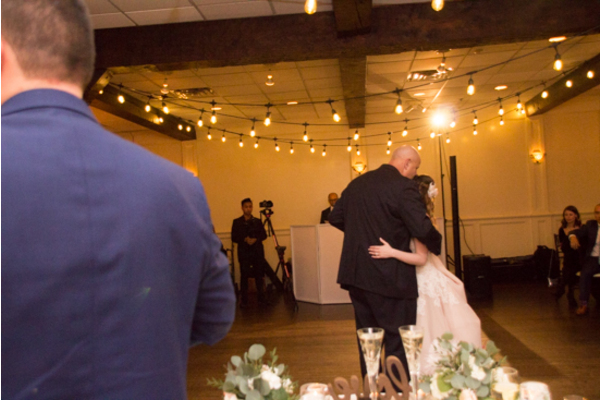 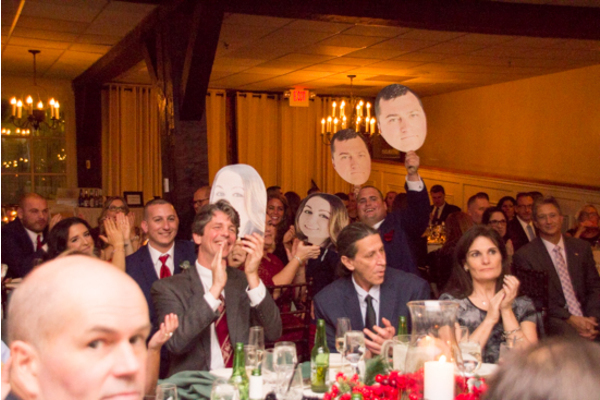 Later on, our NJ Wedding Photographer photographed guests having a blast on the dance floor! Overall, the wedding was truly amazing, and we are grateful to have been a part of such an unforgettable night! 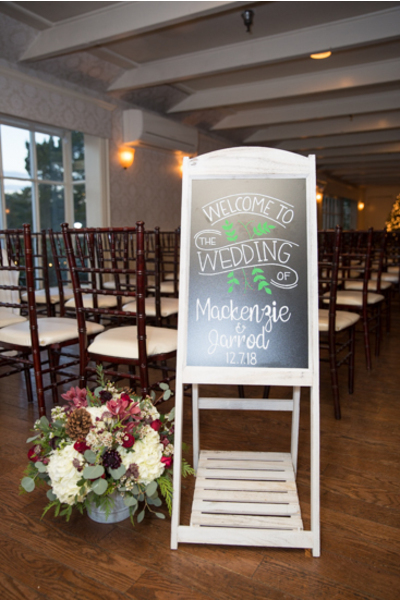 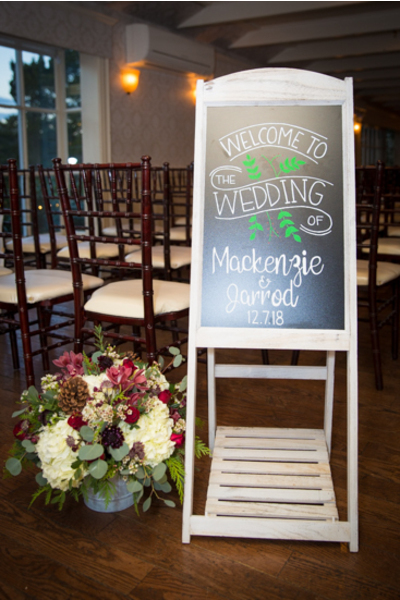 Congratulations, again, to Mackenzie and Jarrod. 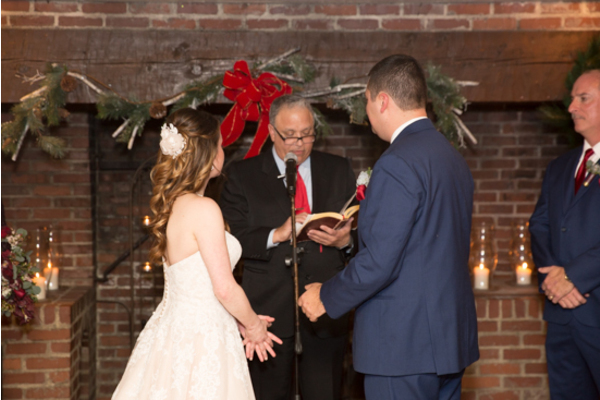 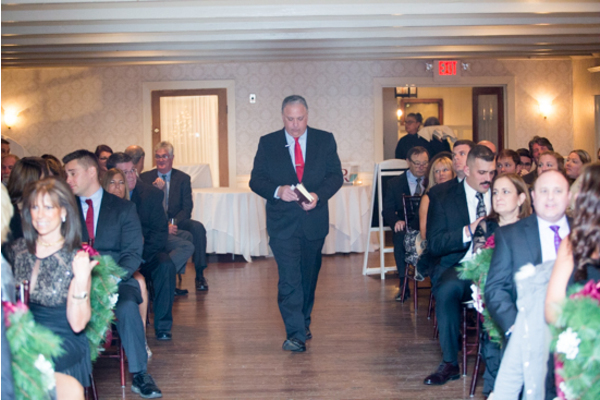 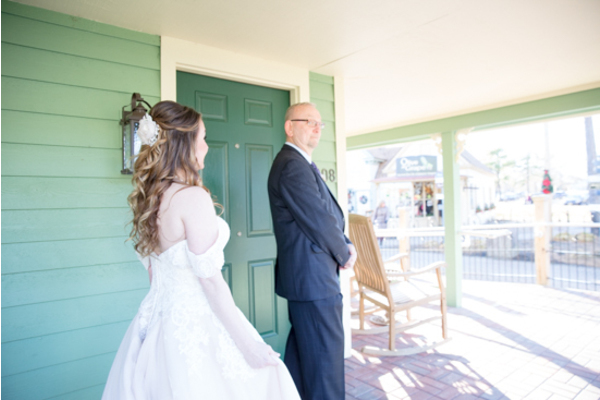 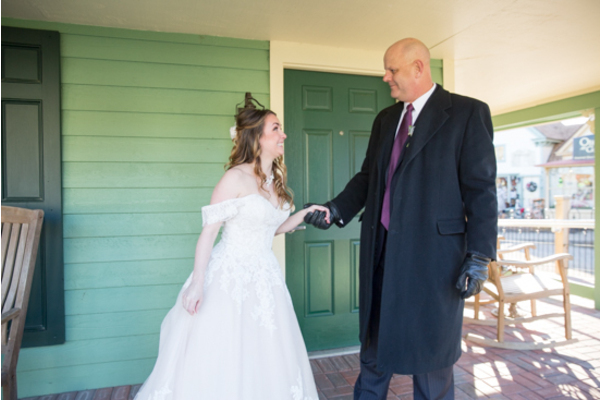 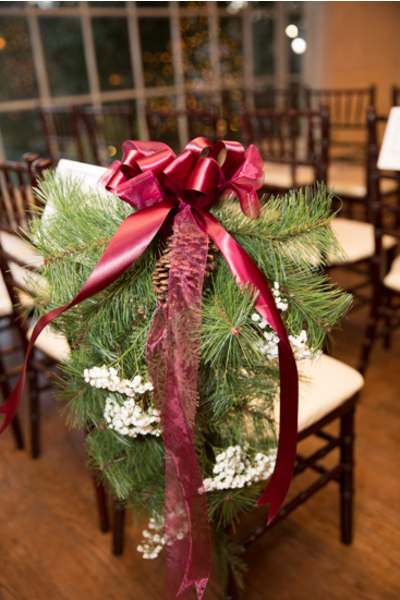 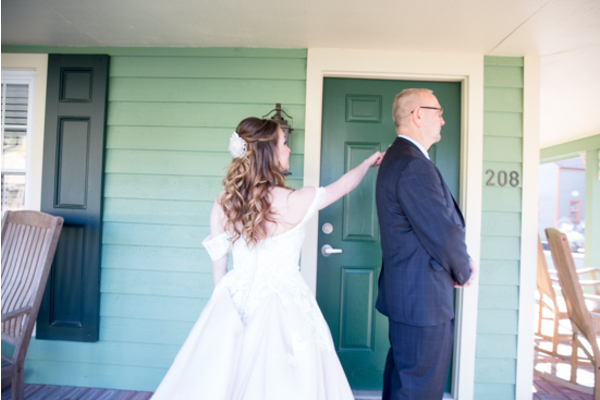 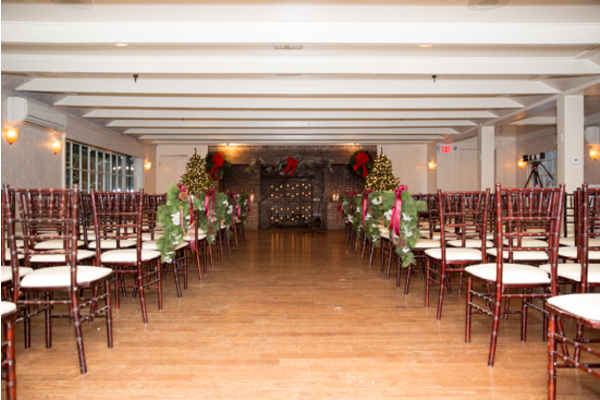 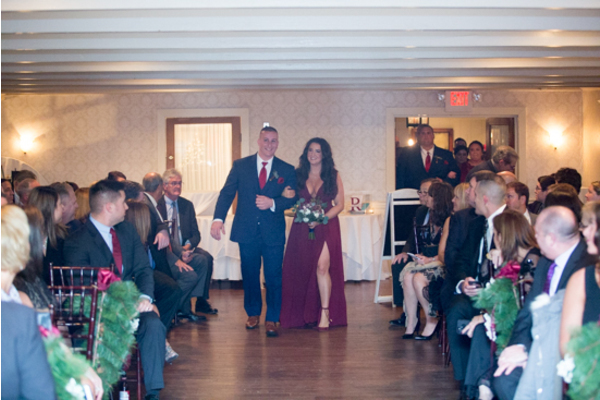 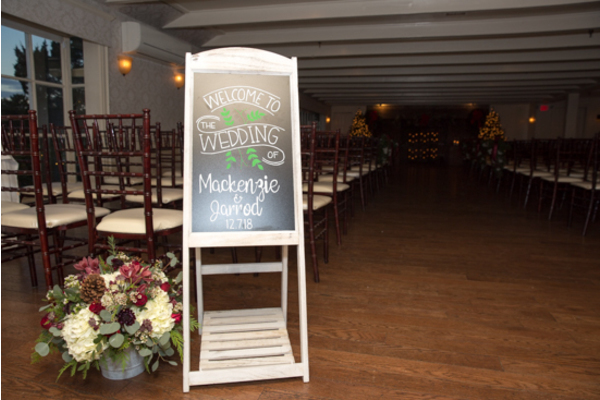 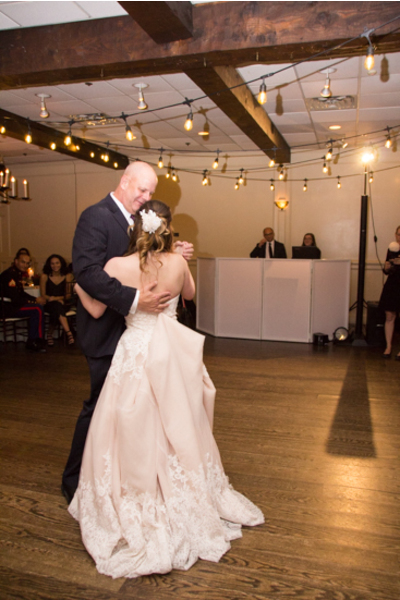 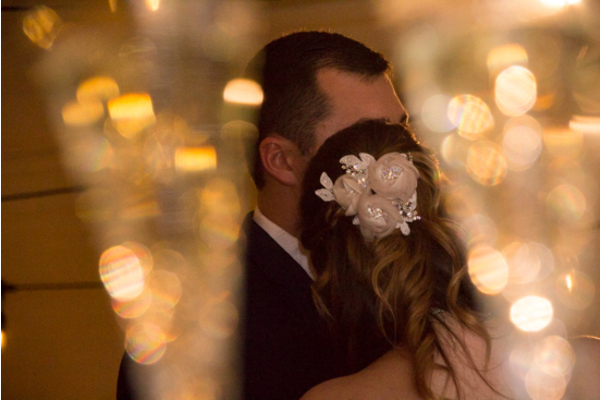 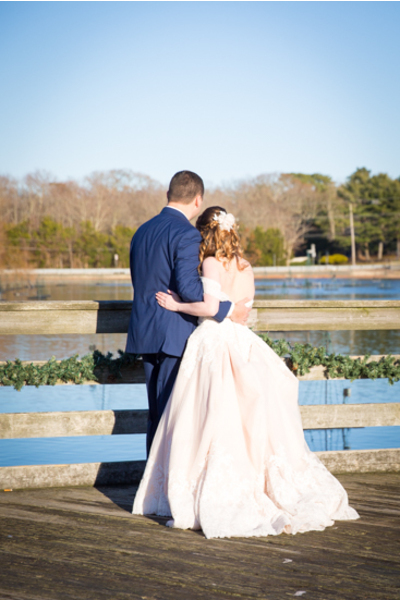 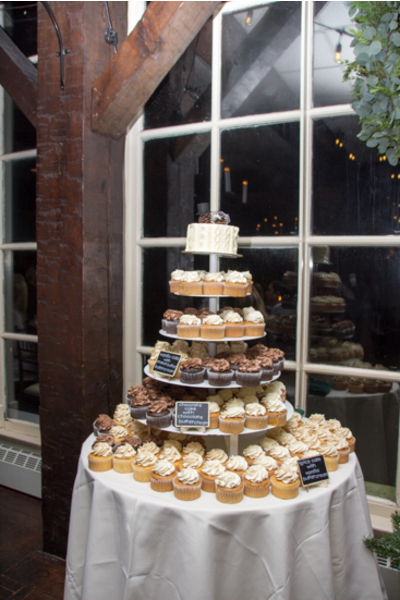 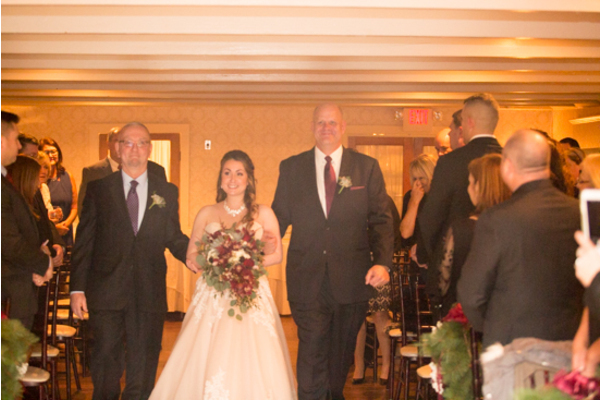 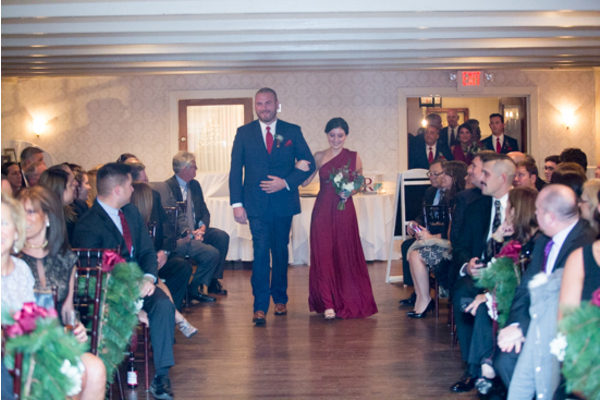 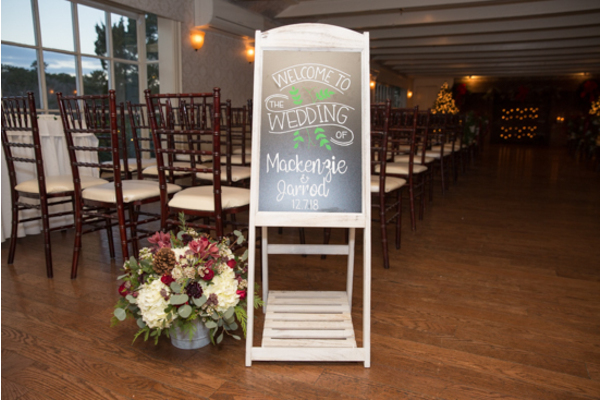 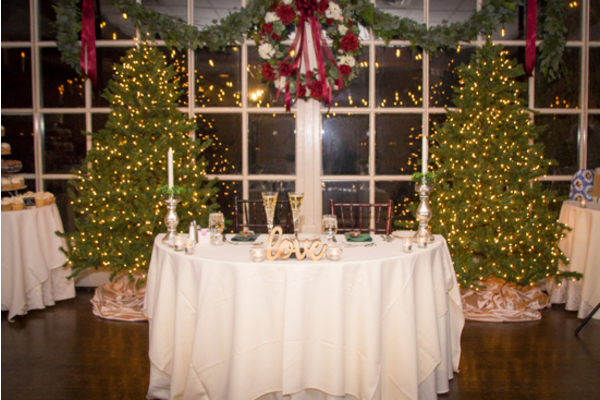 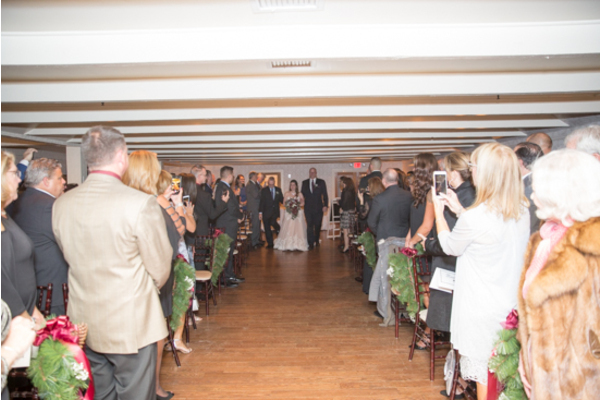 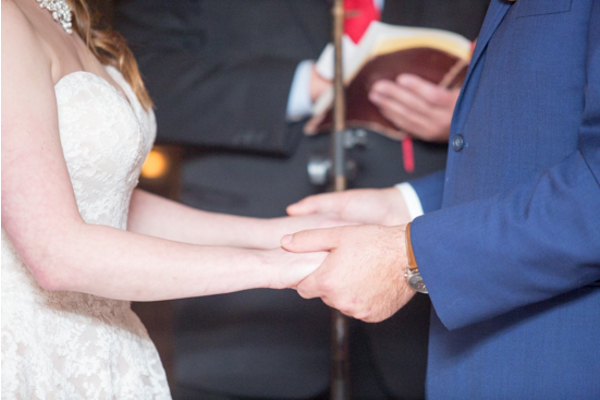 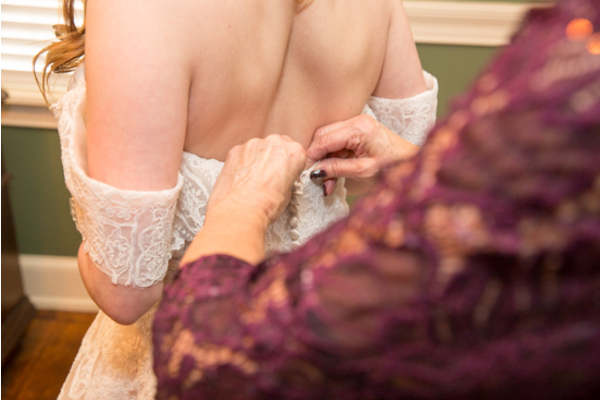 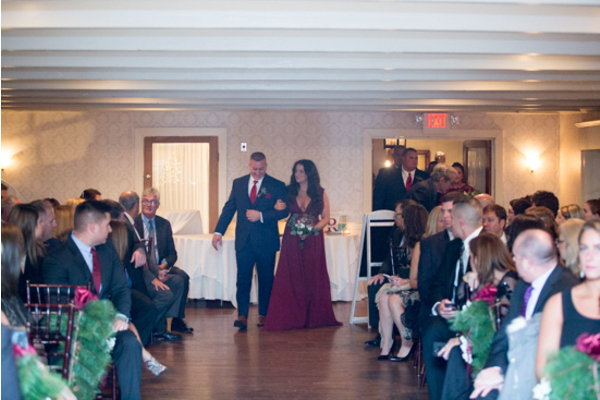 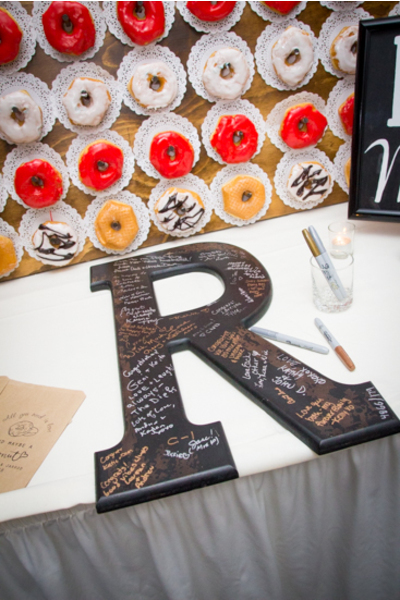 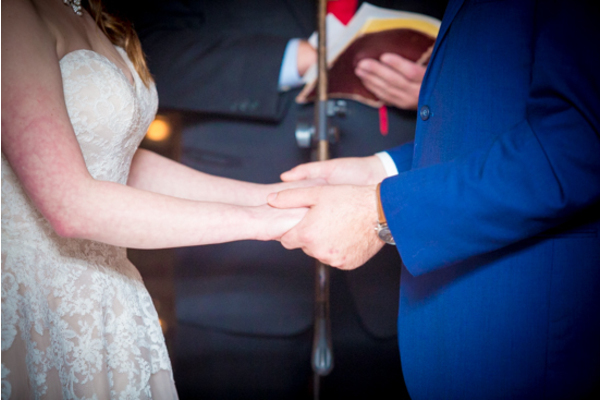 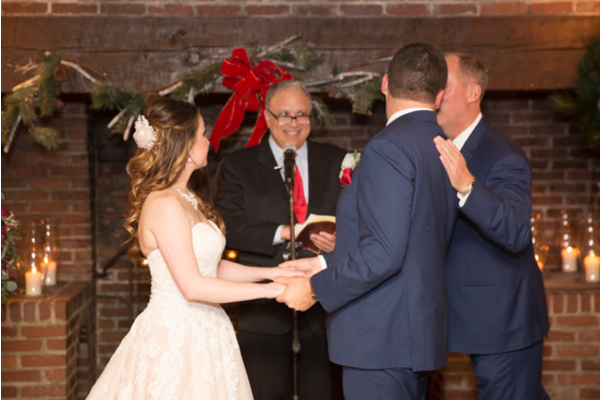 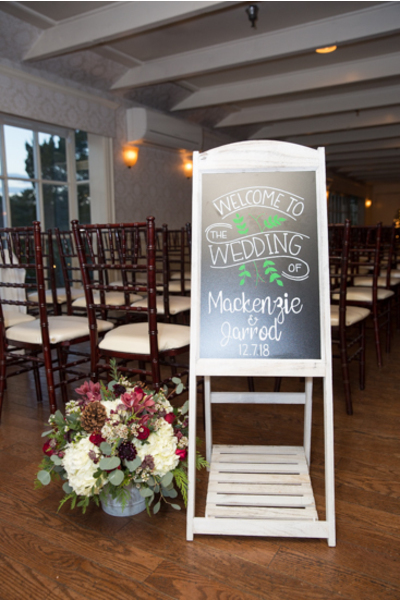 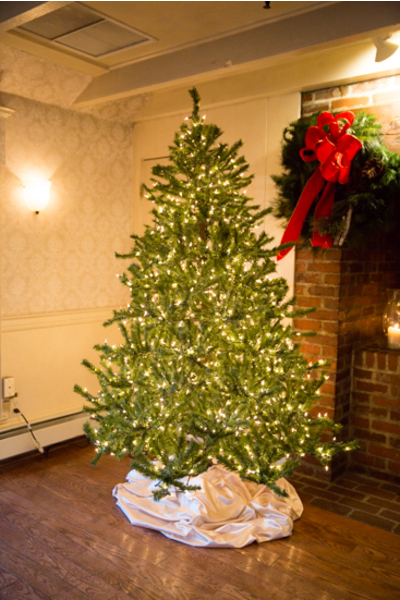 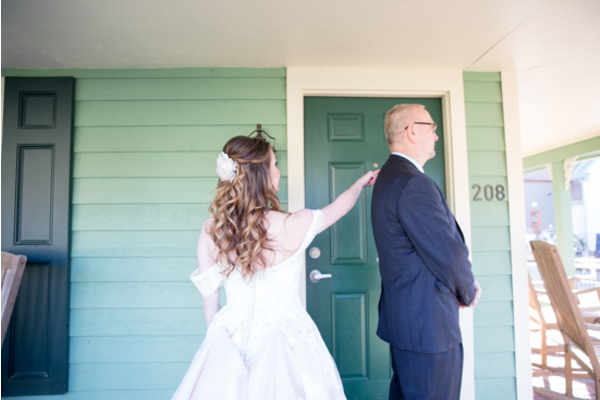 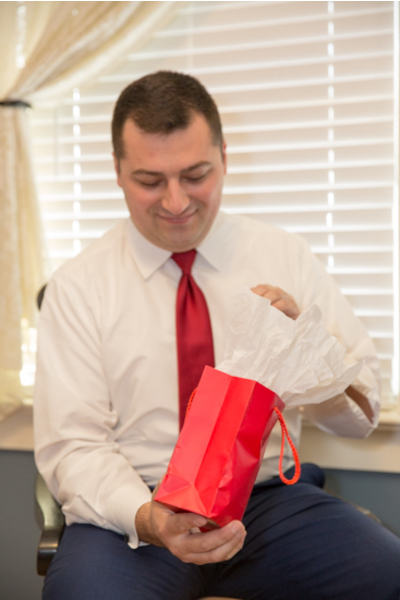 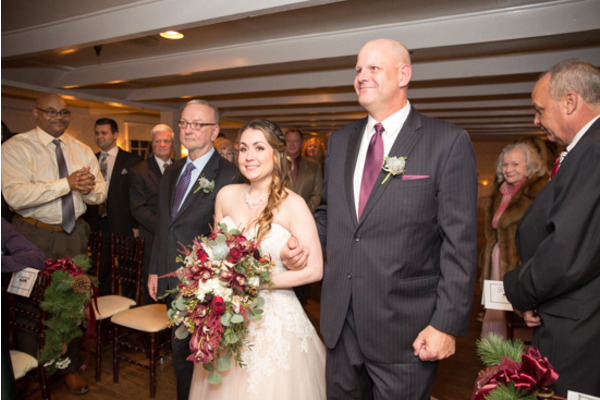 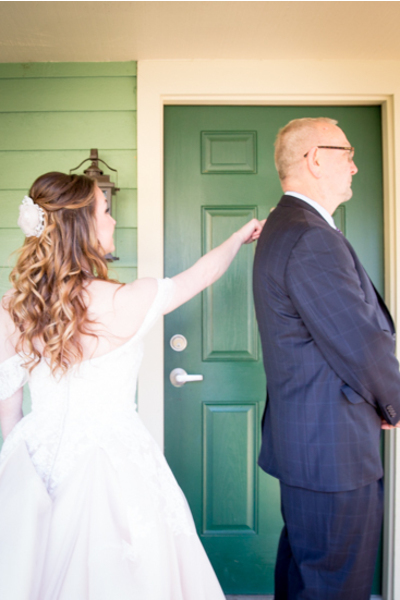 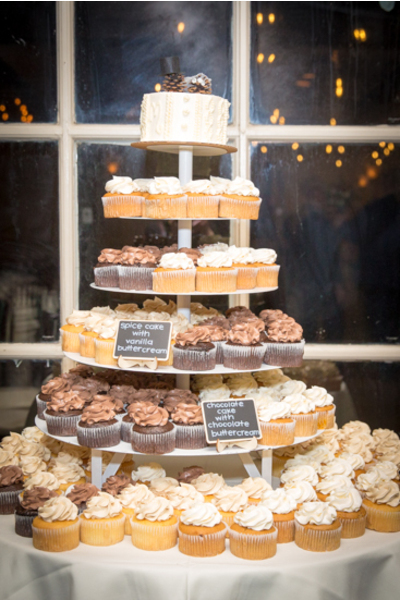 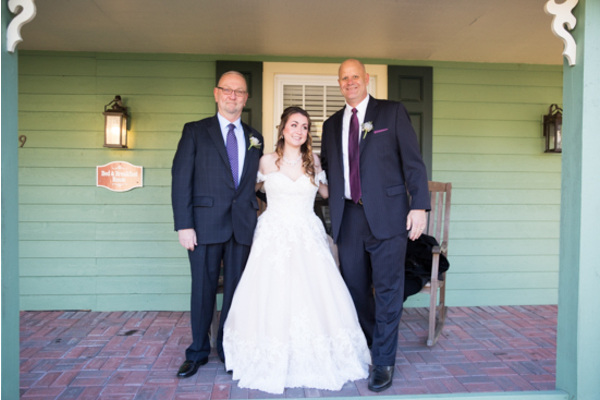 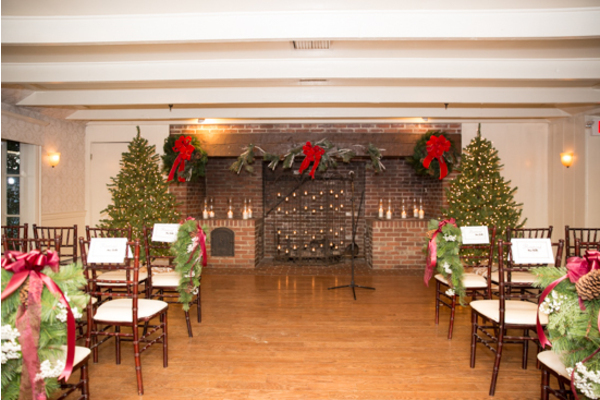 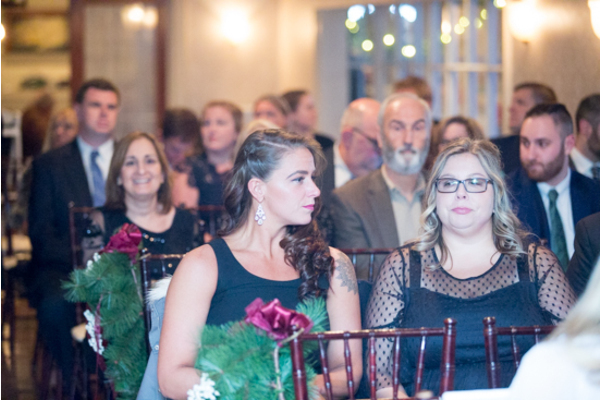 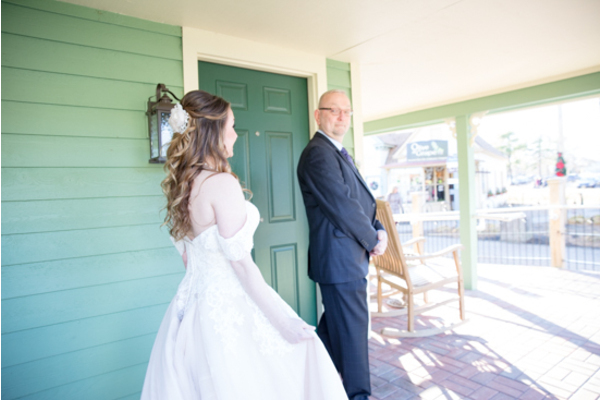 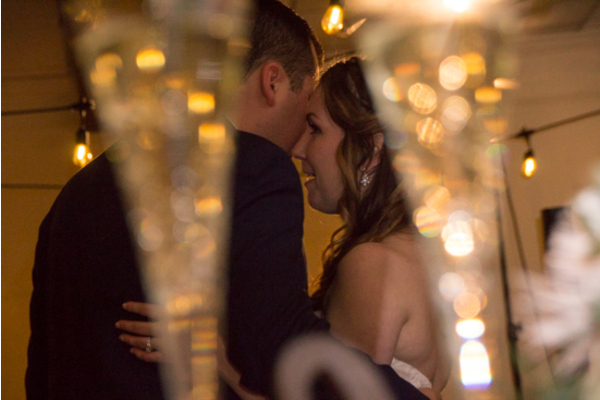 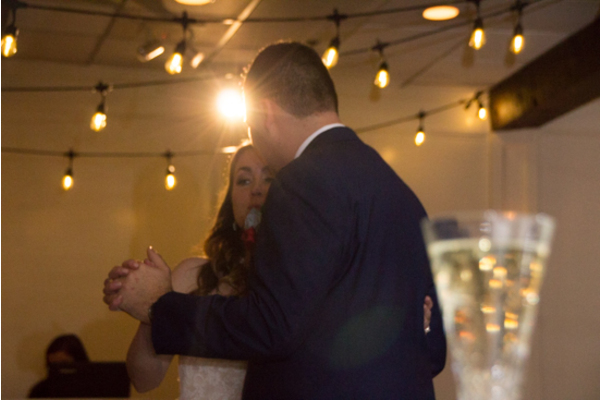 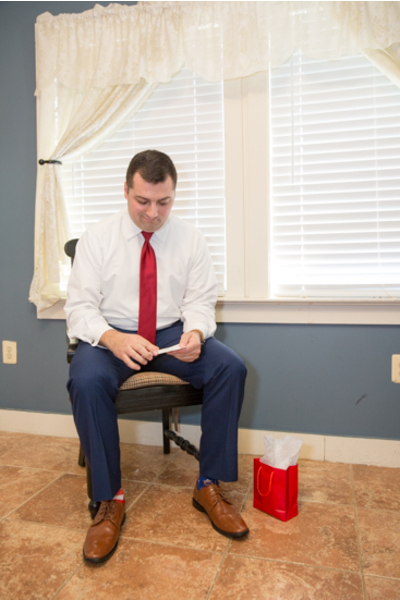 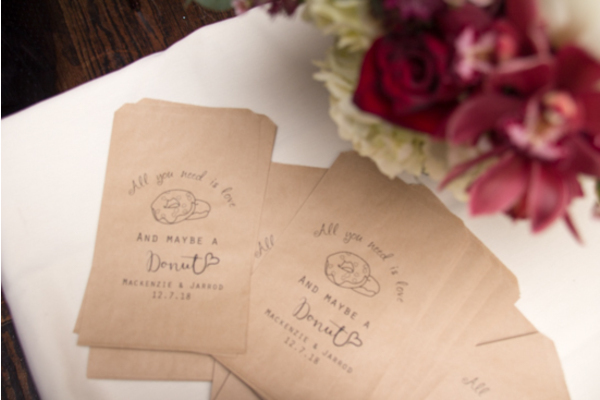 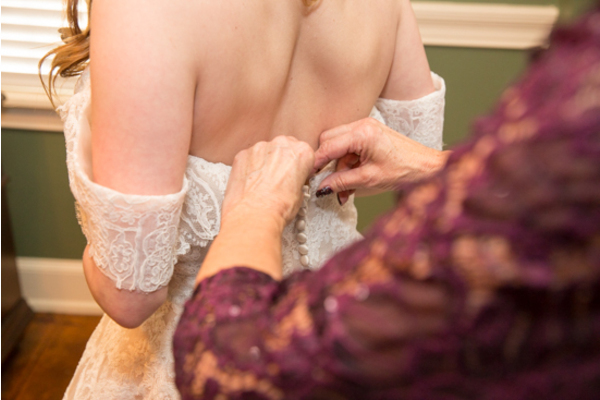 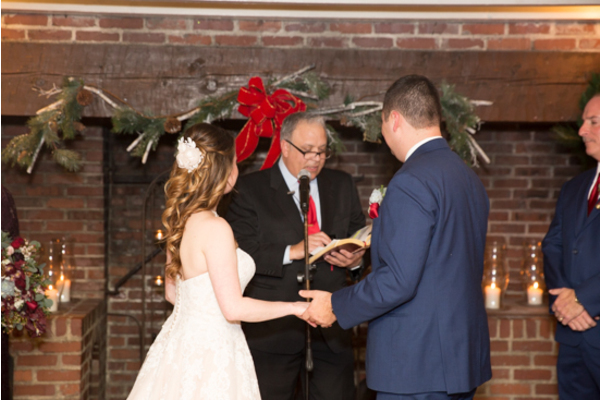 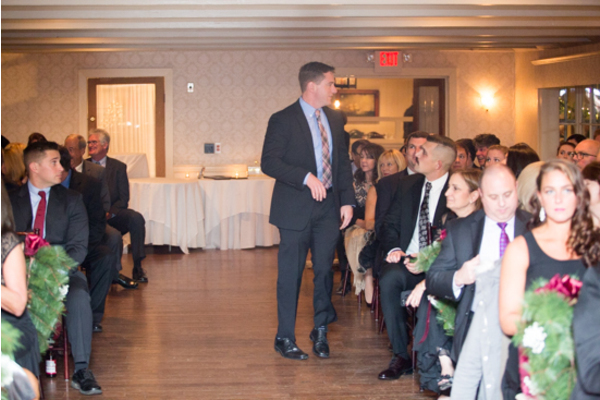 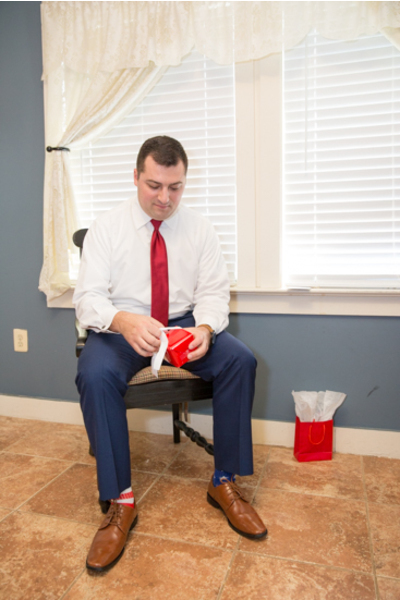 We hope your wedding at Smithville Inn made all of your holiday wishes come true!